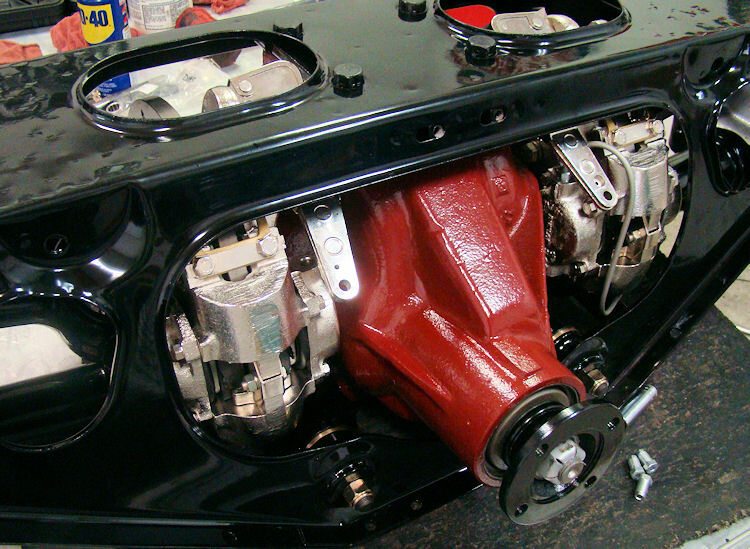 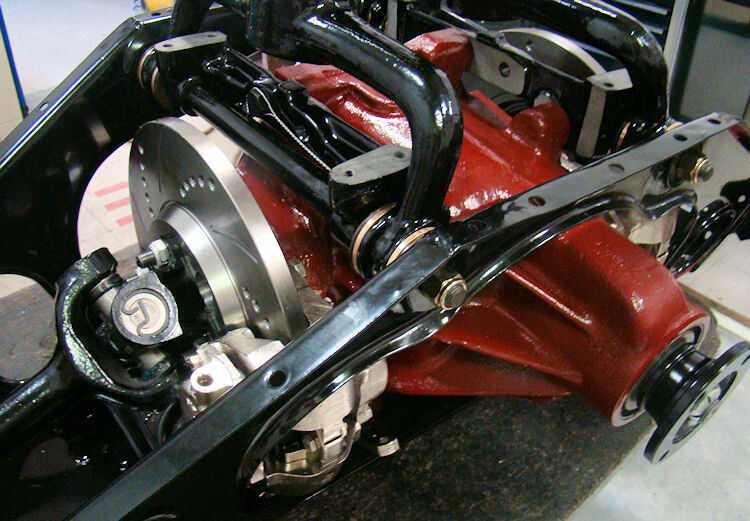 Engine, transmission, headers and Webers installed. 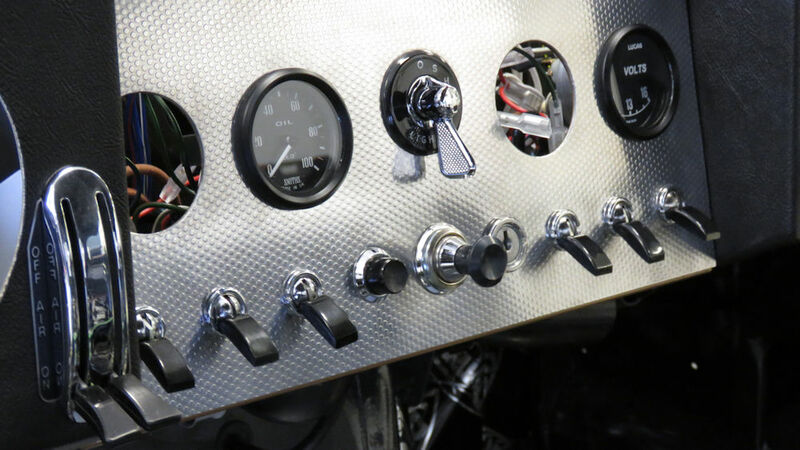 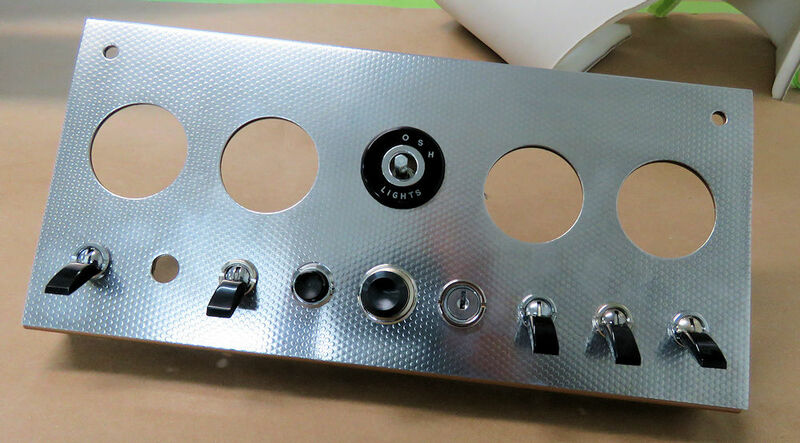 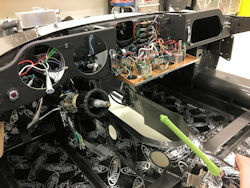 Wiring the dash and gauges, starting to install chrome and lights. 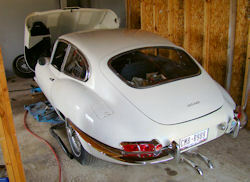 Your car is now back on its wheels, almost time to install the engine and transmission. 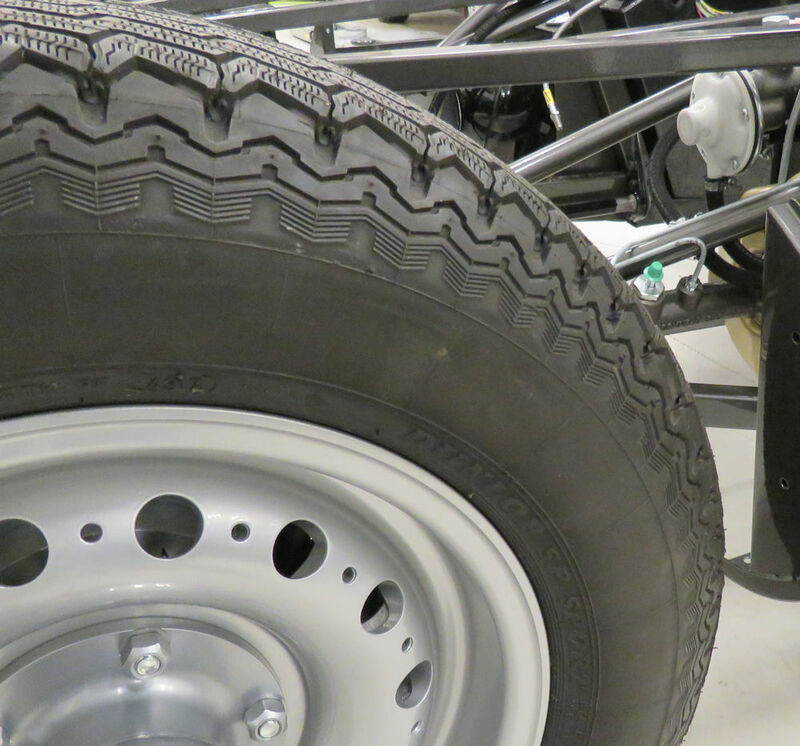 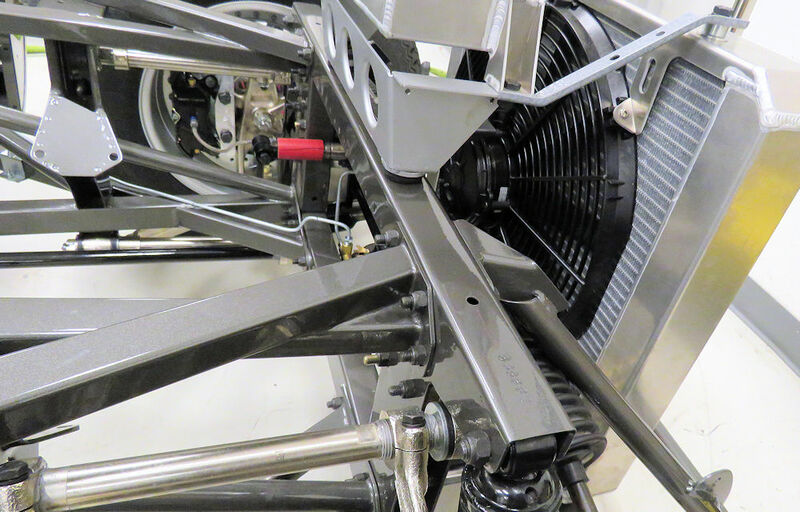 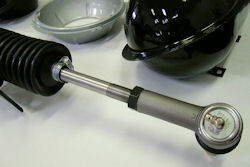 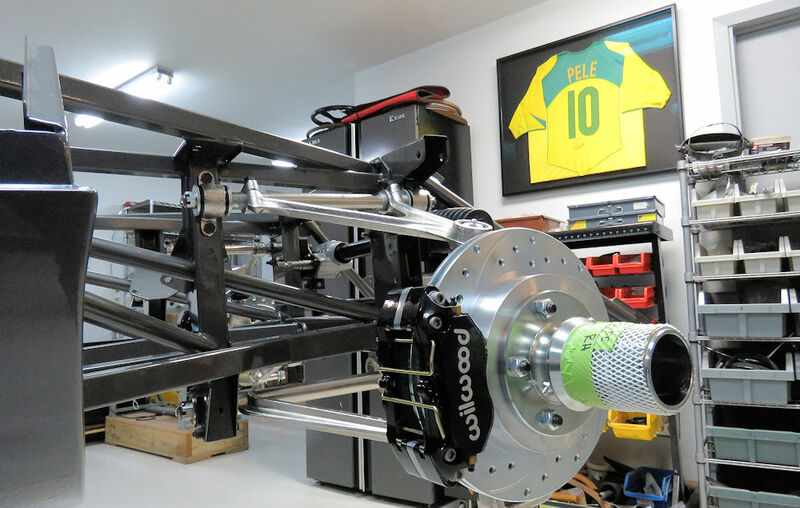 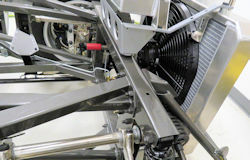 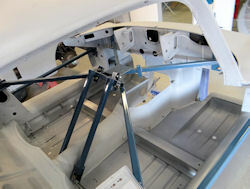 Installing front suspension, brakes and steering. 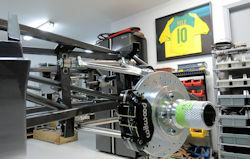 Work being done under Pele's watchful eyes! 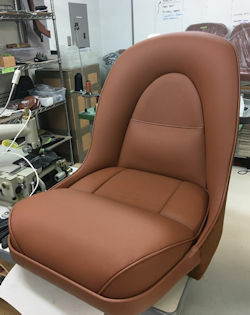 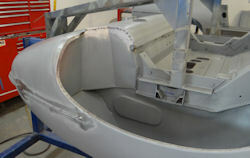 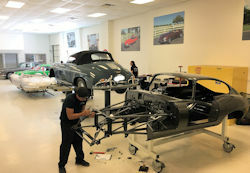 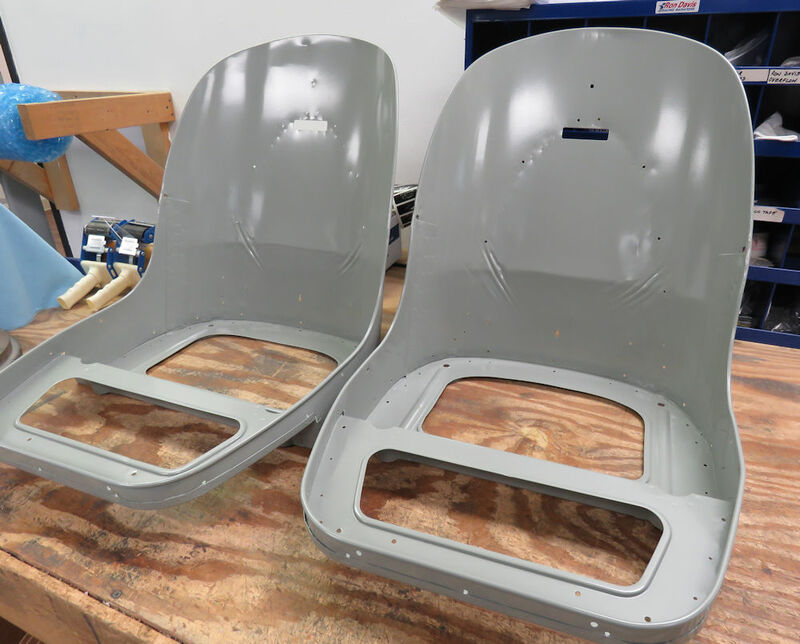 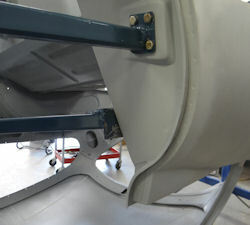 Installing engine frames and trimming the seats. 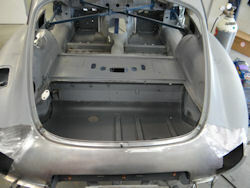 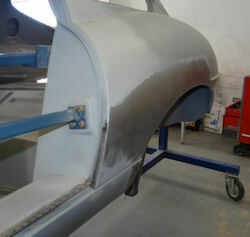 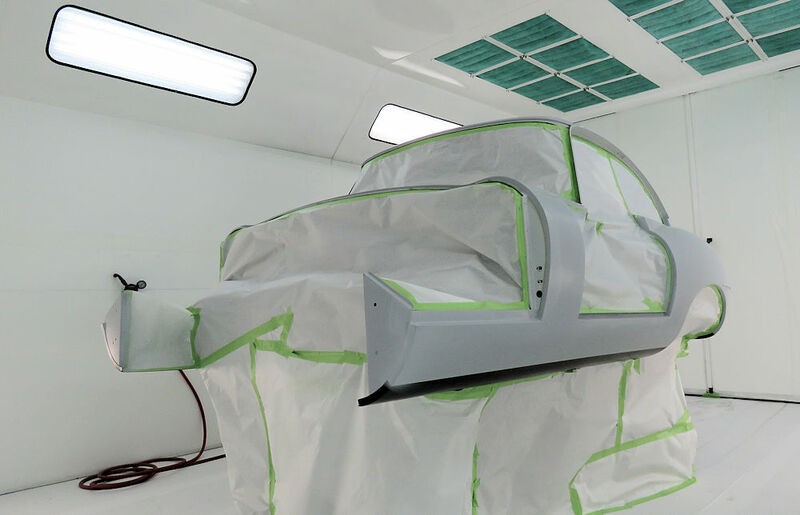 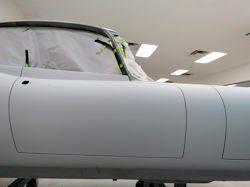 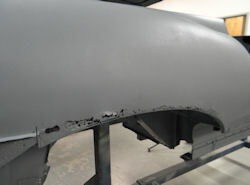 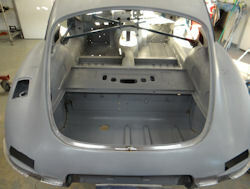 I am delighted to report that we have now completed the process of painting the body, bonnet, doors and tailgate. 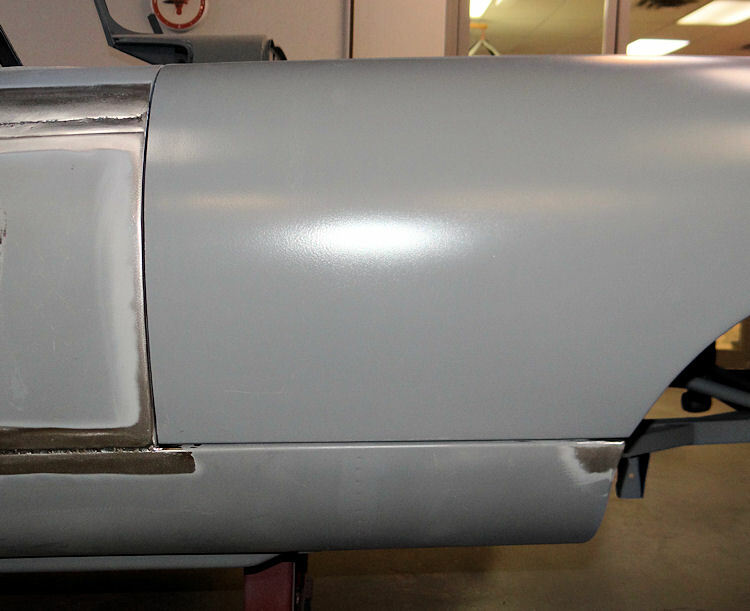 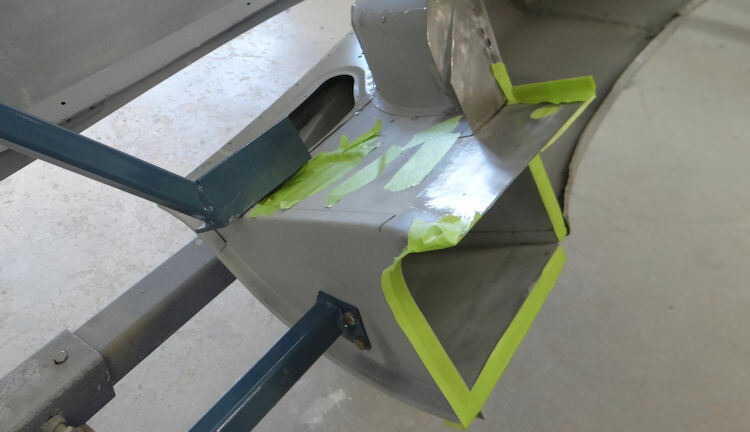 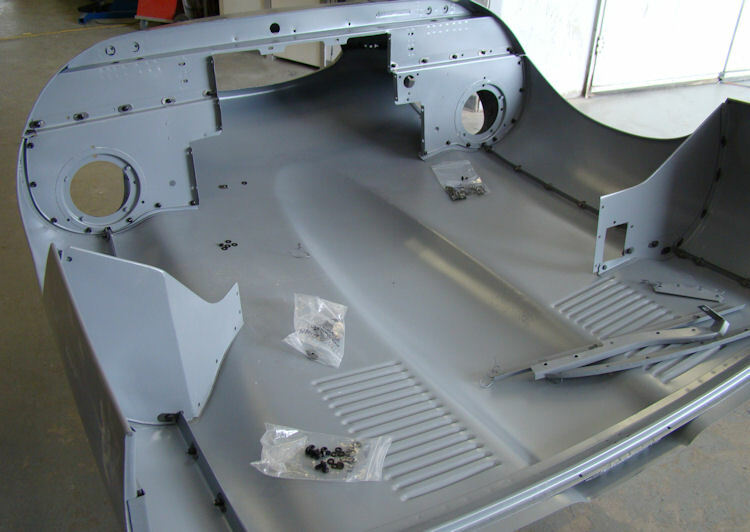 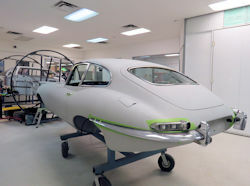 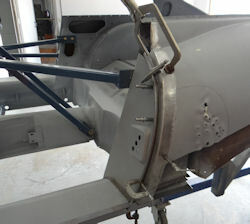 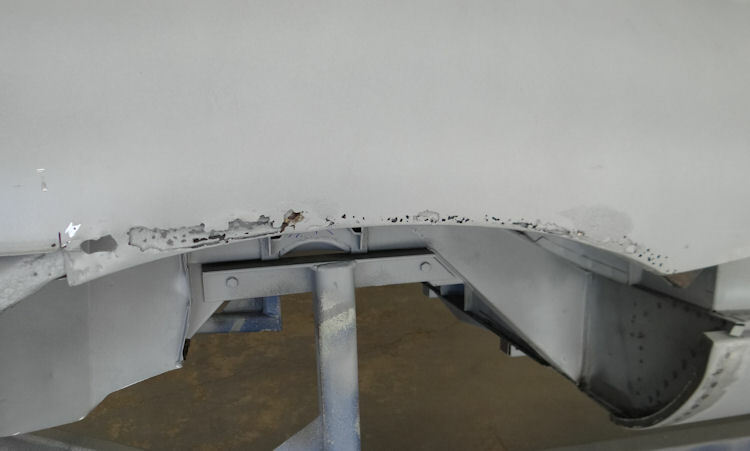 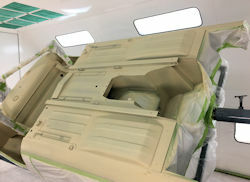 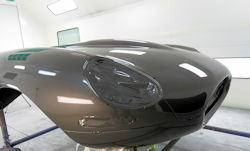 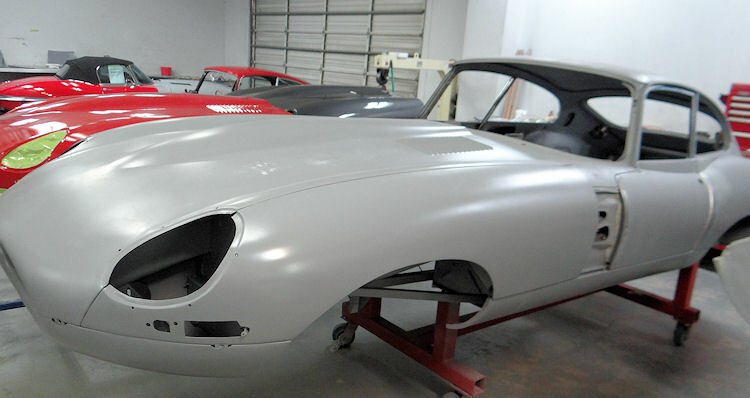 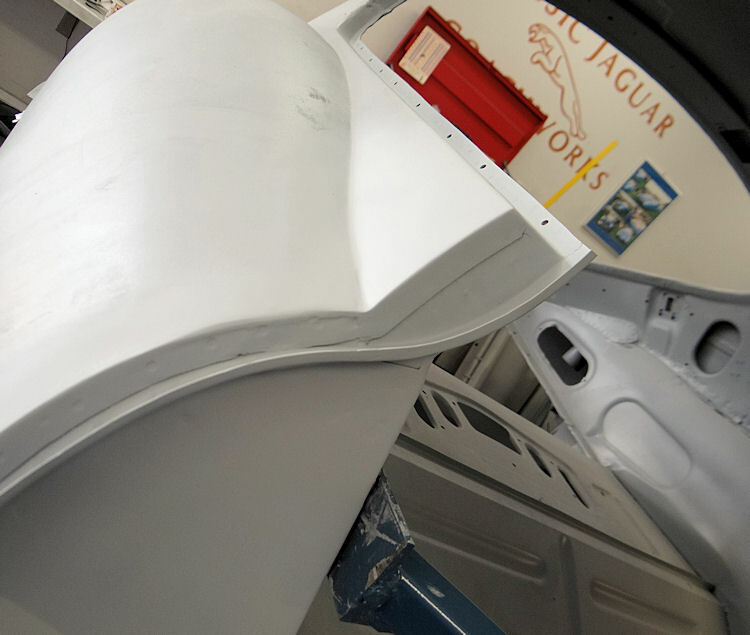 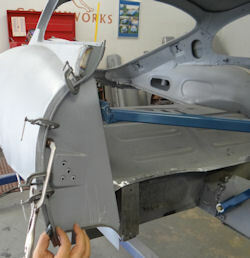 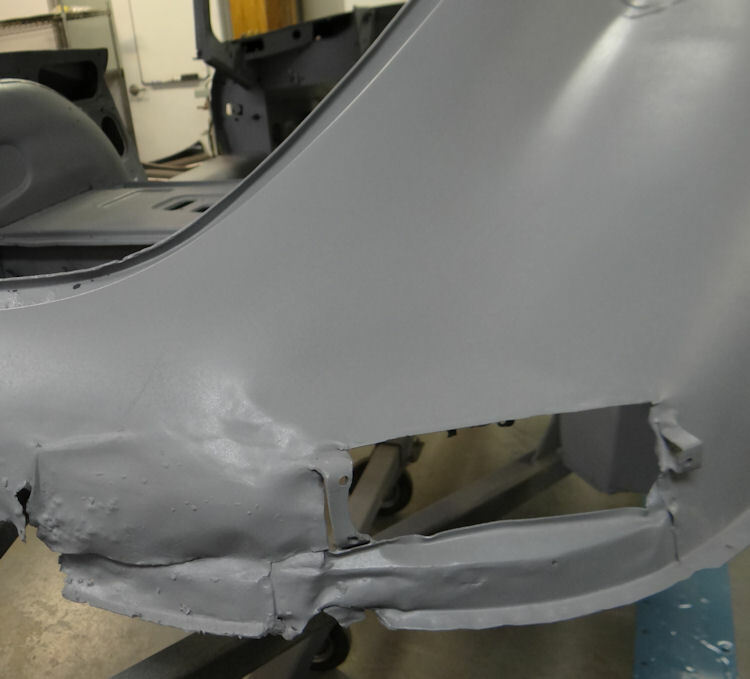 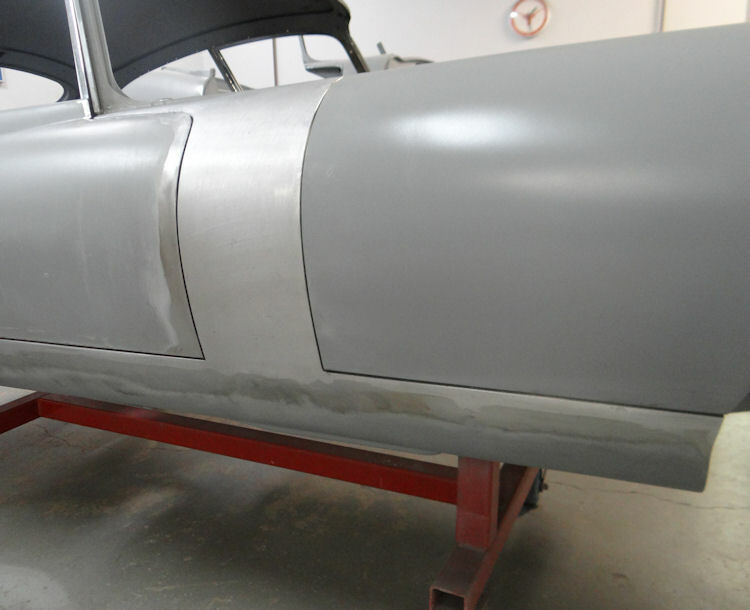 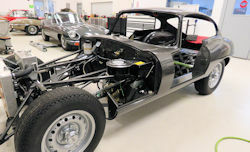 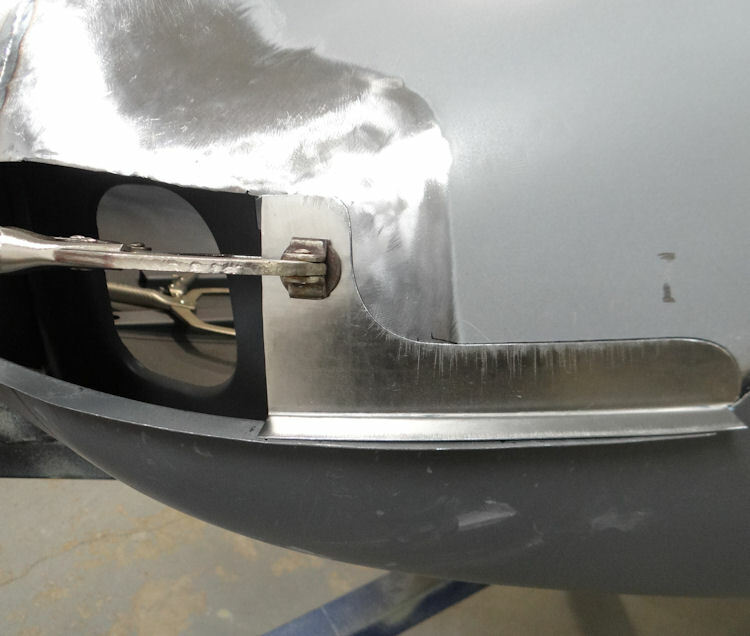 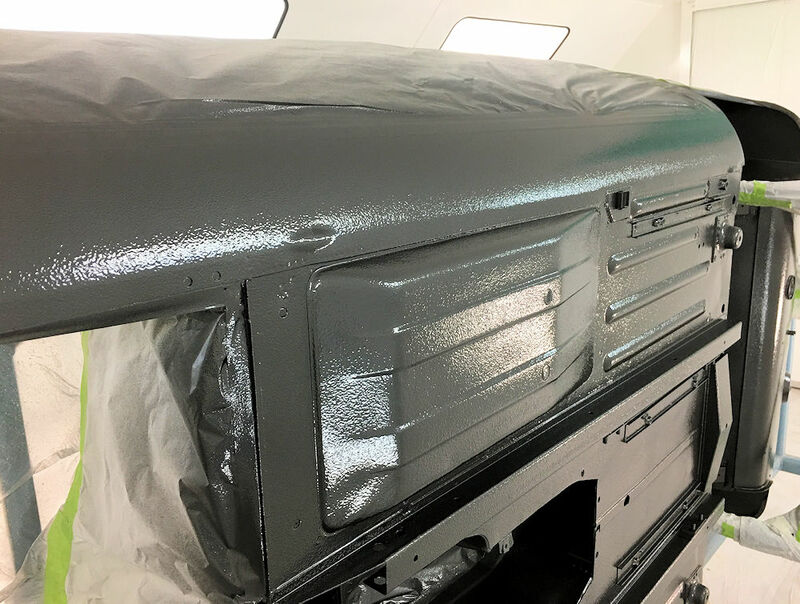 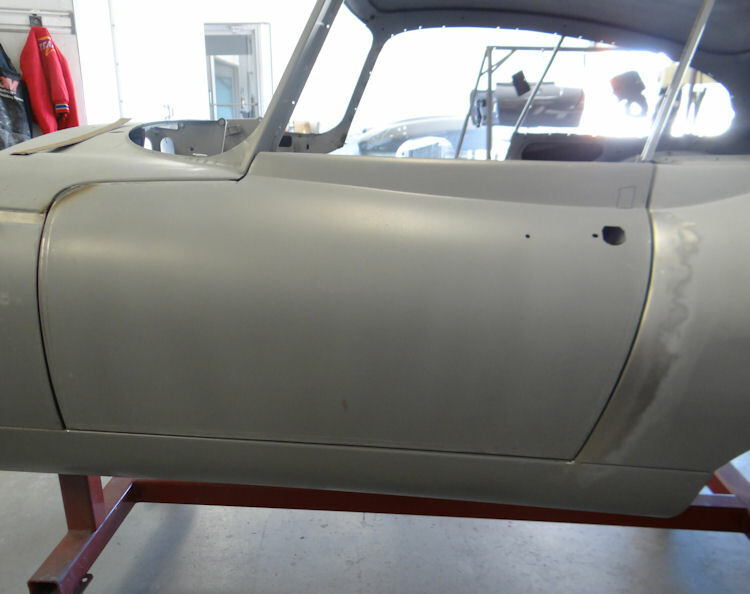 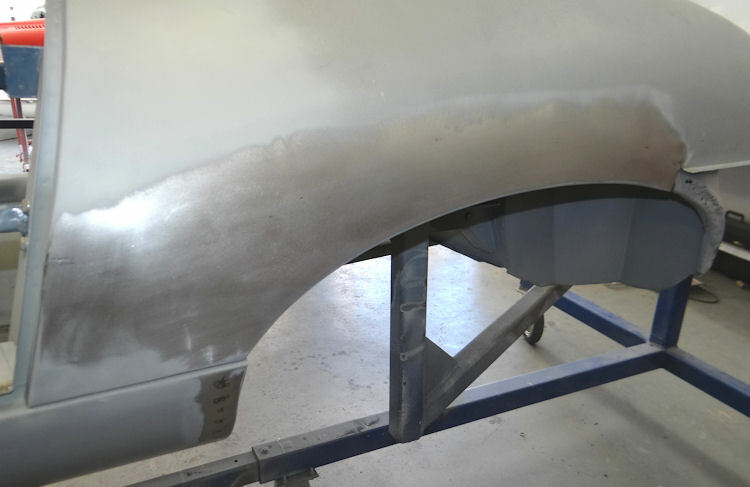 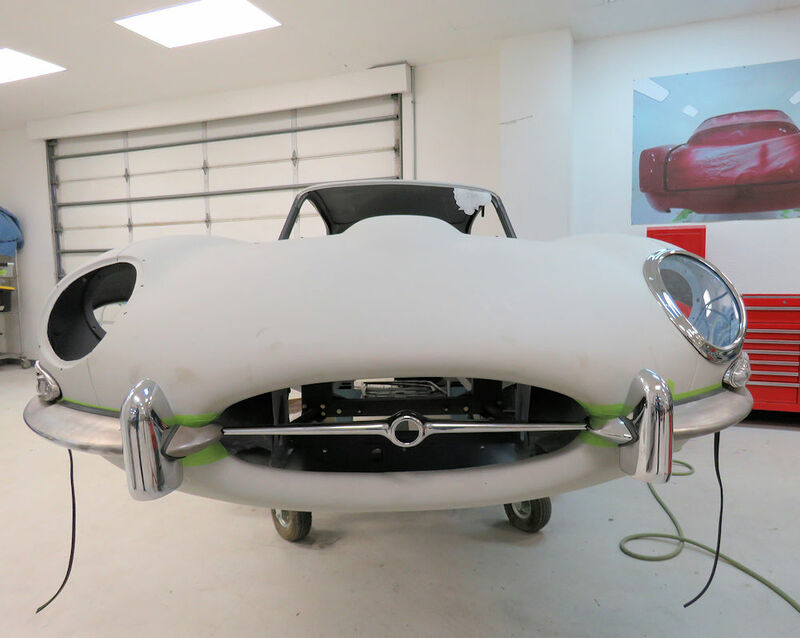 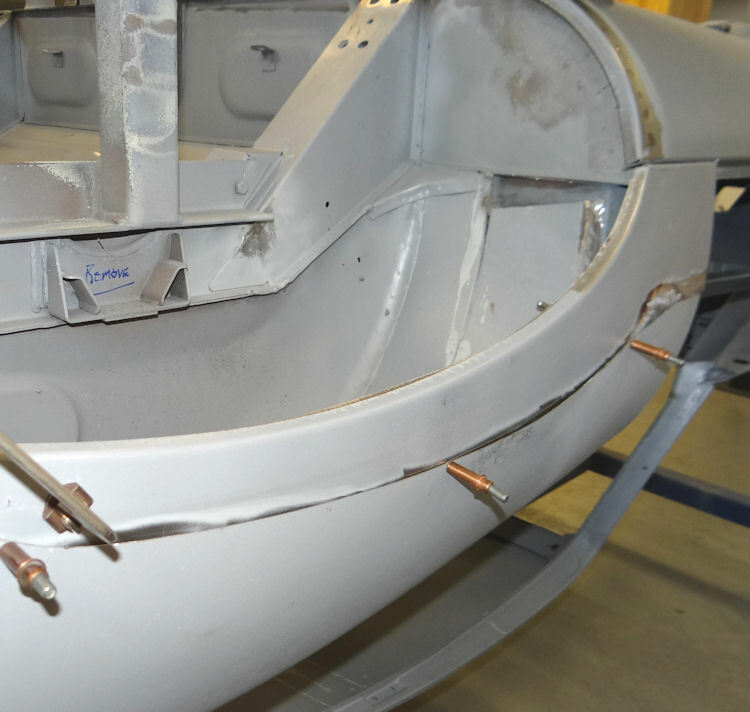 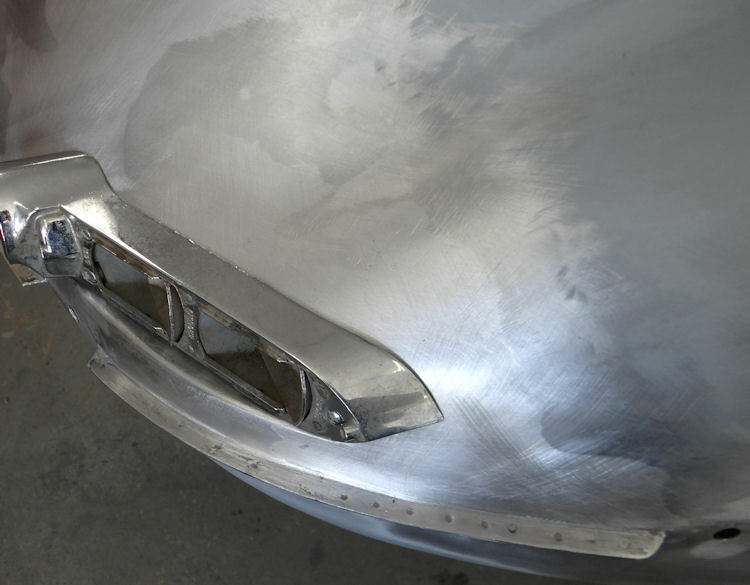 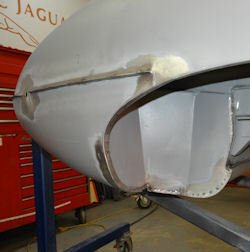 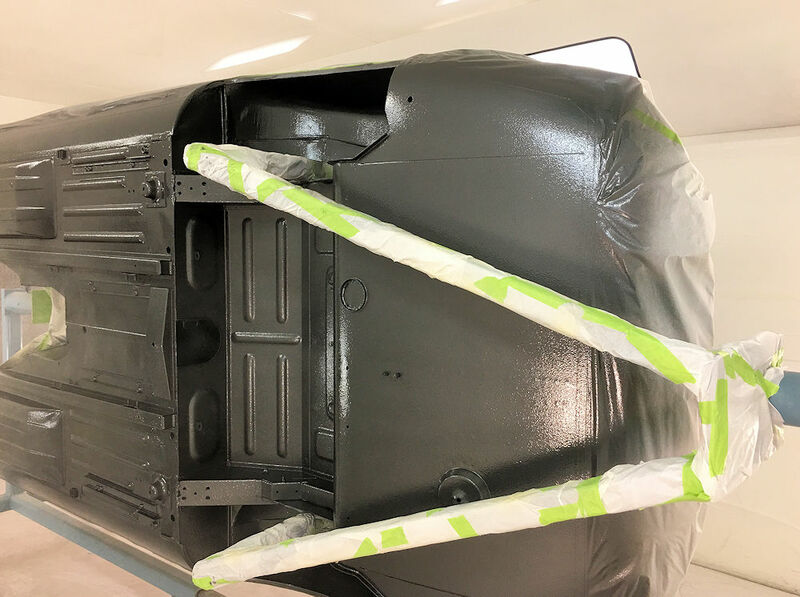 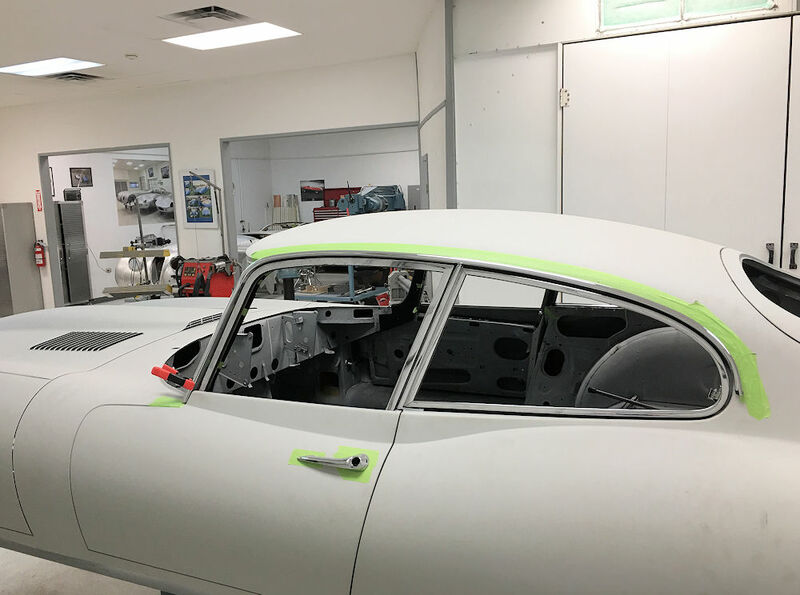 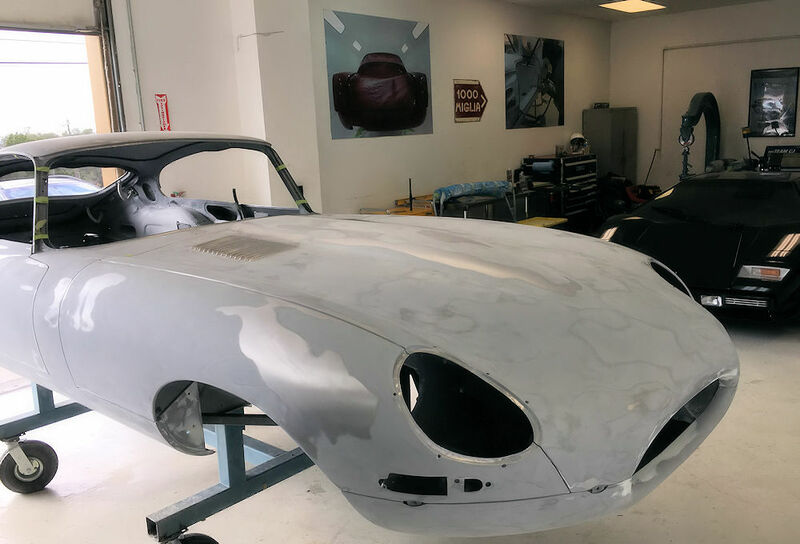 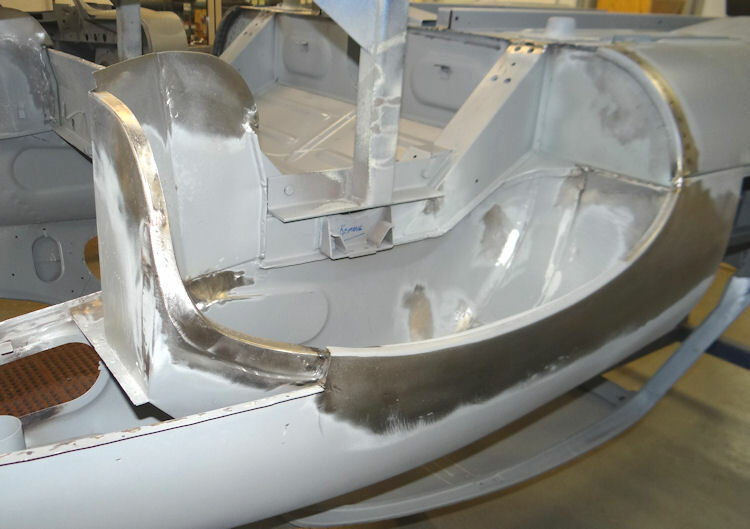 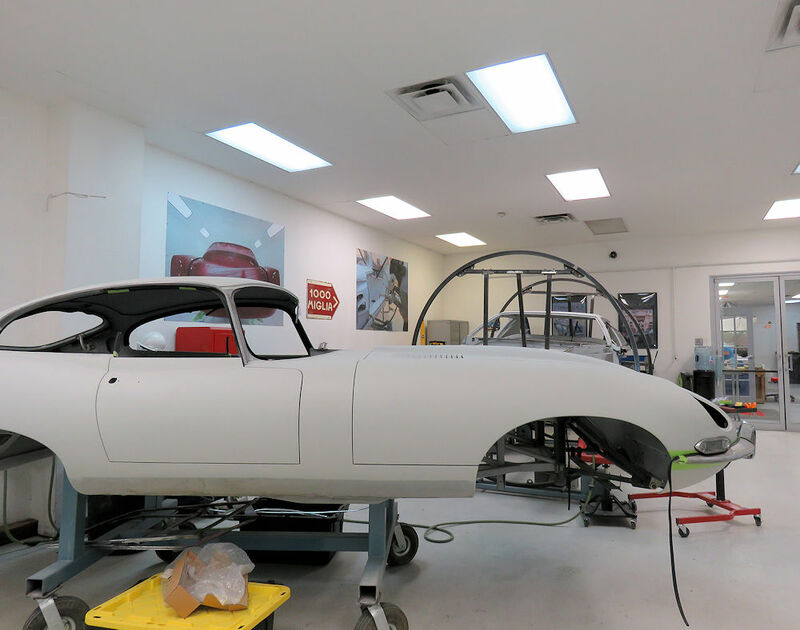 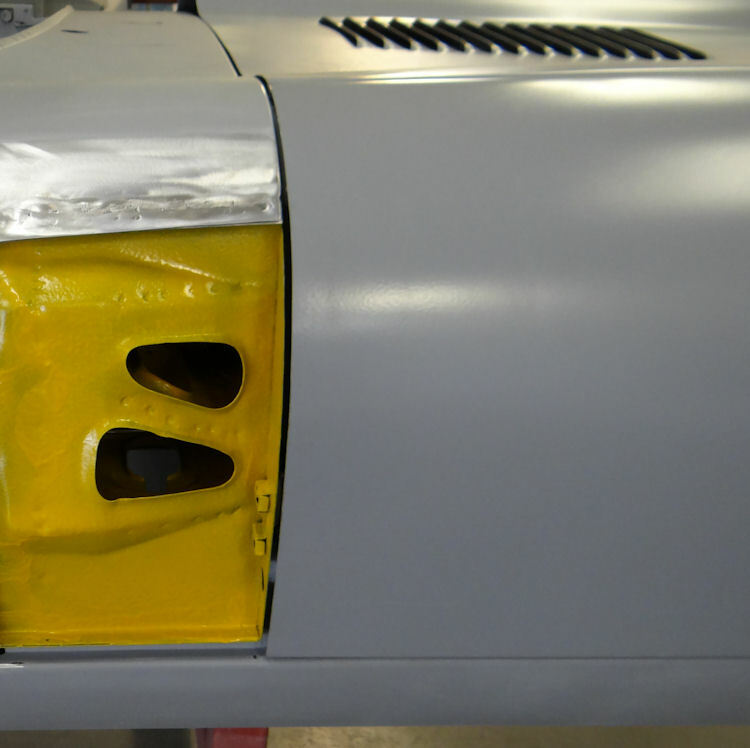 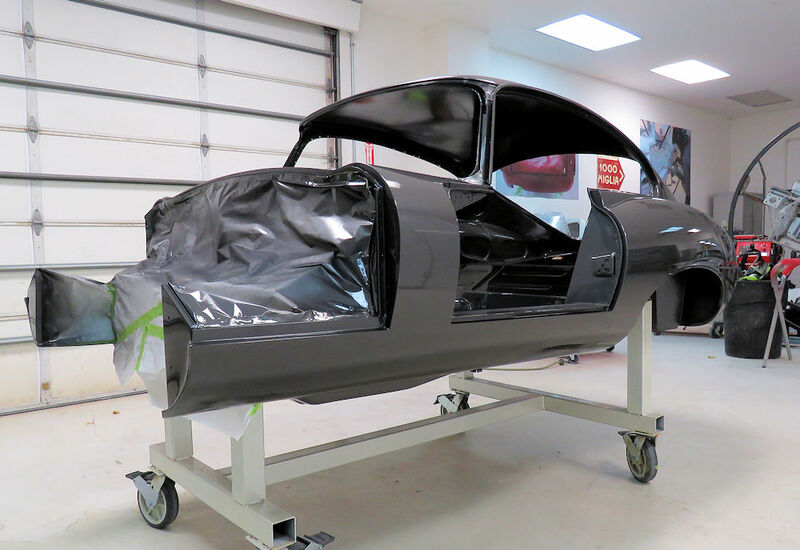 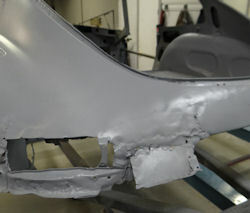 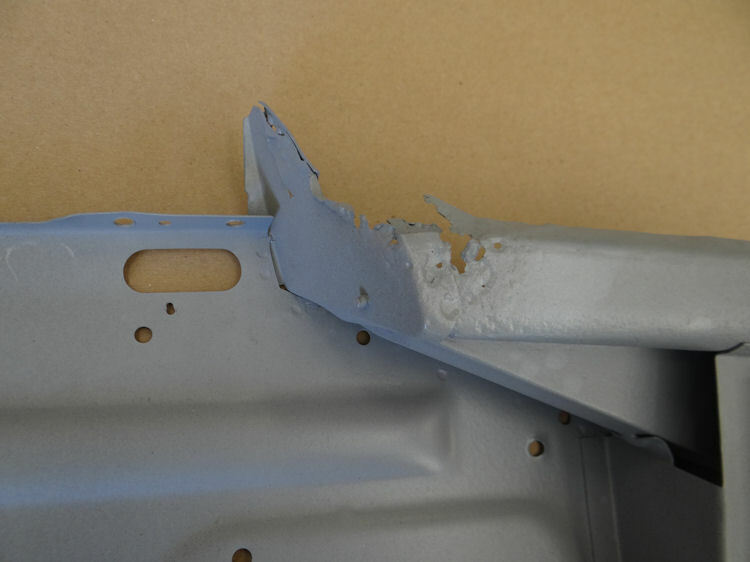 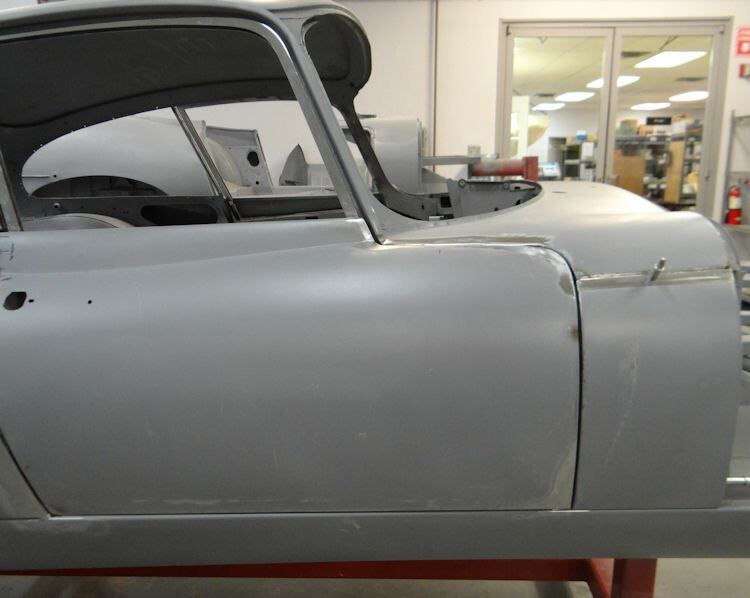 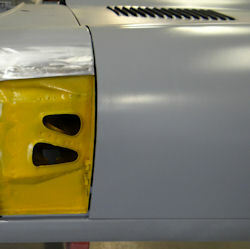 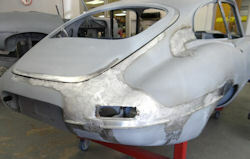 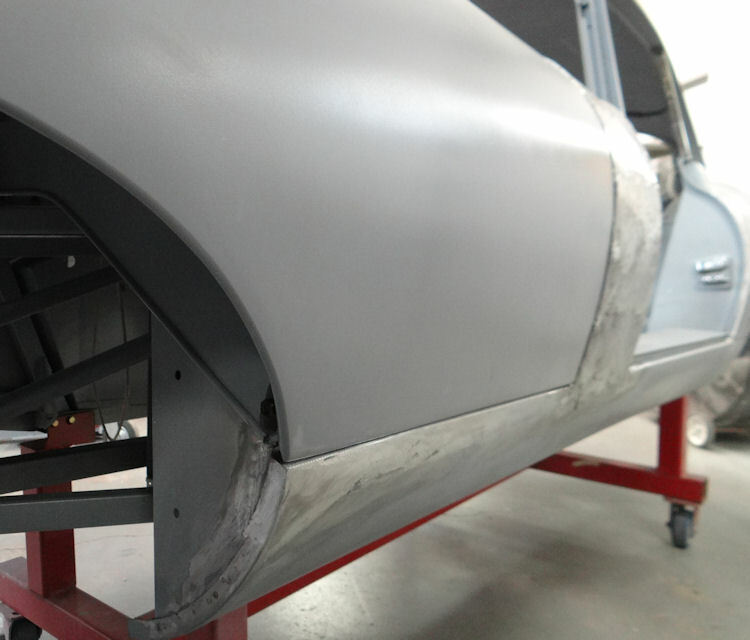 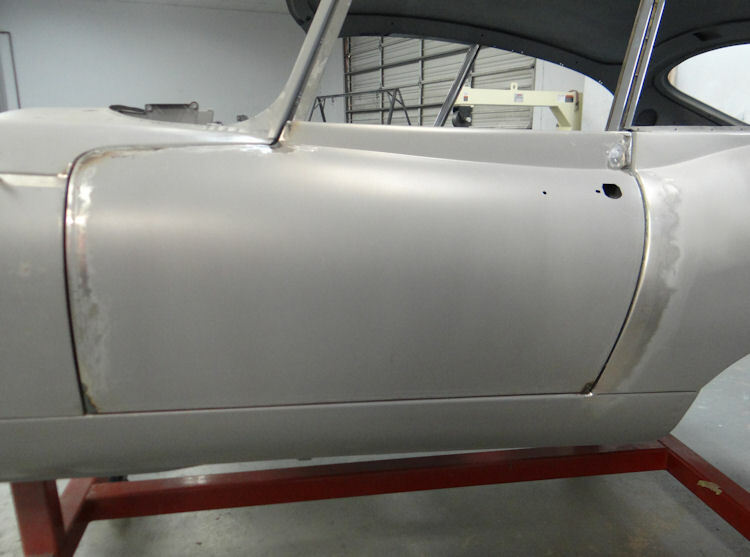 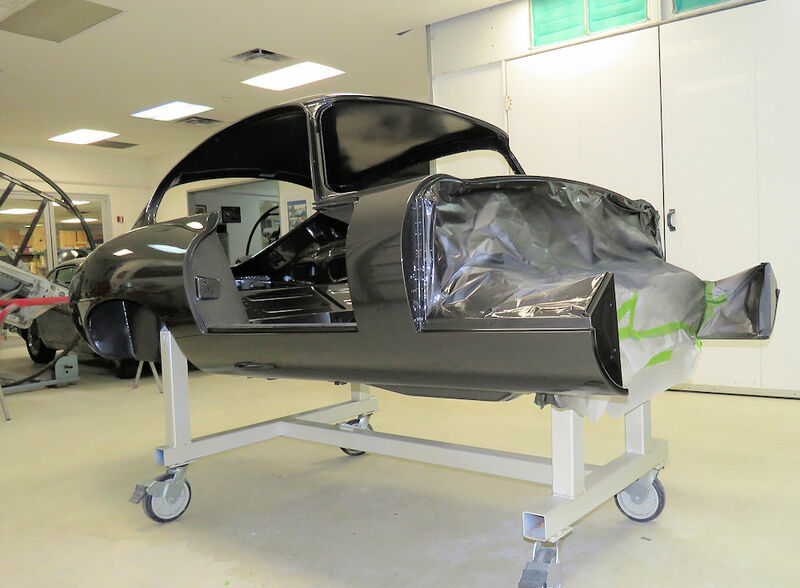 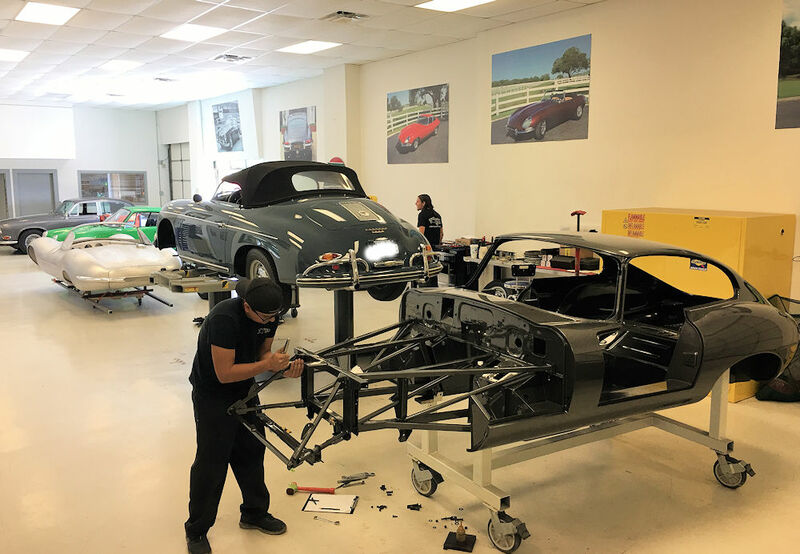 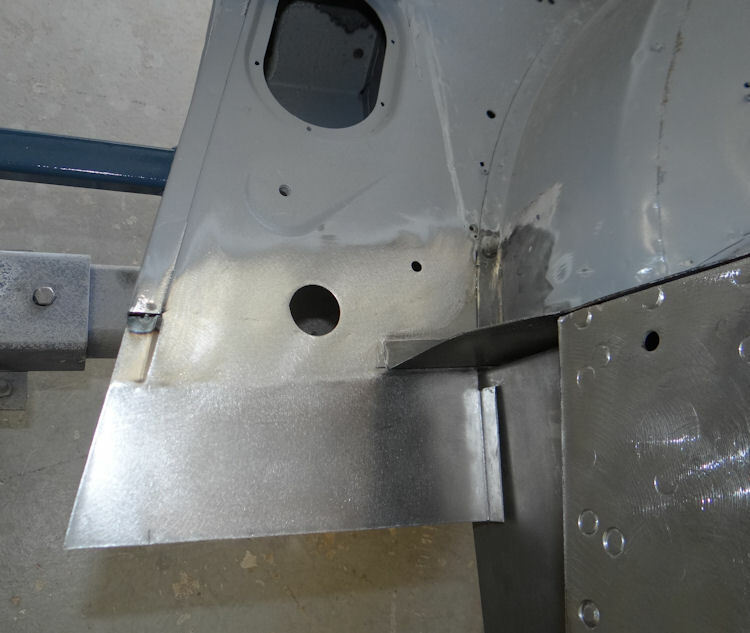 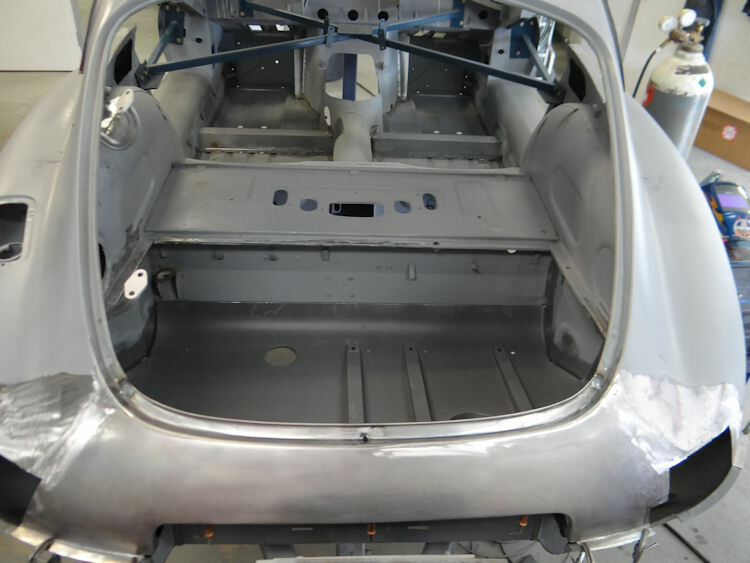 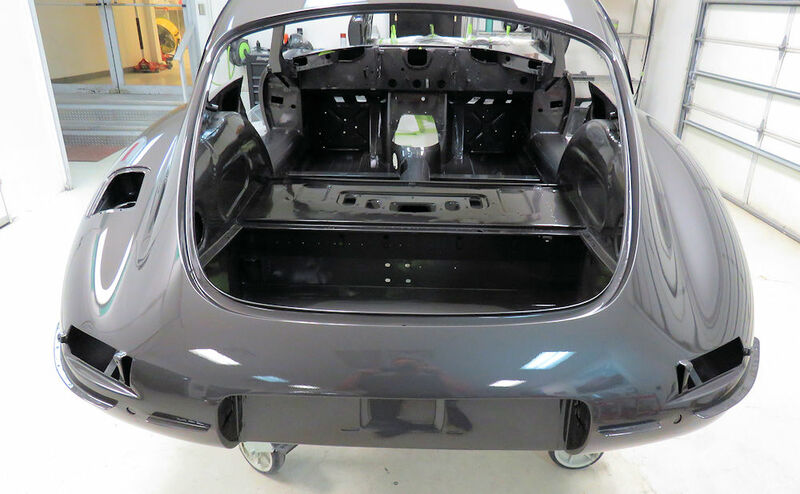 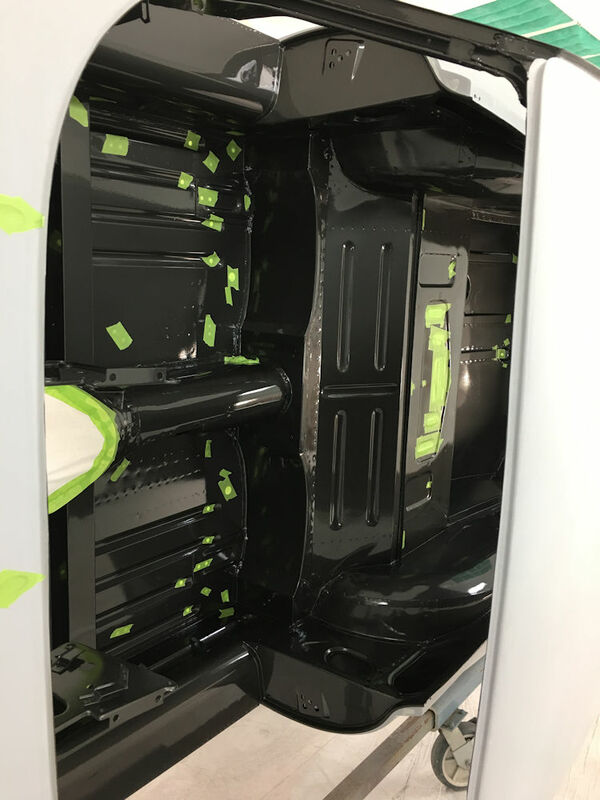 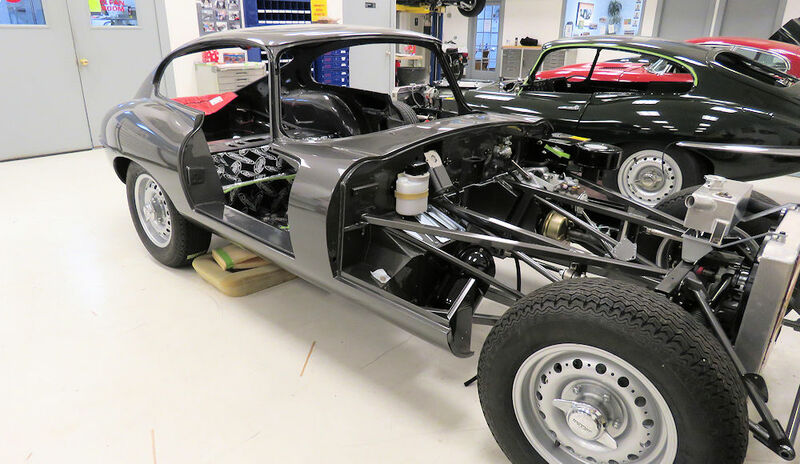 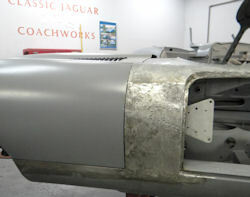 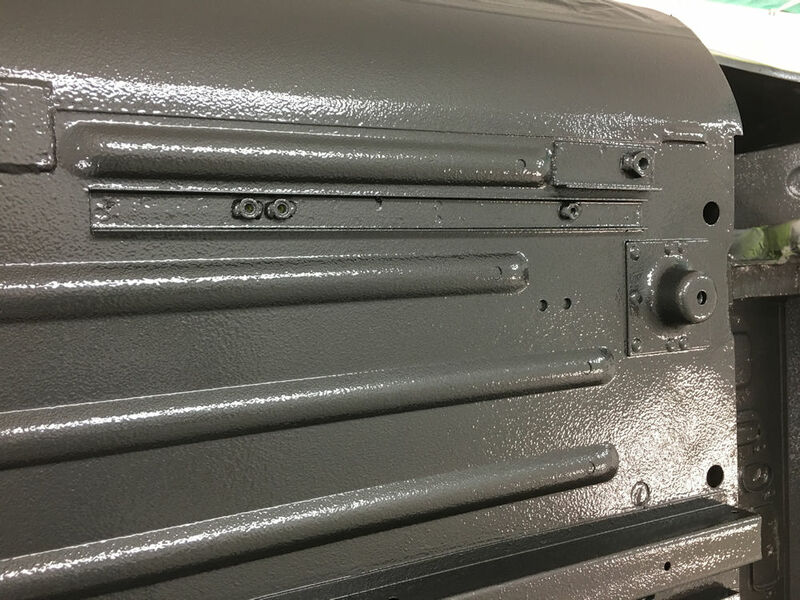 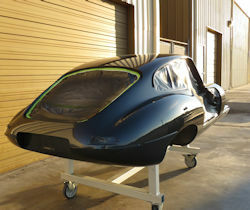 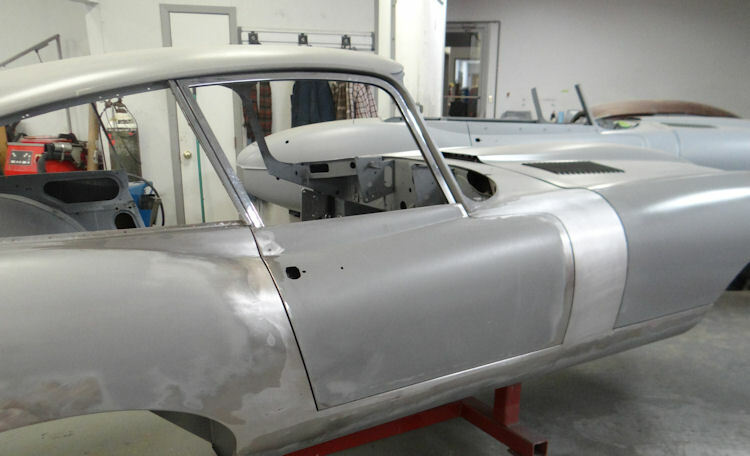 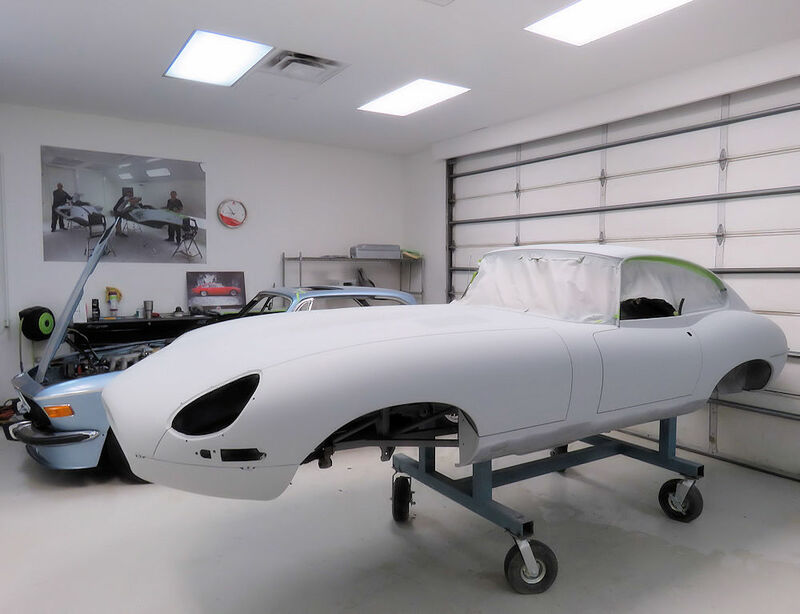 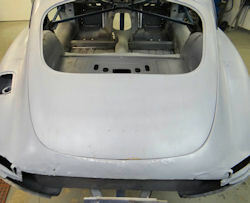 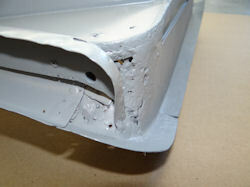 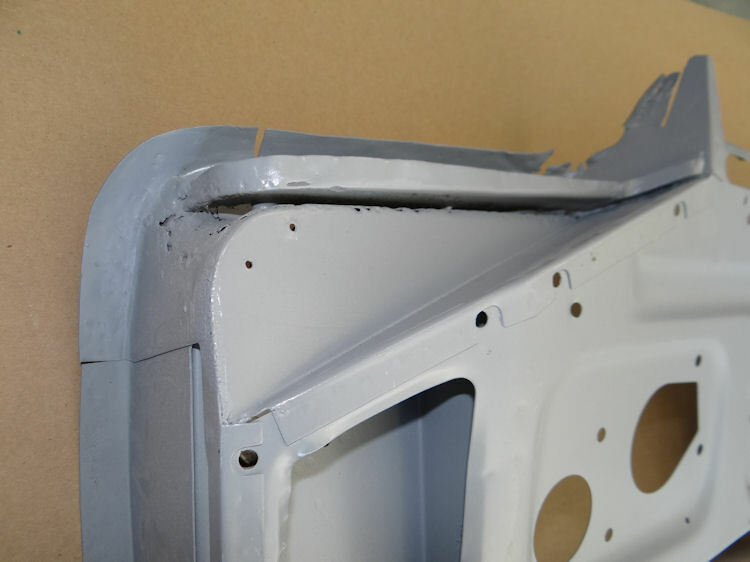 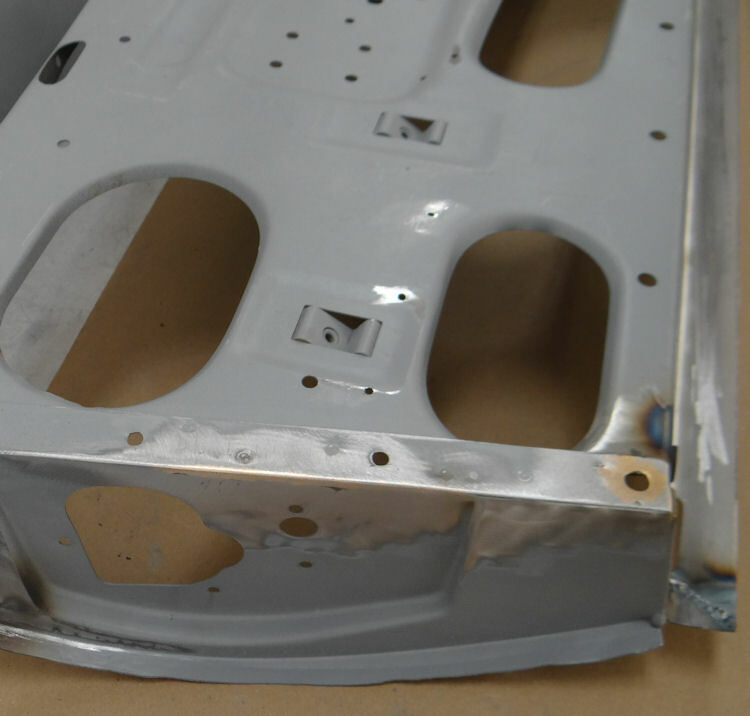 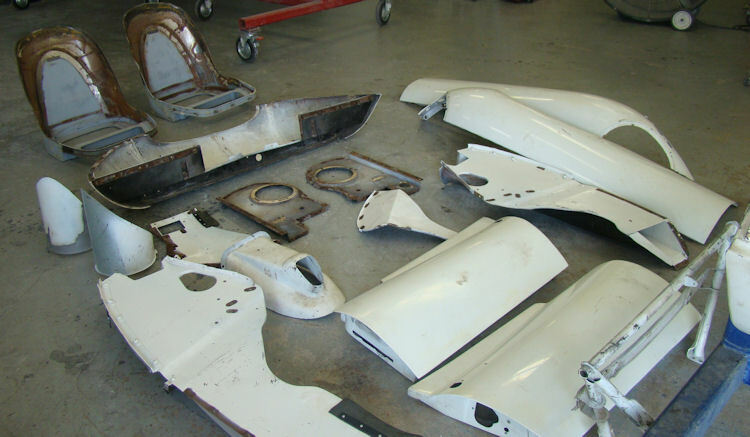 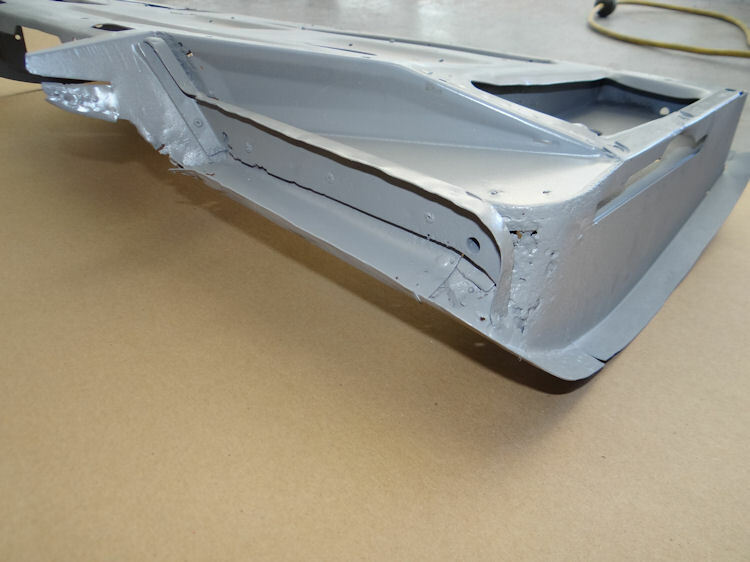 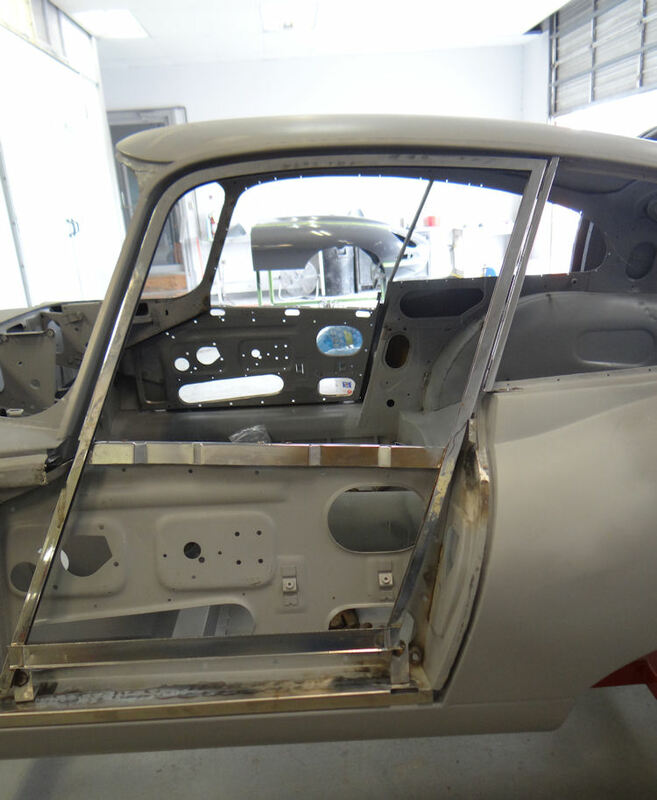 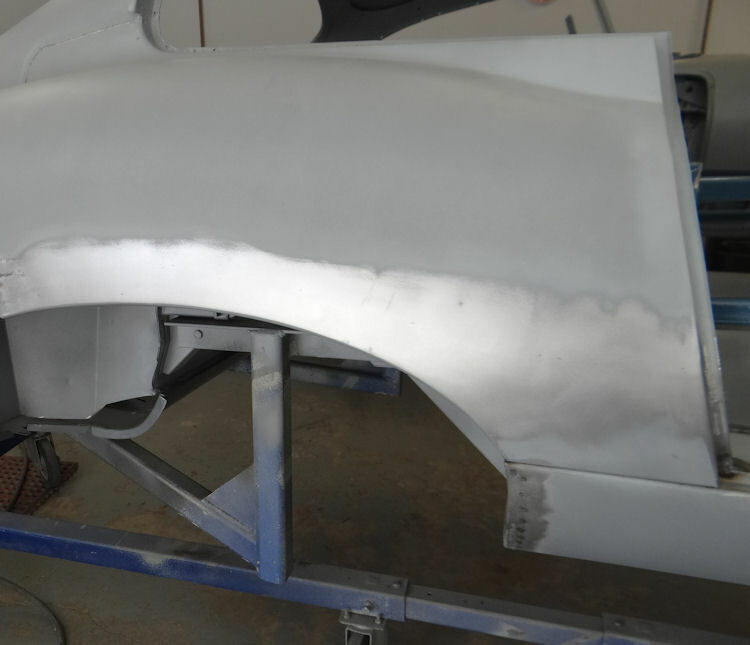 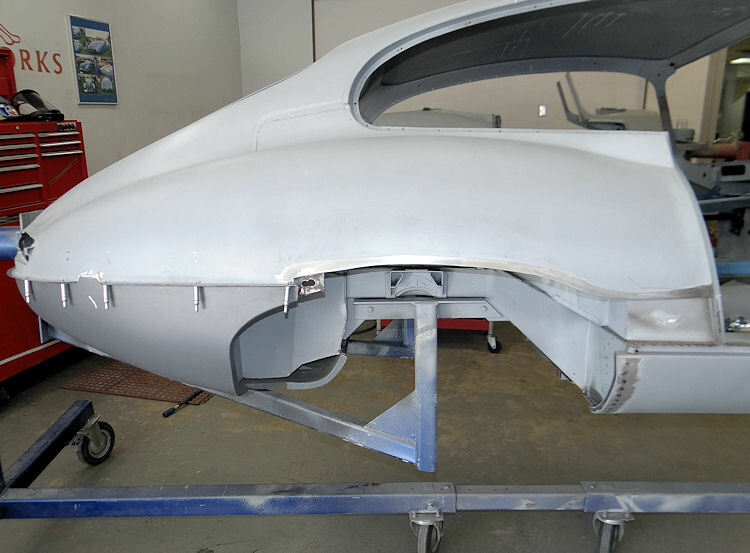 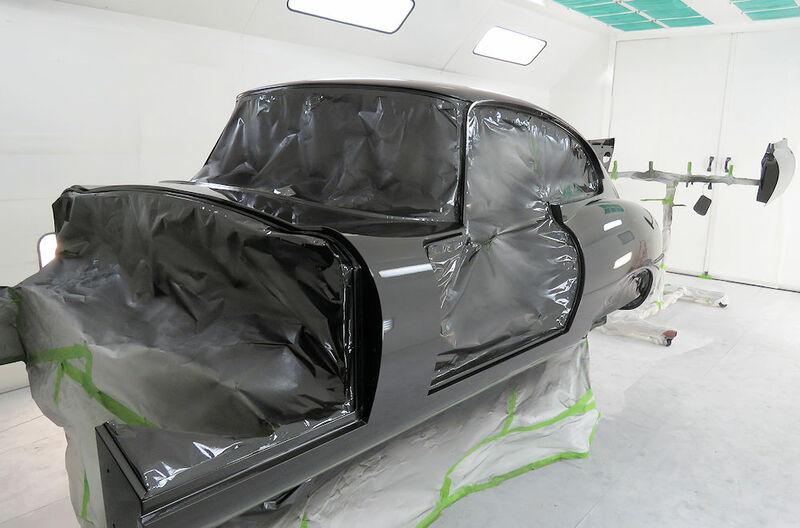 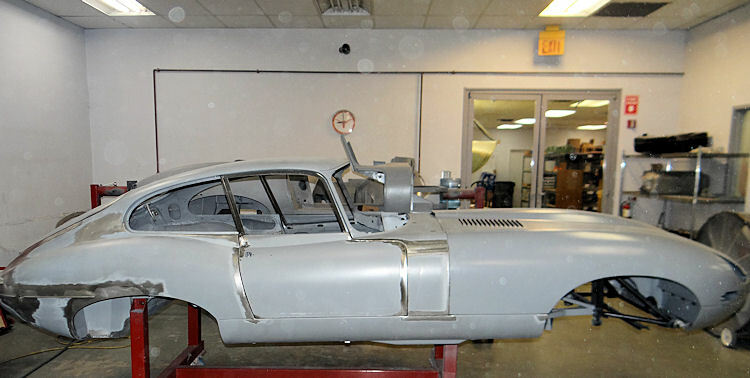 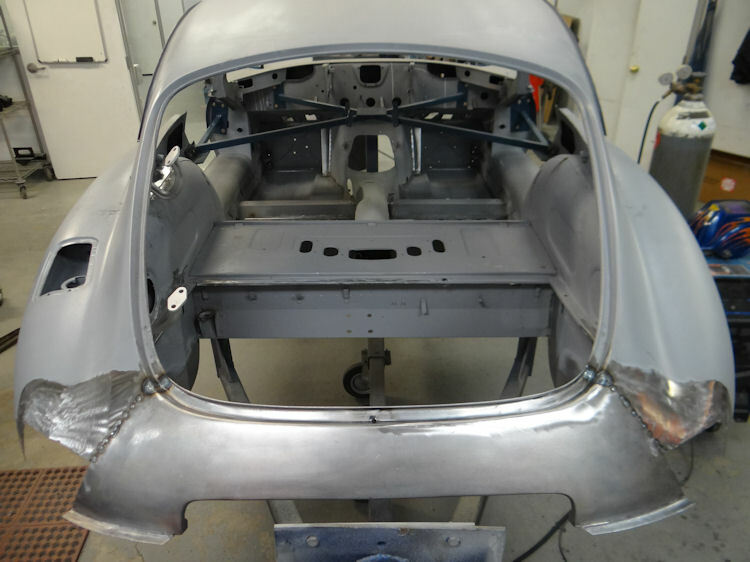 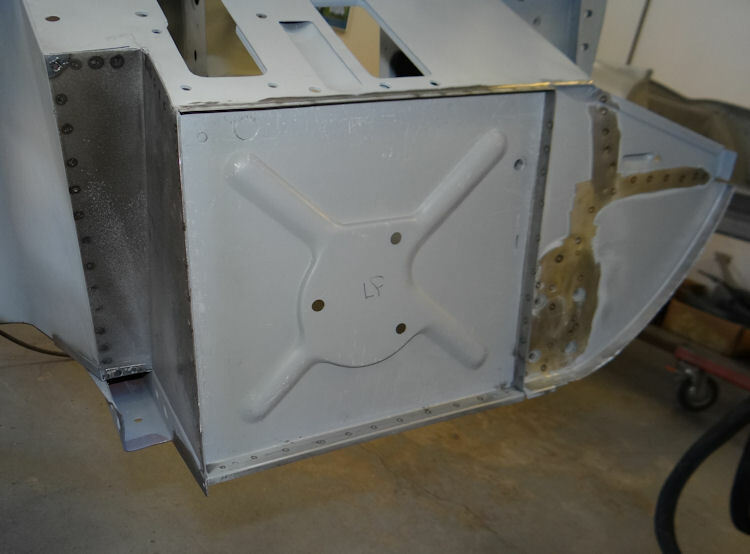 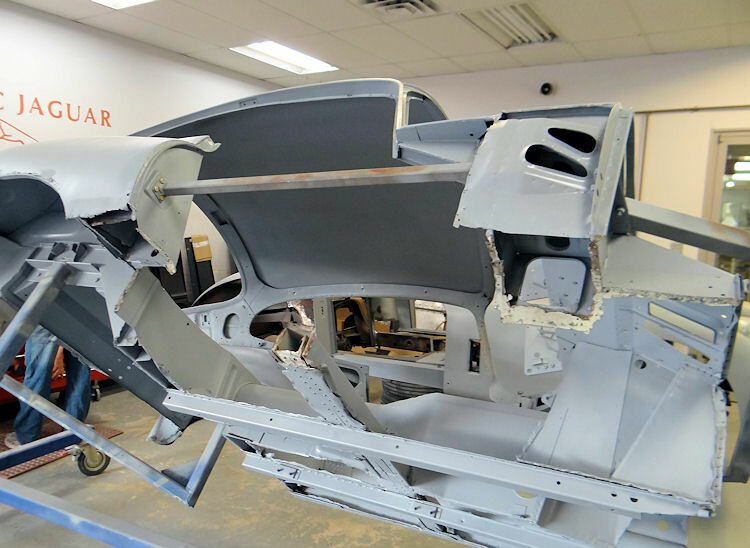 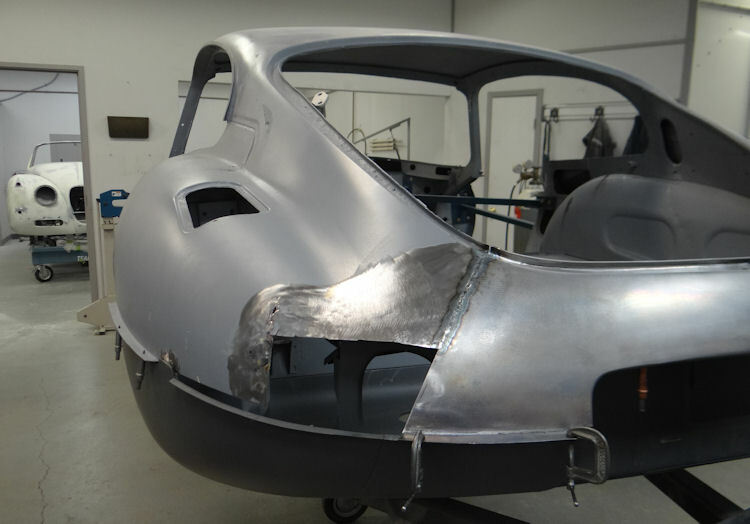 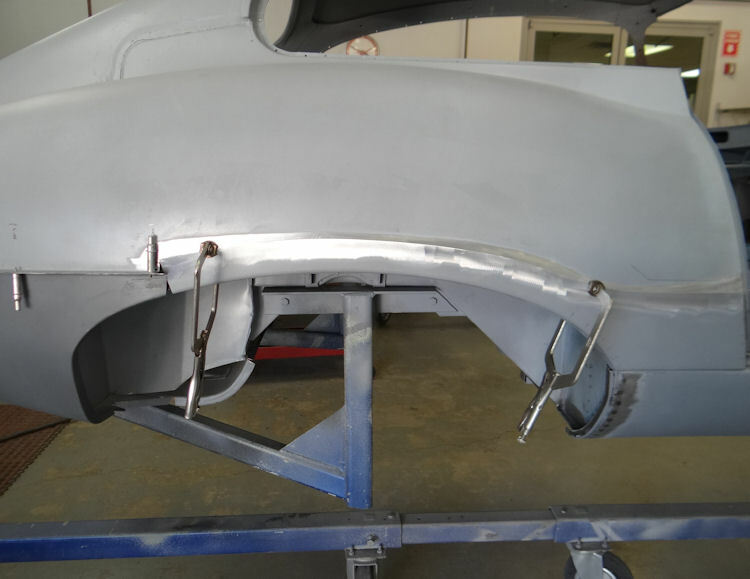 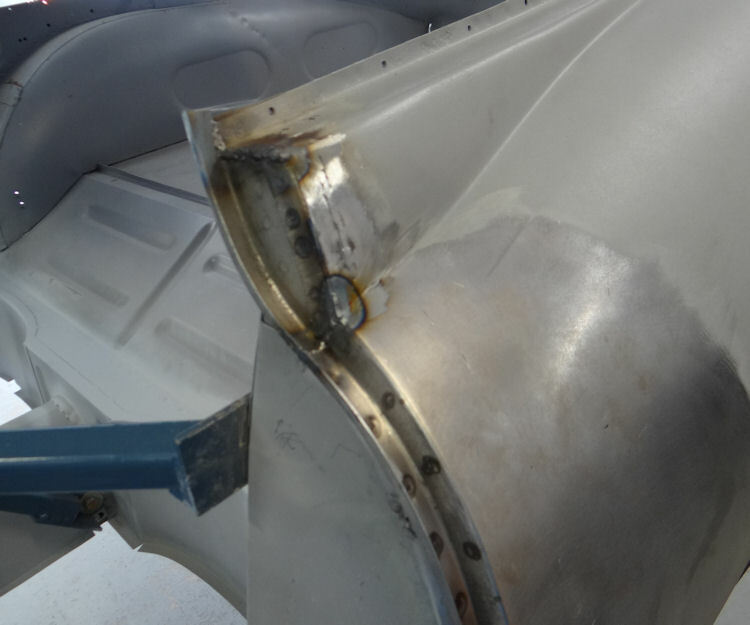 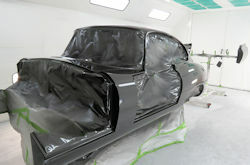 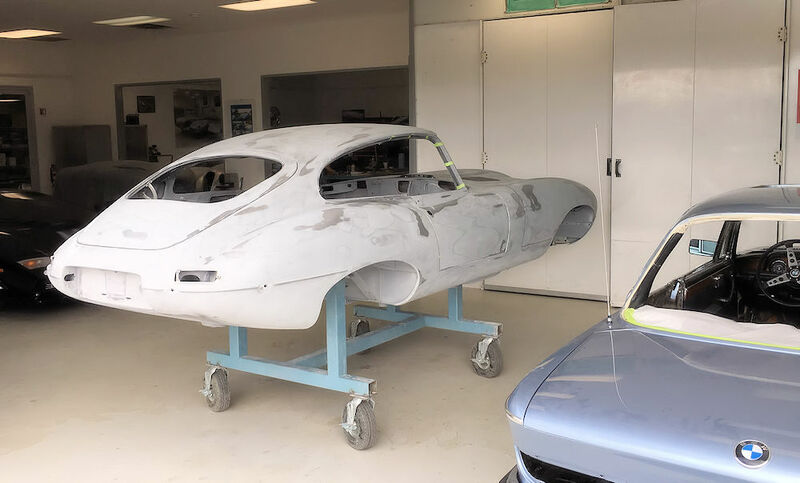 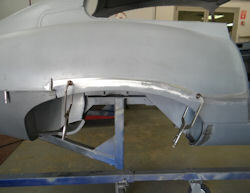 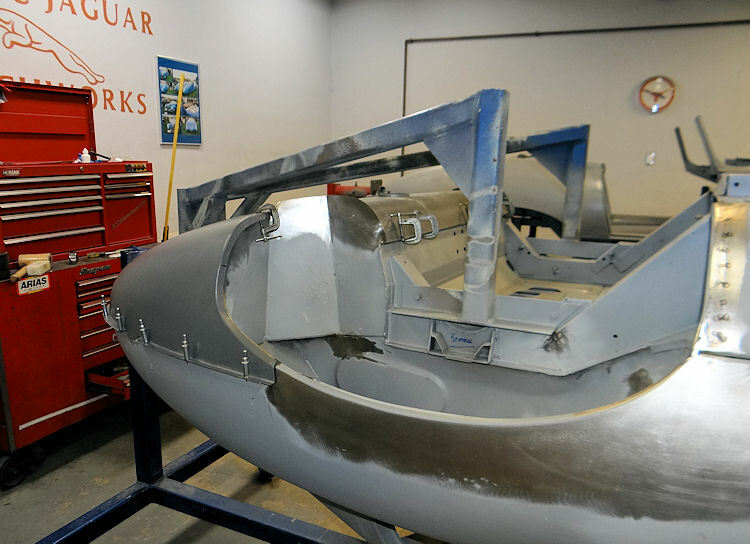 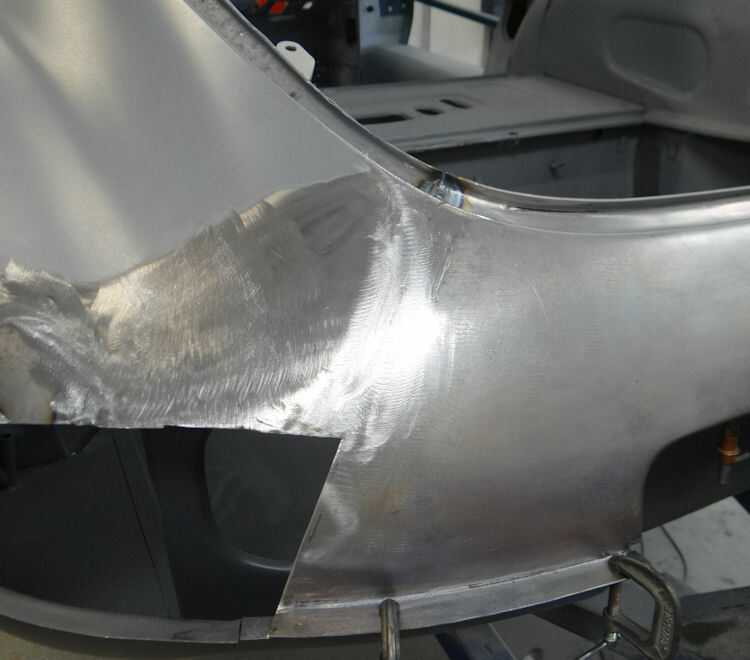 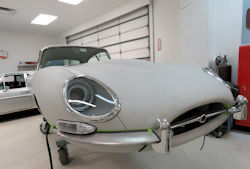 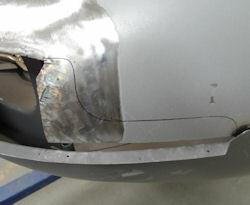 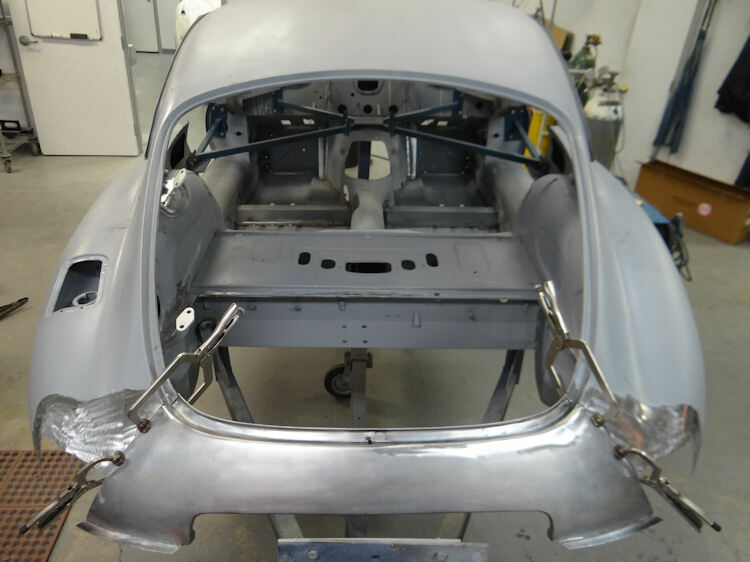 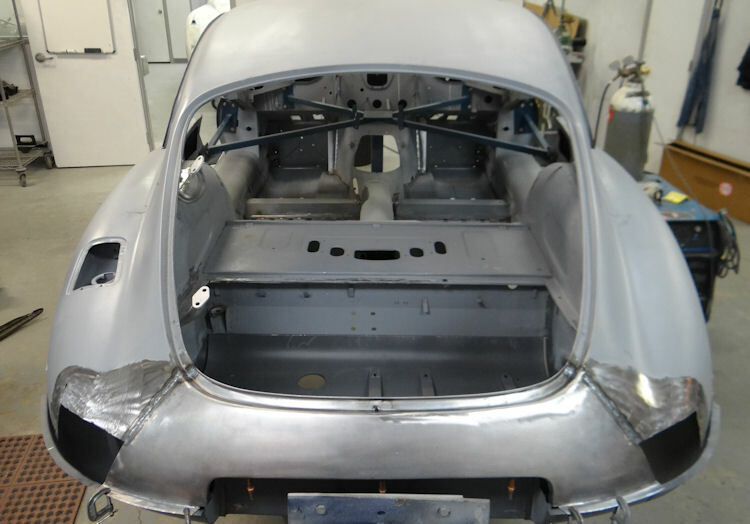 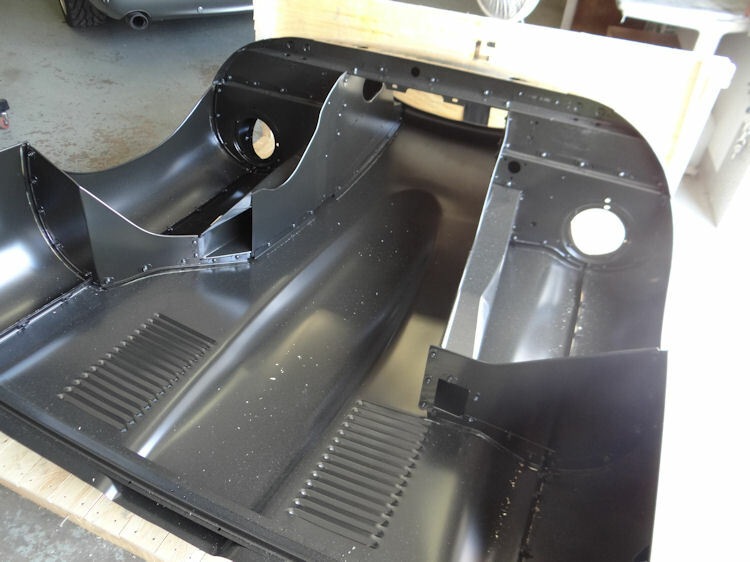 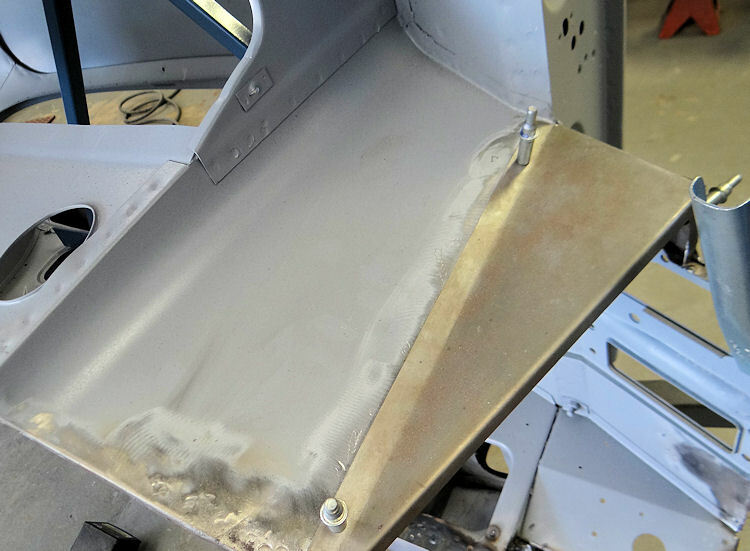 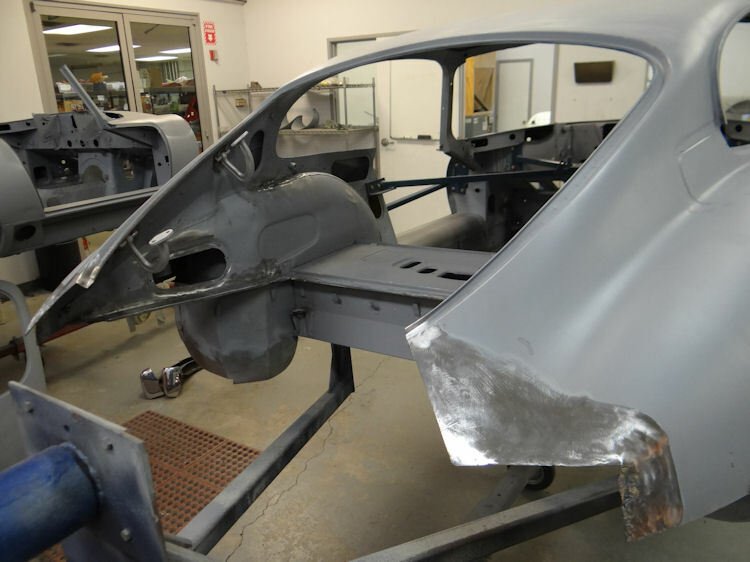 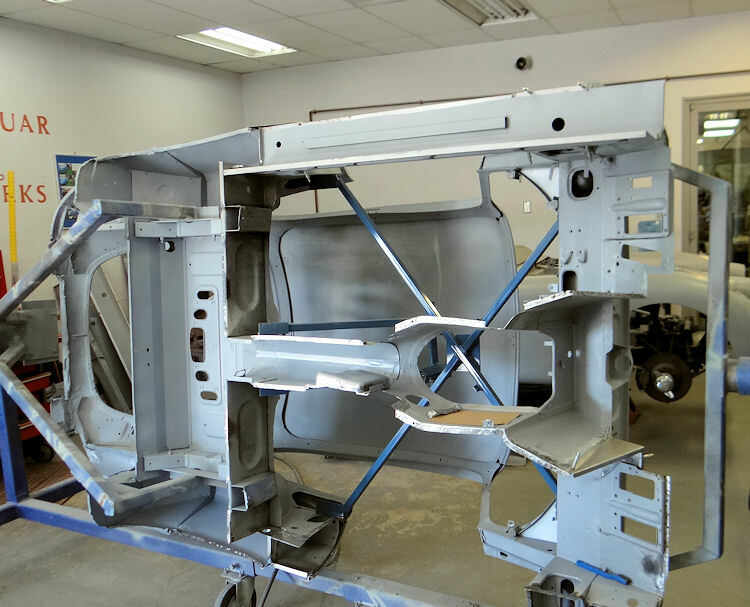 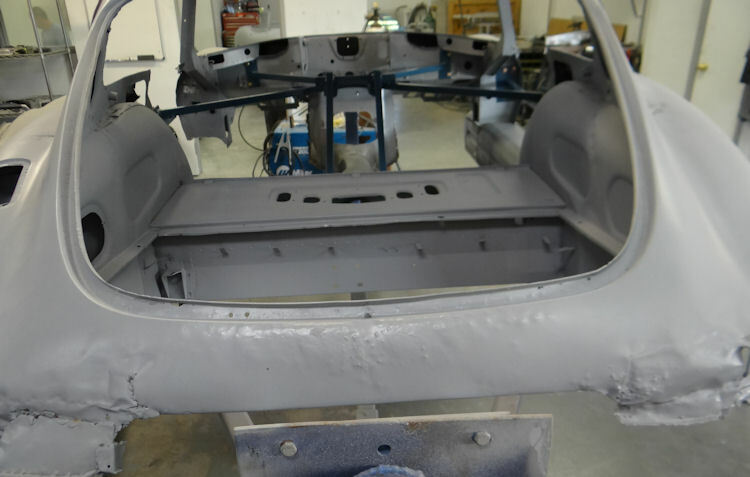 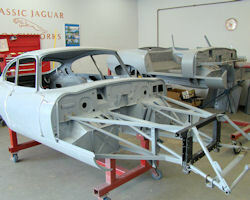 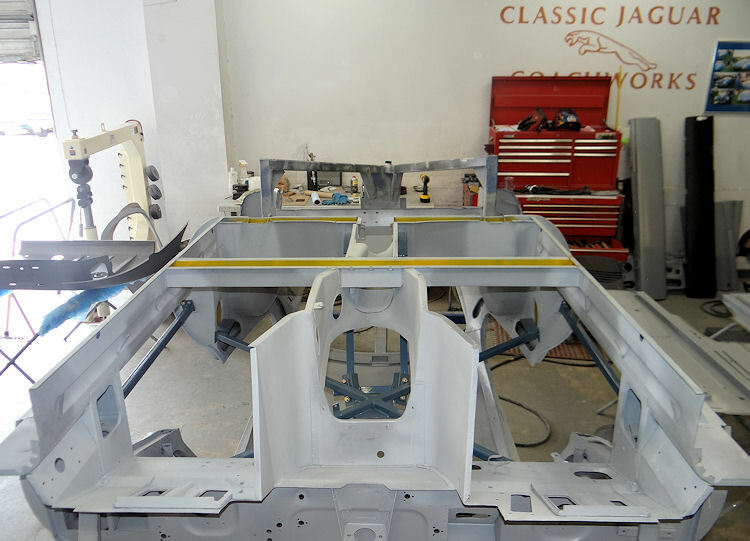 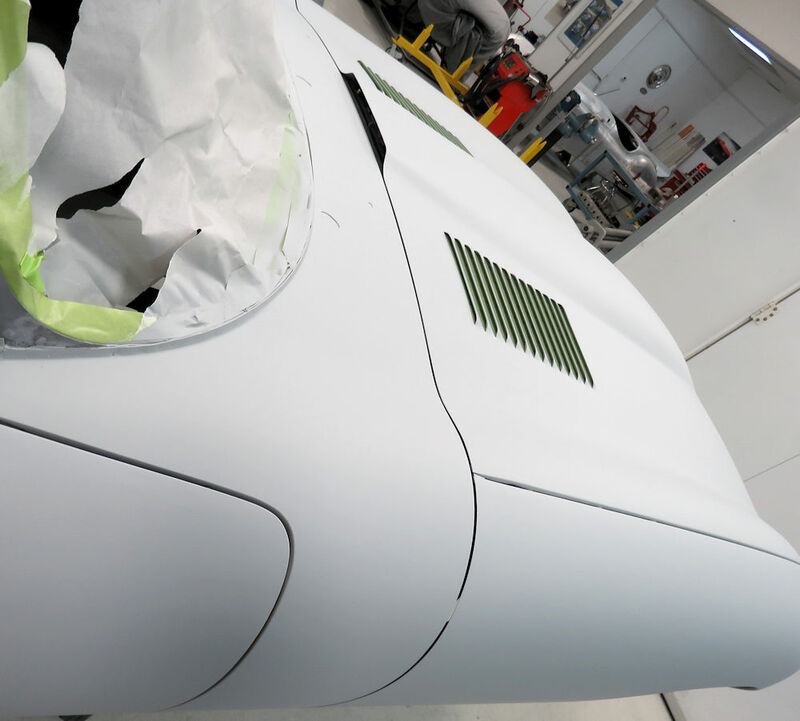 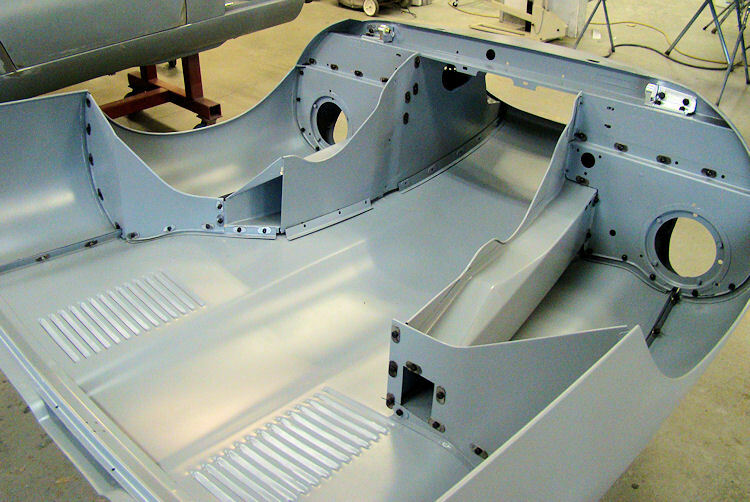 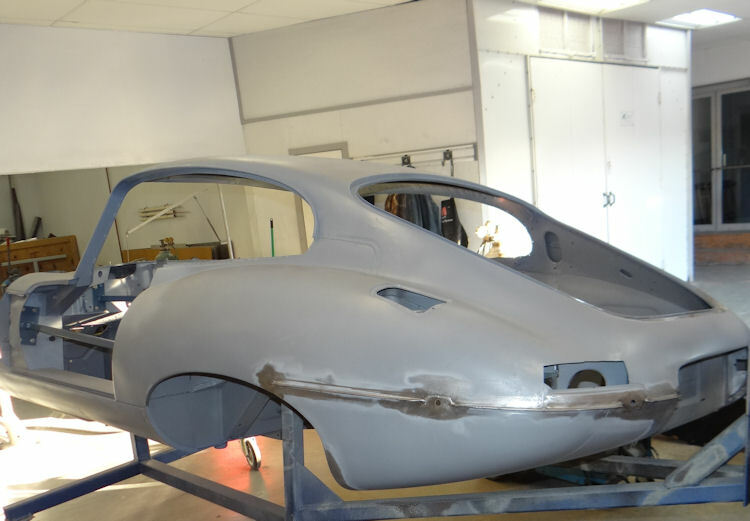 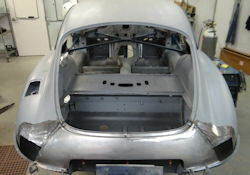 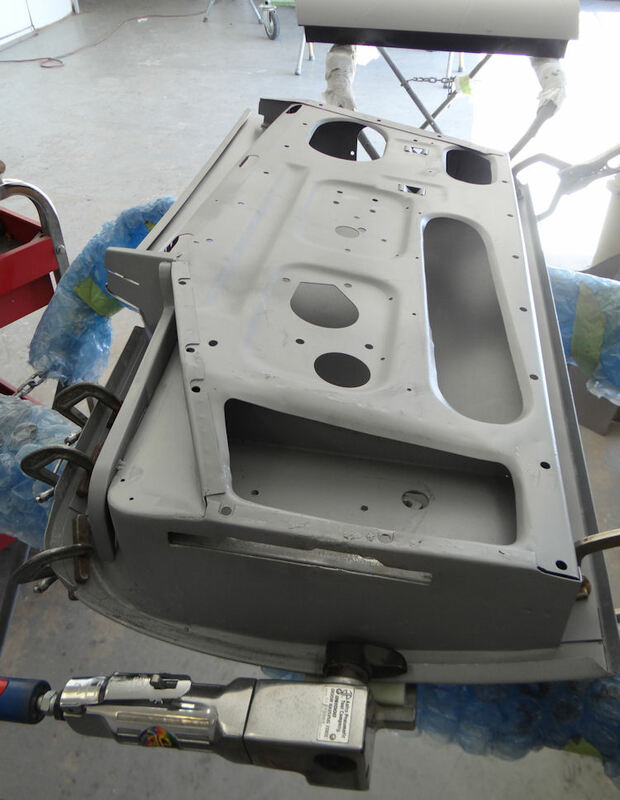 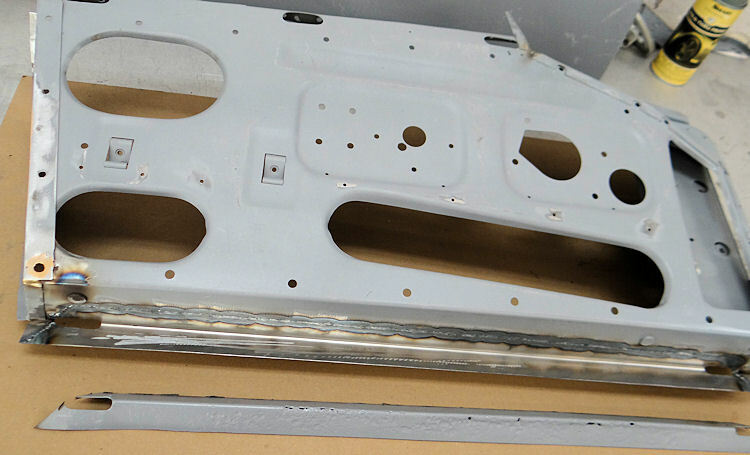 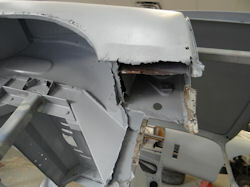 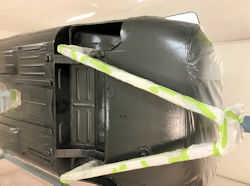 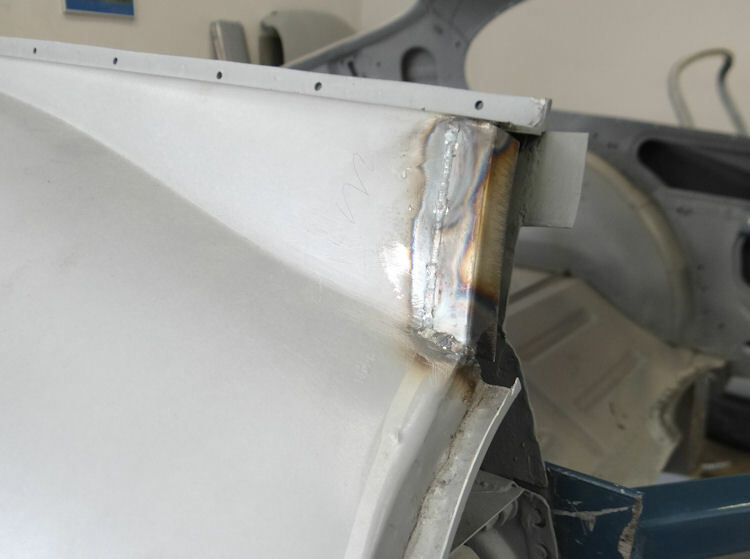 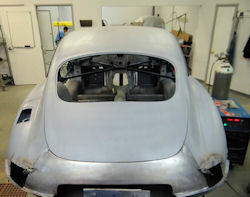 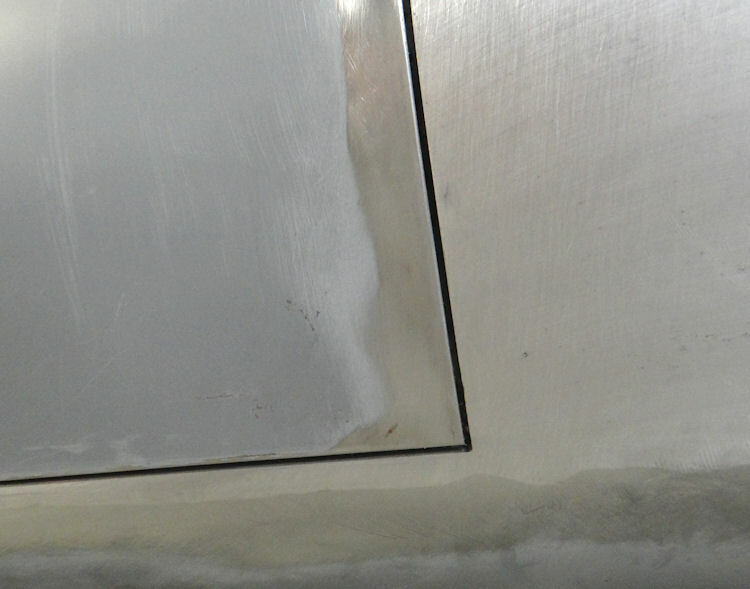 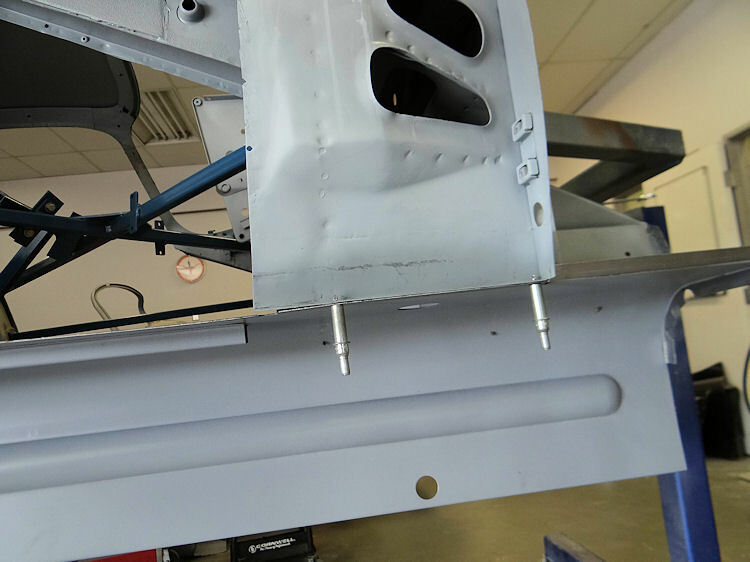 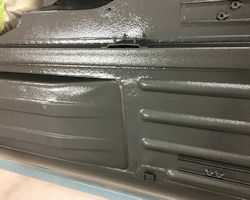 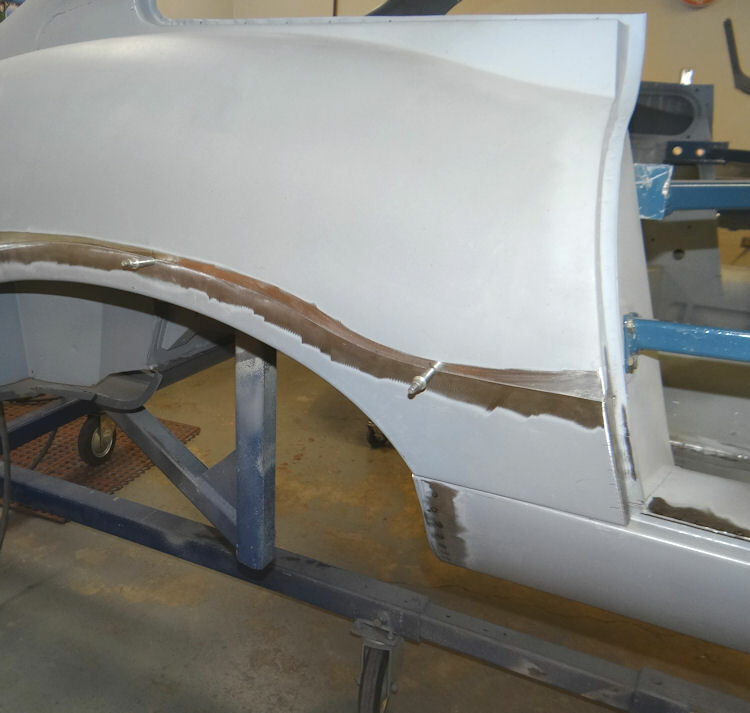 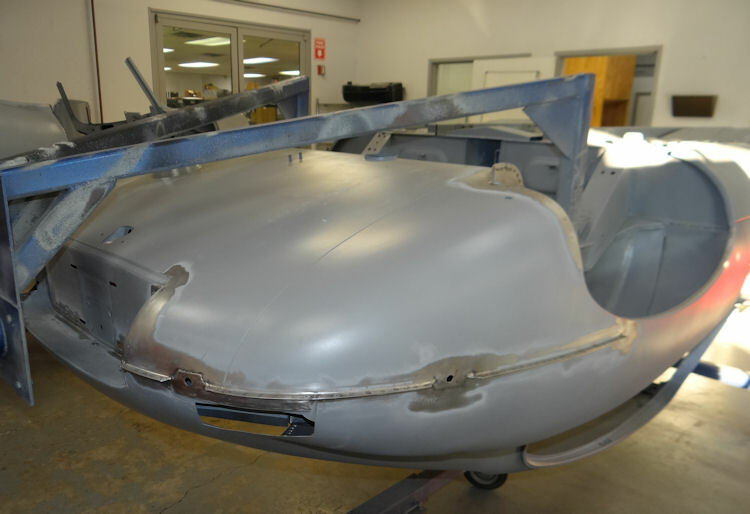 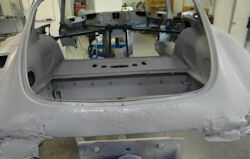 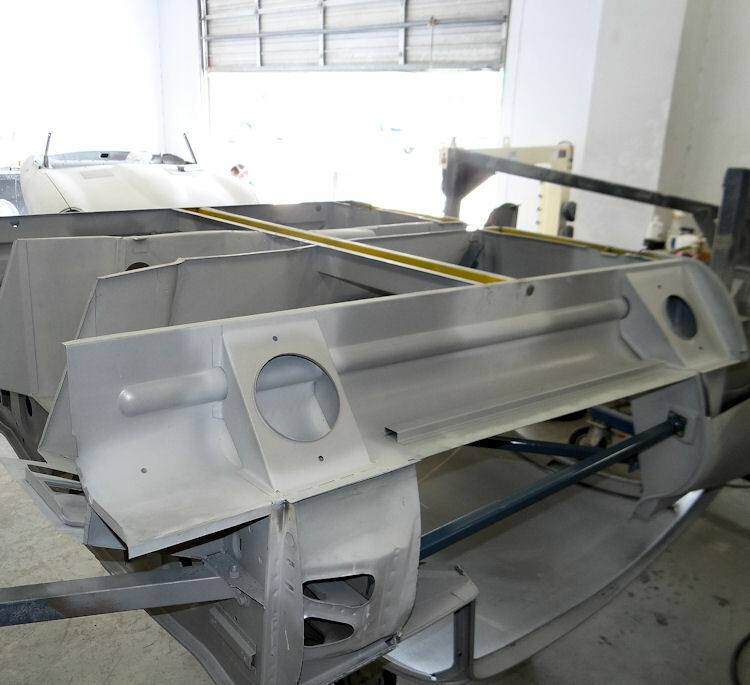 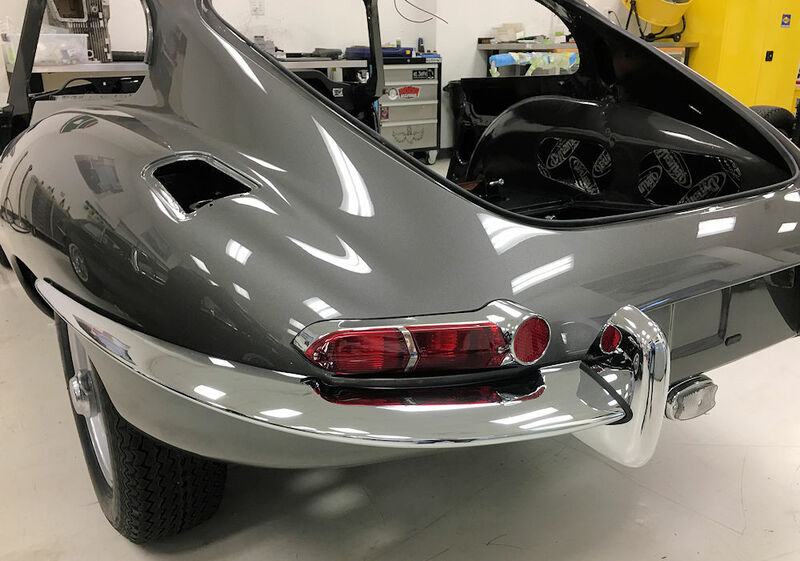 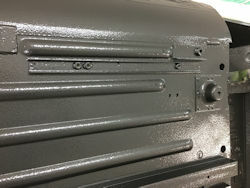 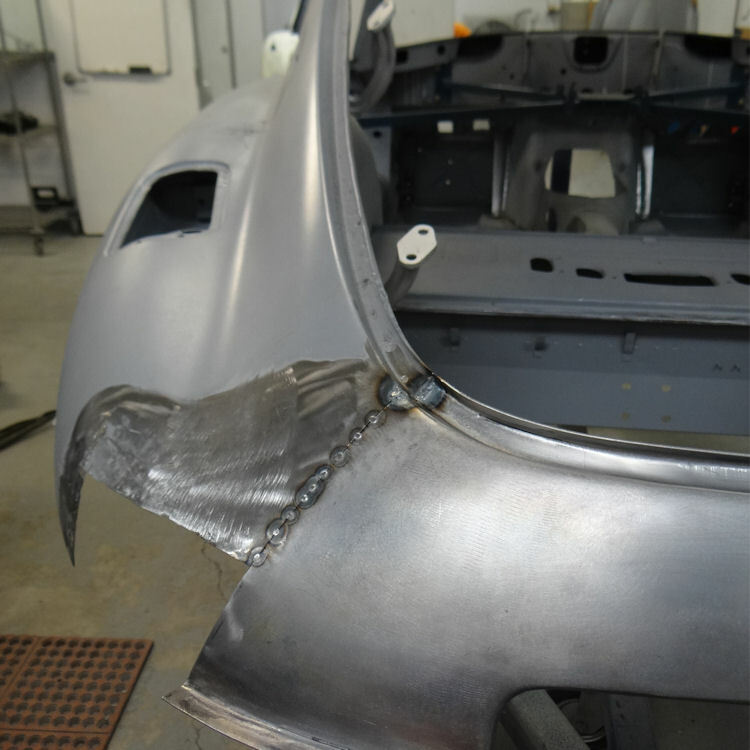 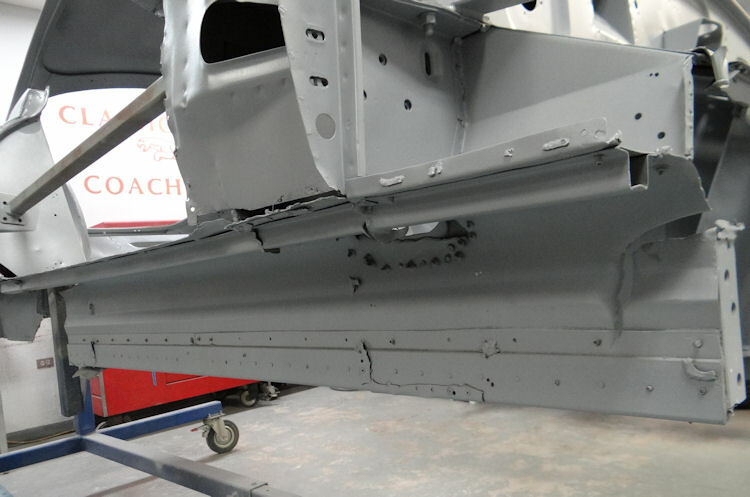 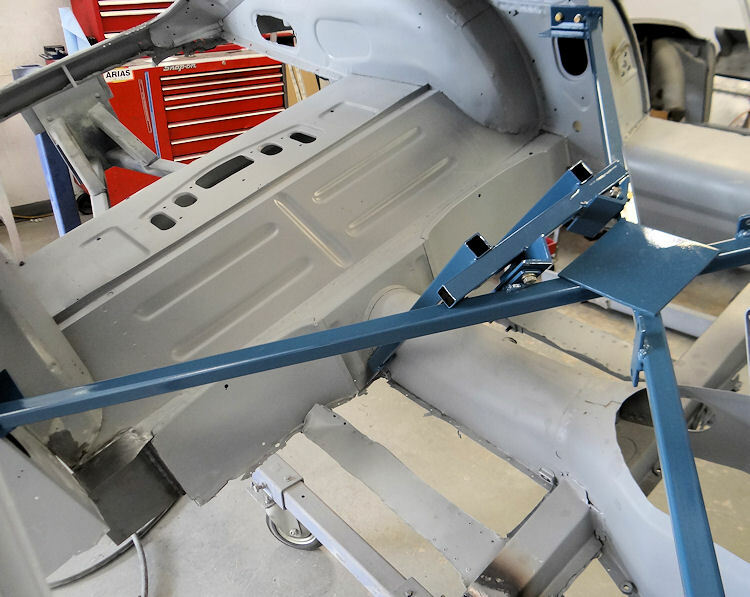 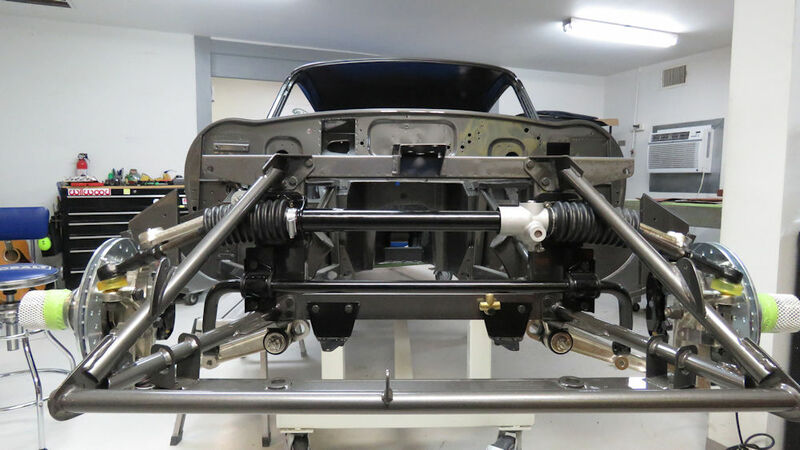 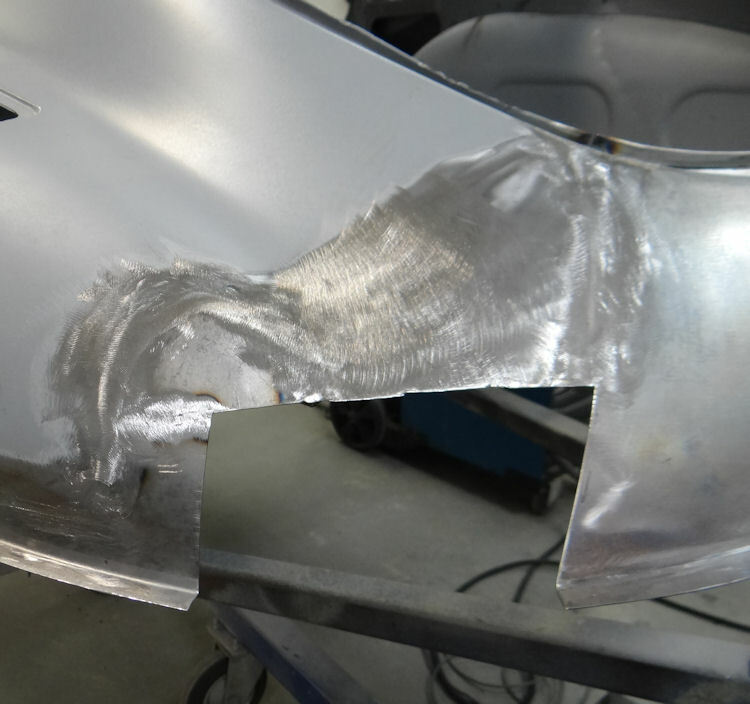 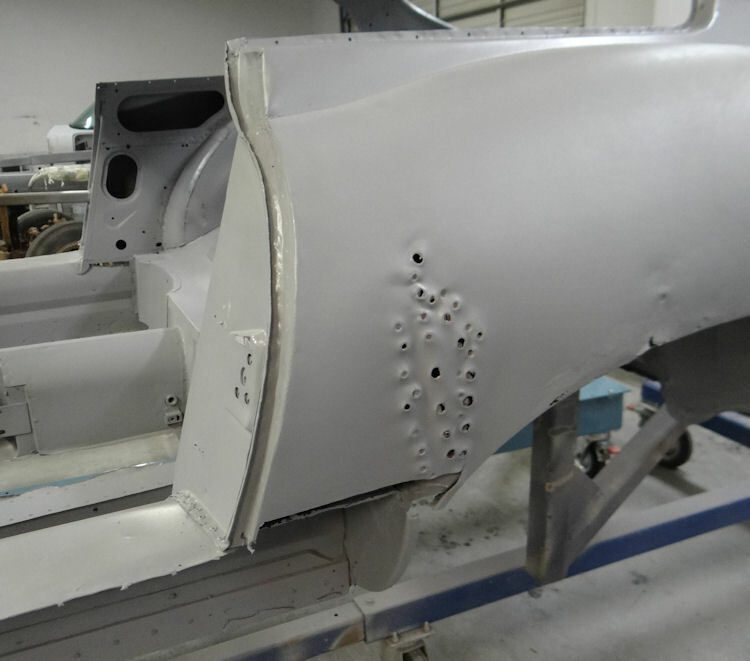 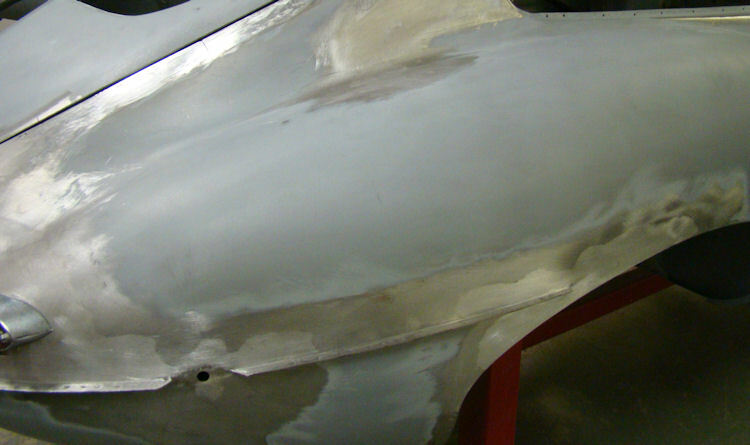 One of the most exciting stages of any restoration project is the painting process and I am delighted to report that we have begun applying the first of the Opalescent Gunmetal paint to this special E Type. 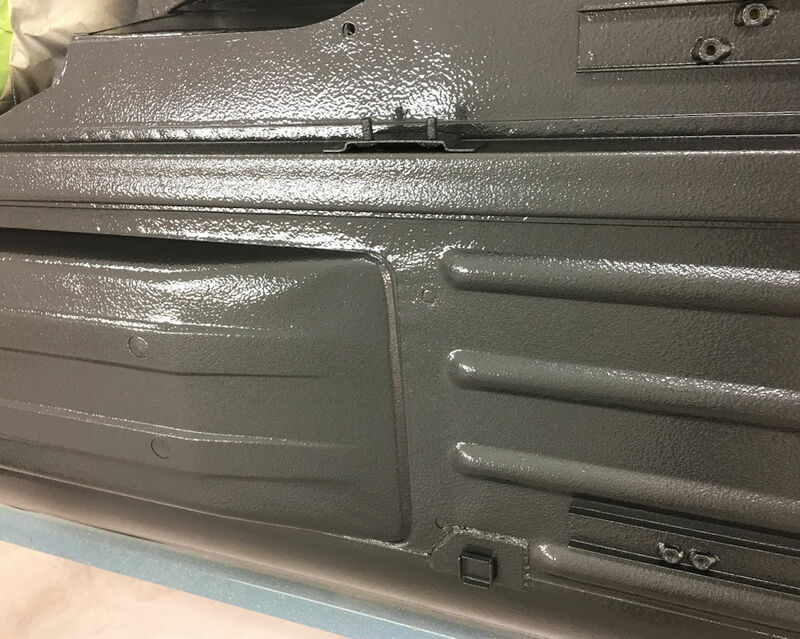 Yesterday we painted the cabin and boot compartment and earlier today we rocker guarded and painted the underside of the car. 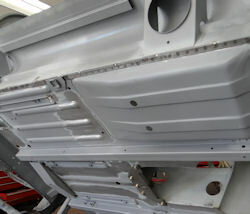 Lots more photos to follow over the next few days! 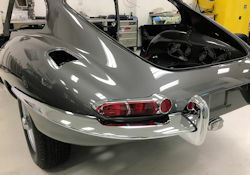 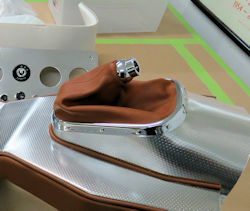 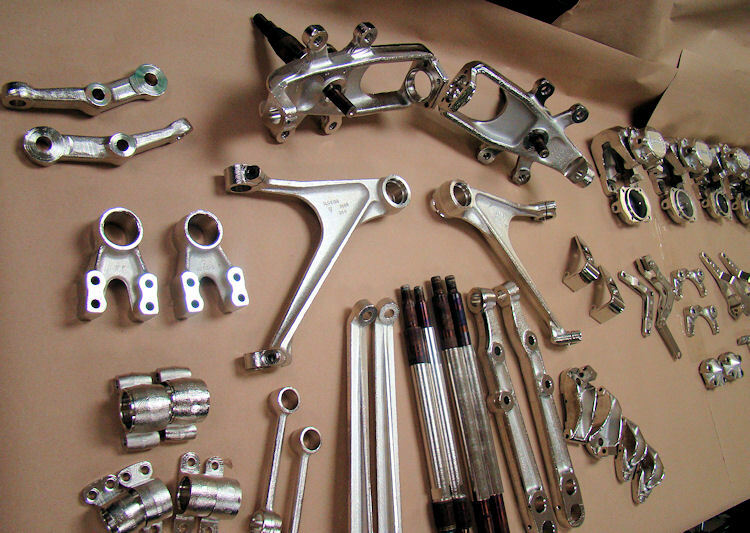 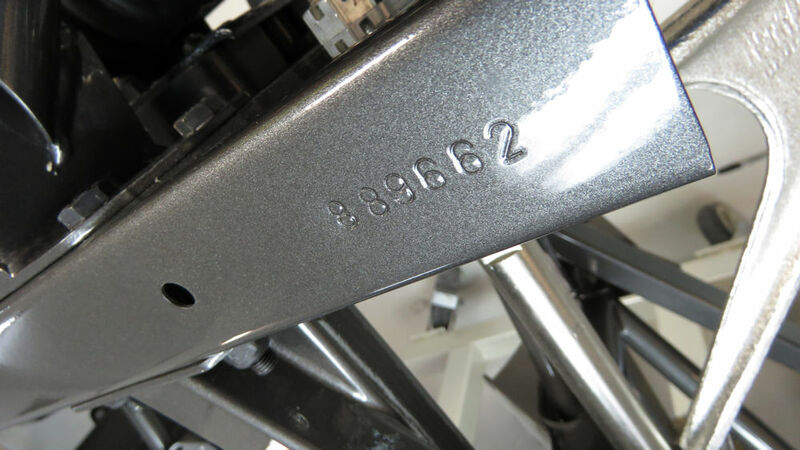 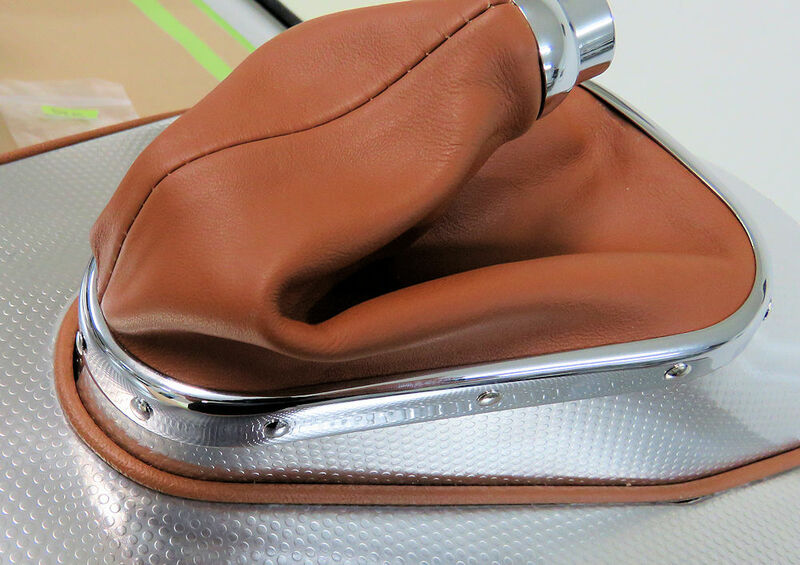 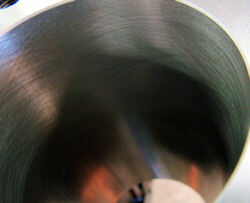 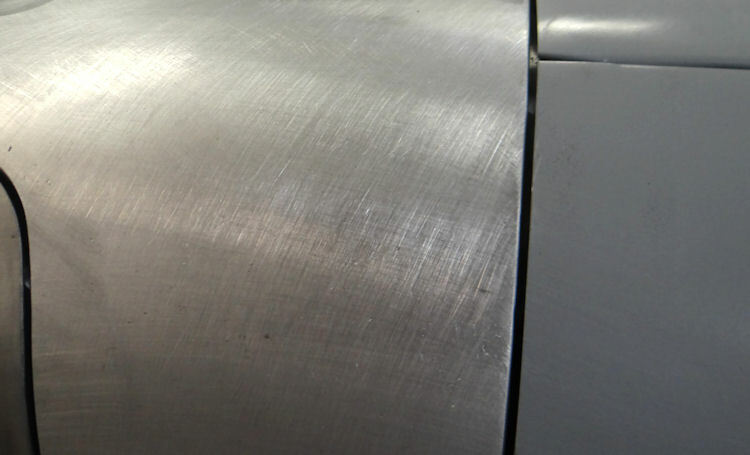 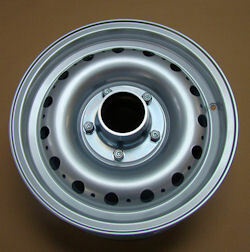 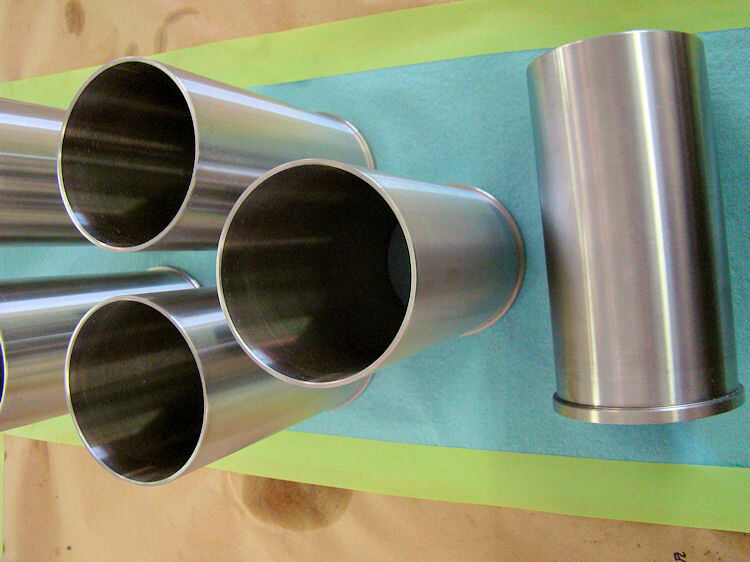 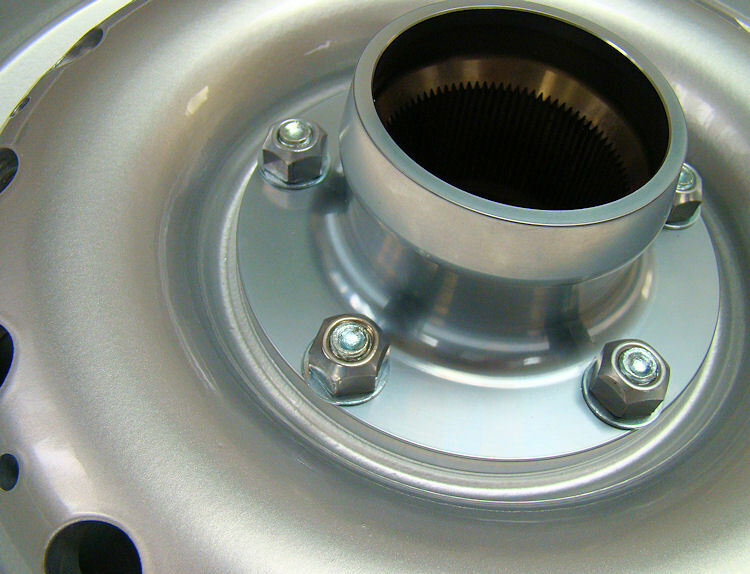 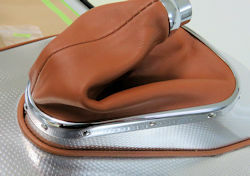 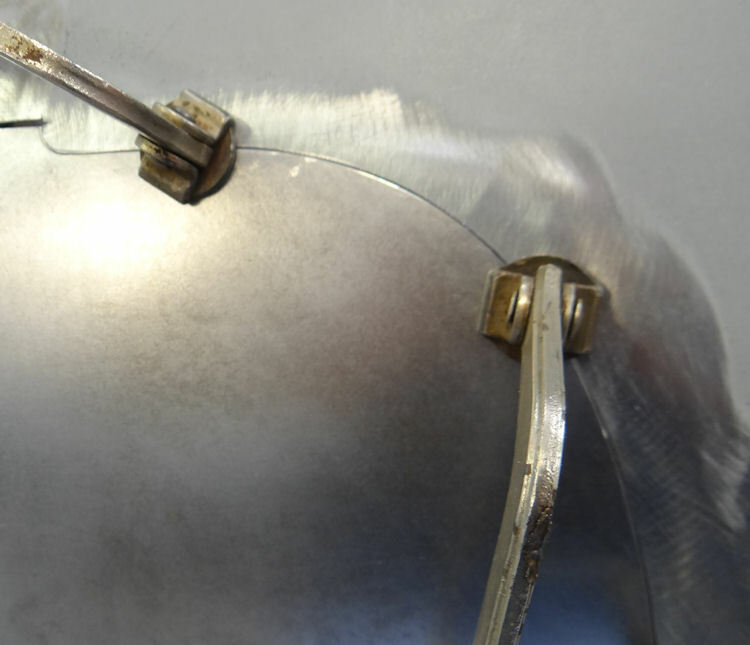 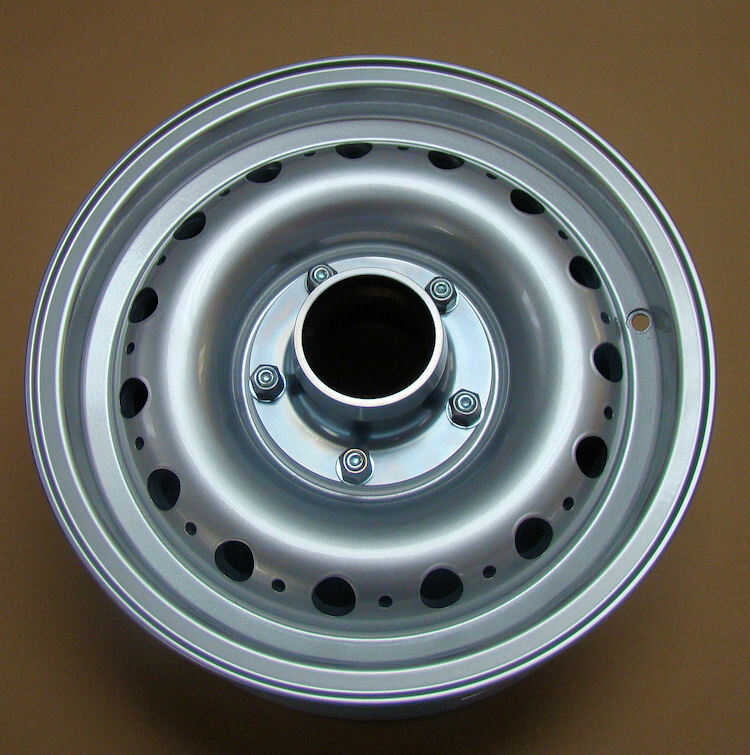 We have now completed the chrome trial fitting process and all of your brightwork has been submitted for chrome plating. 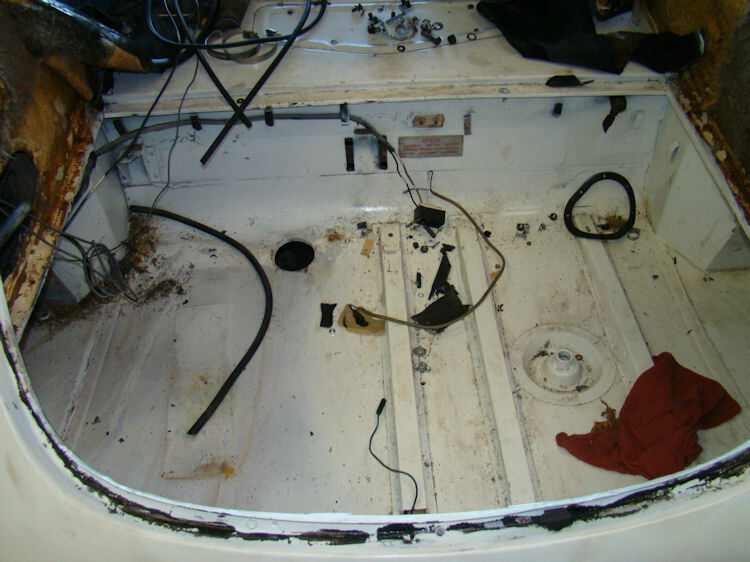 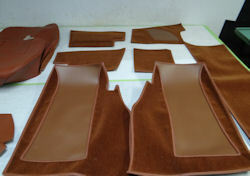 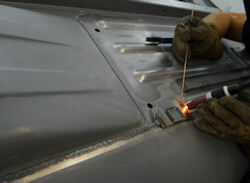 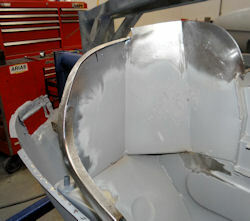 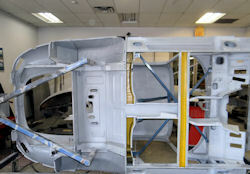 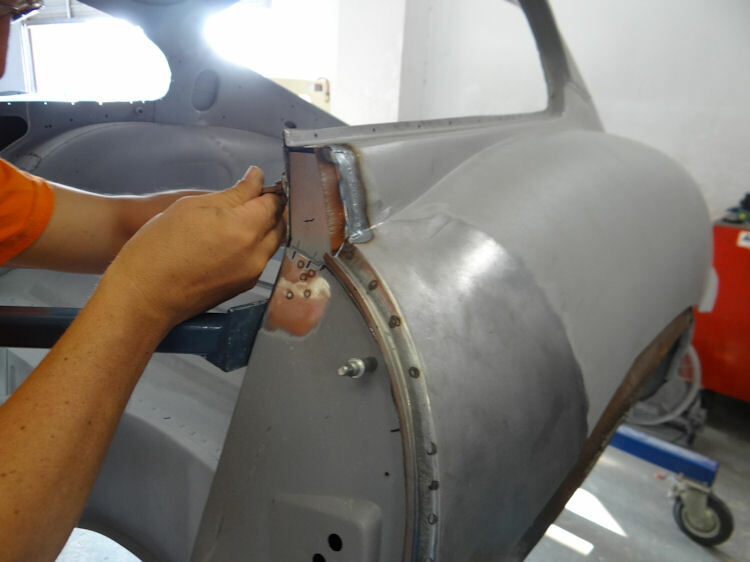 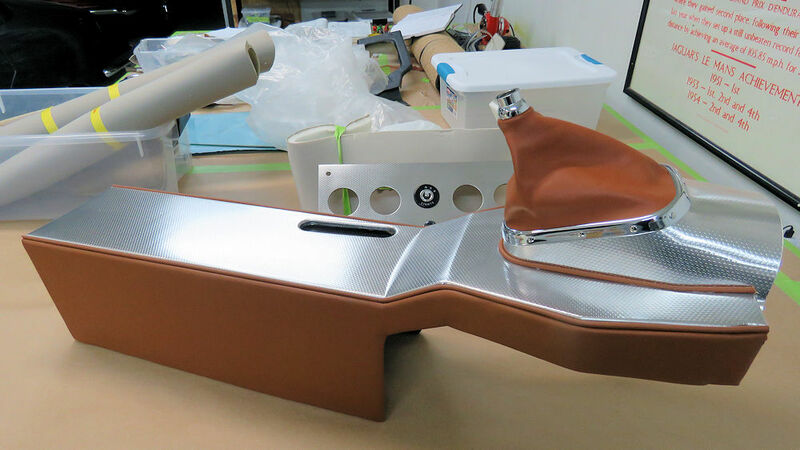 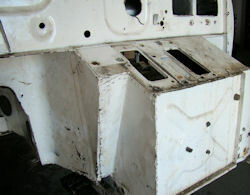 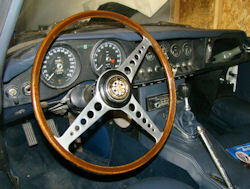 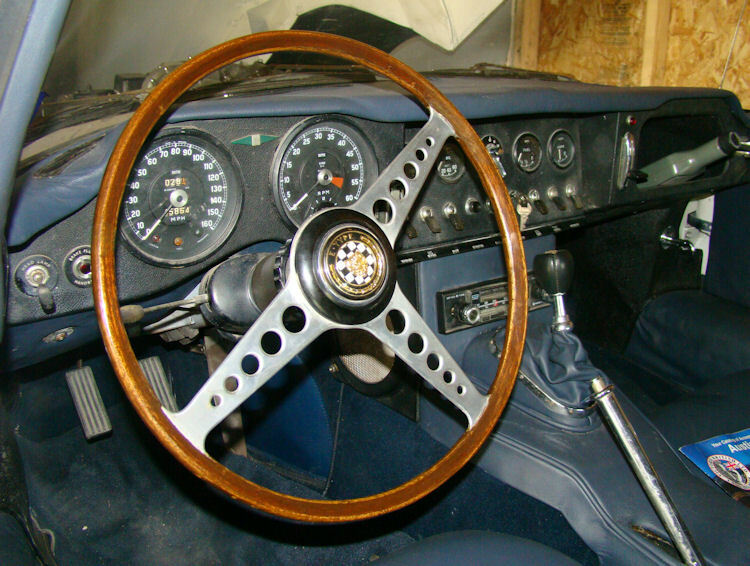 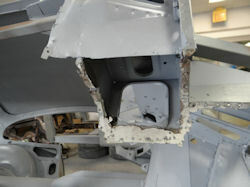 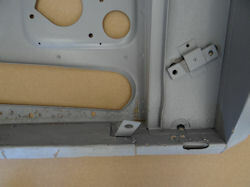 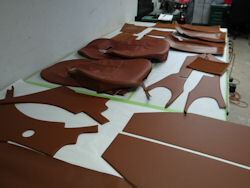 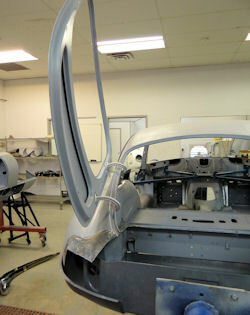 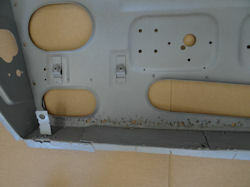 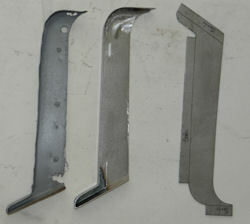 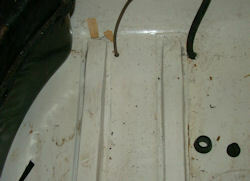 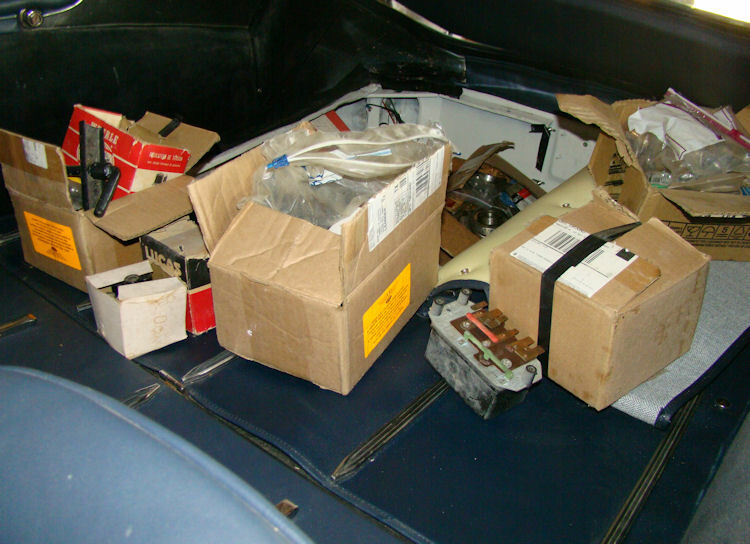 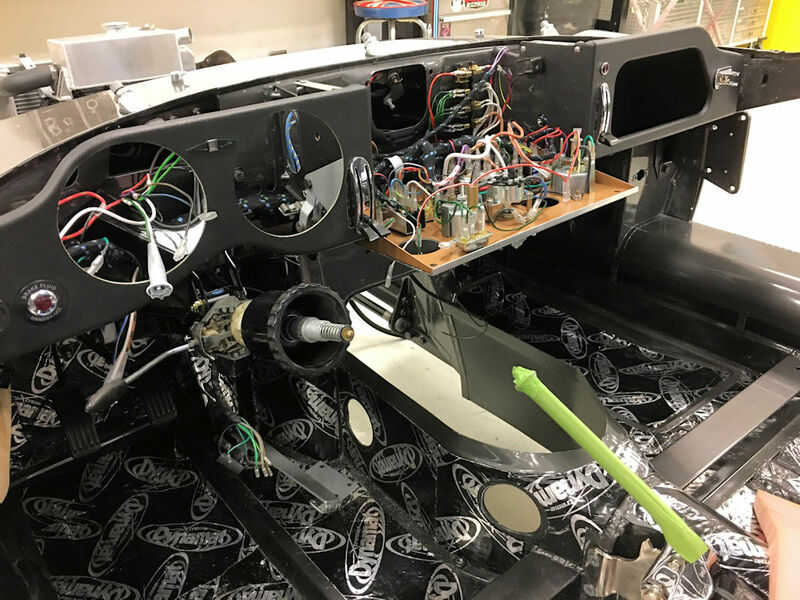 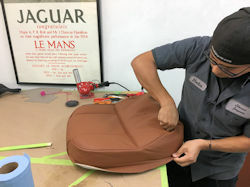 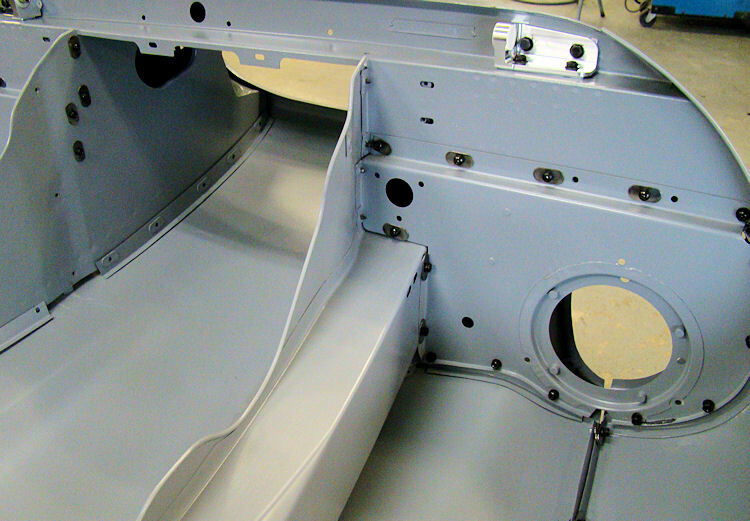 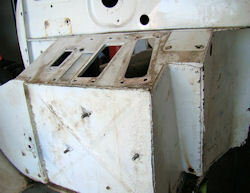 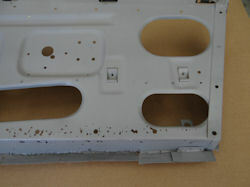 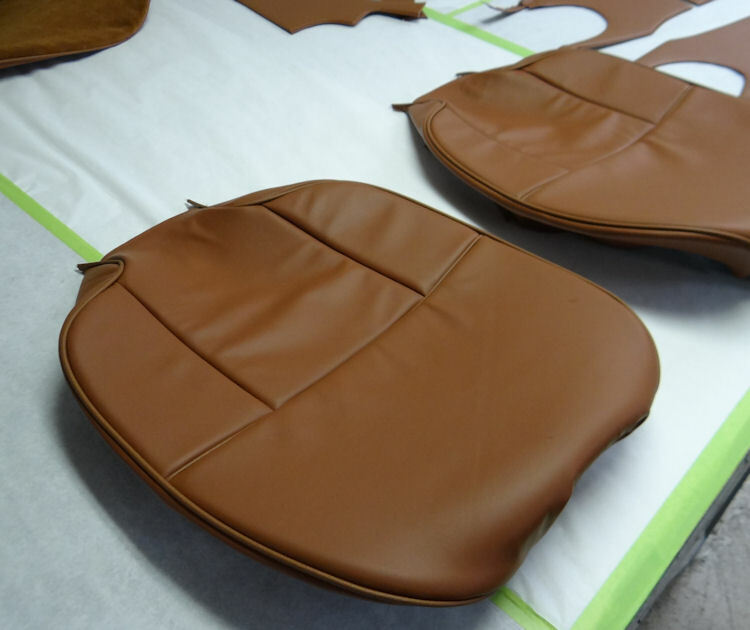 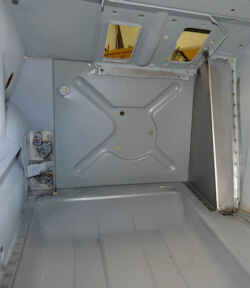 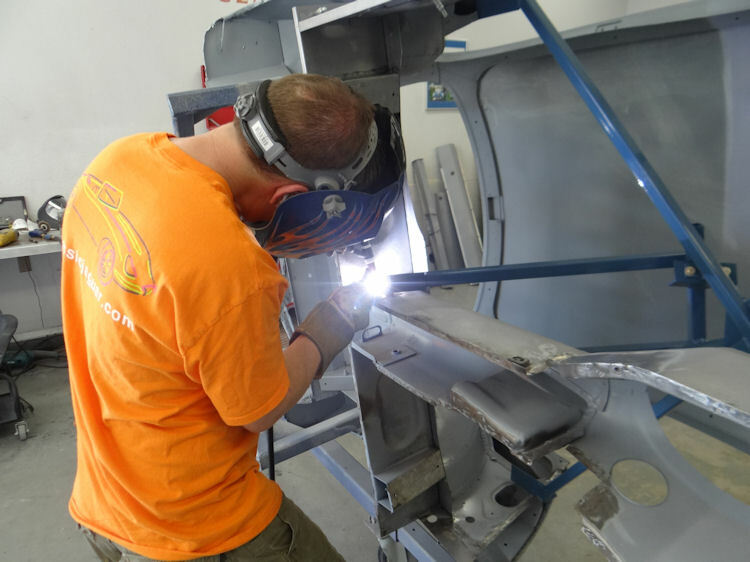 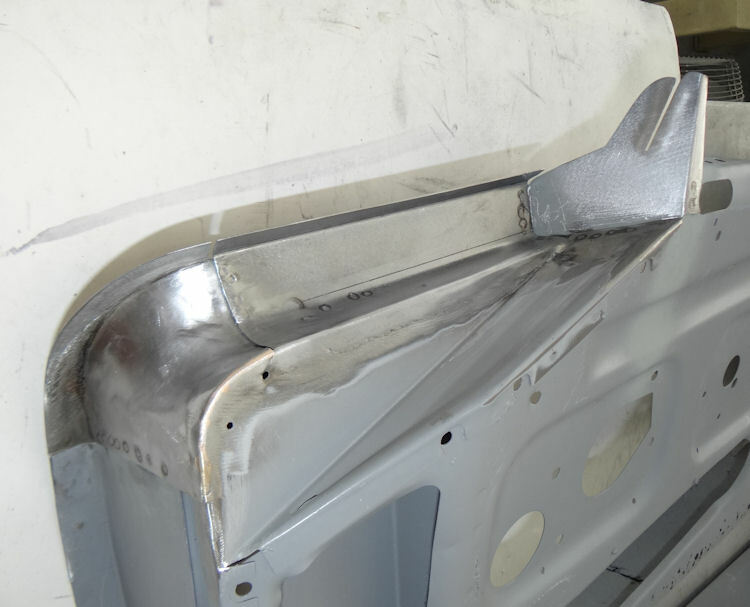 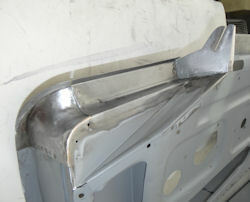 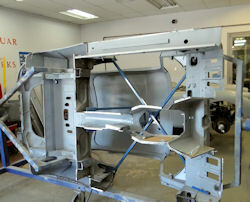 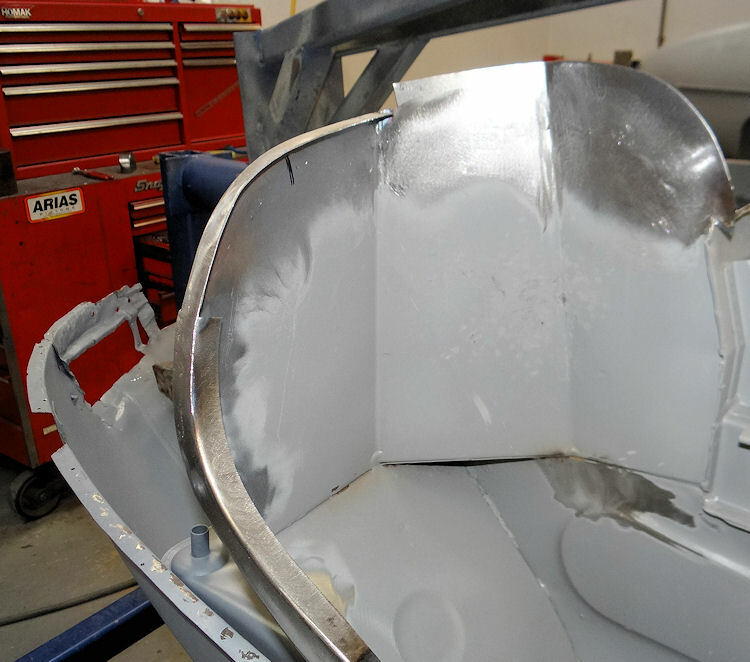 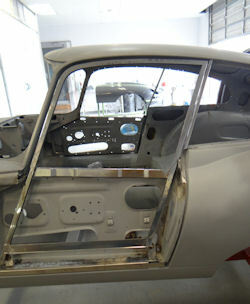 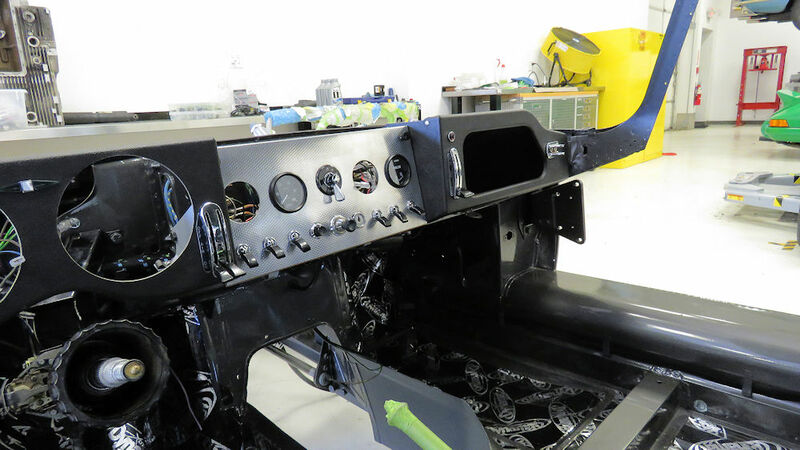 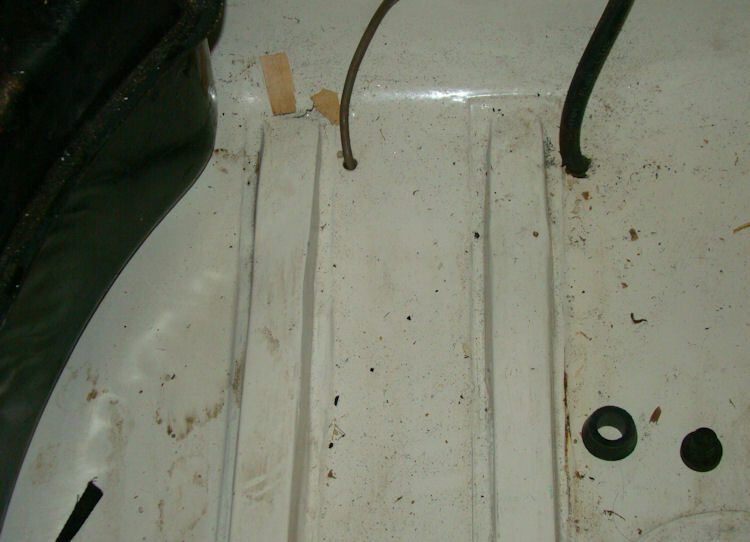 In the trim room, Hector has been busy restoring and trimming the dash panels and the center console. 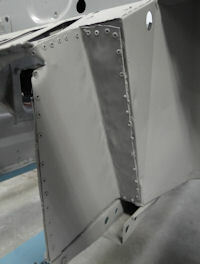 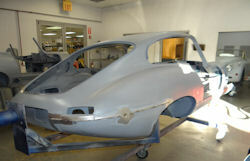 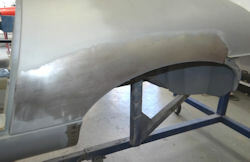 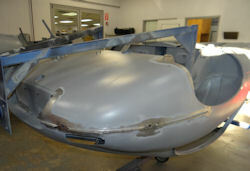 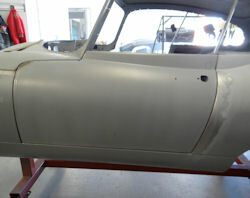 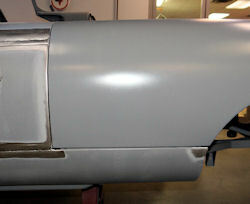 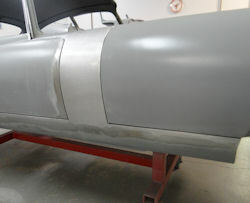 We have now completed all of the bodywork and applied three coats of Superbuild Polyester primer. 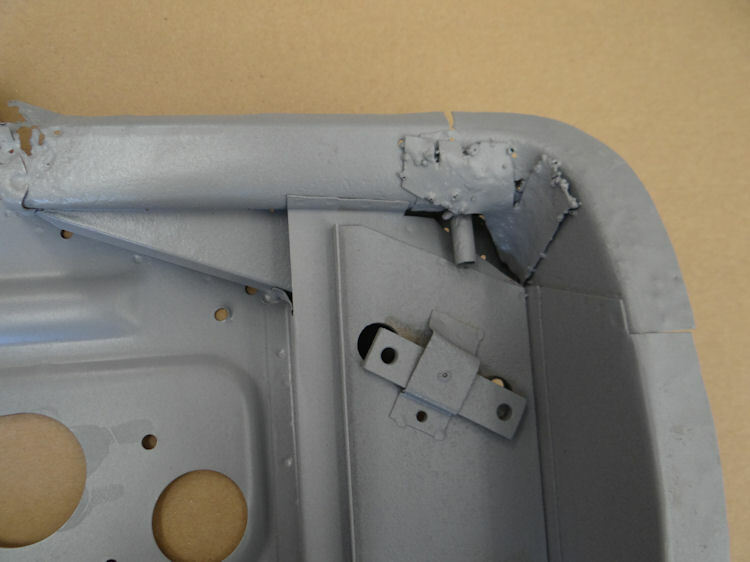 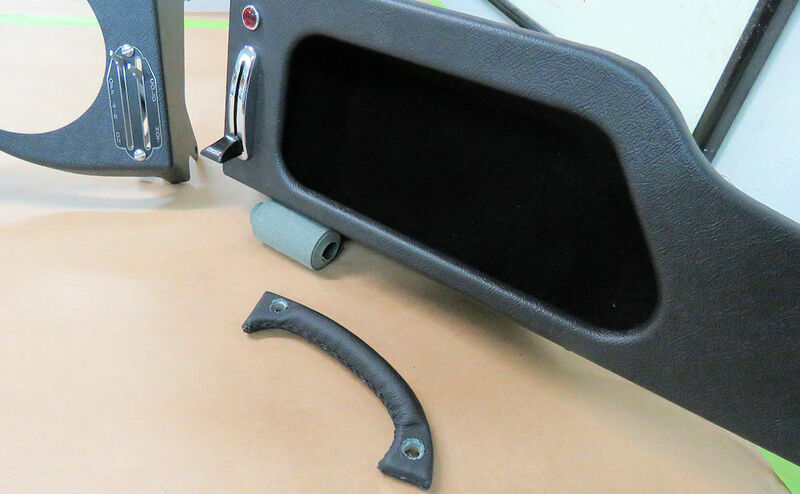 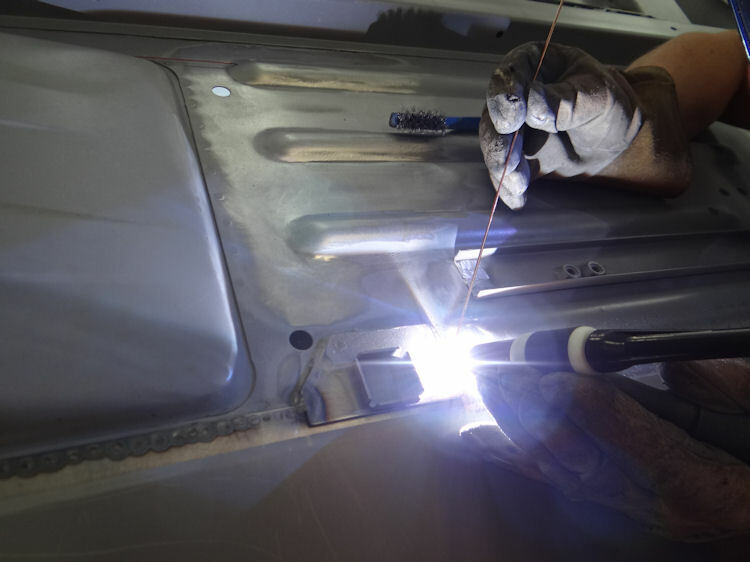 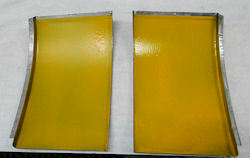 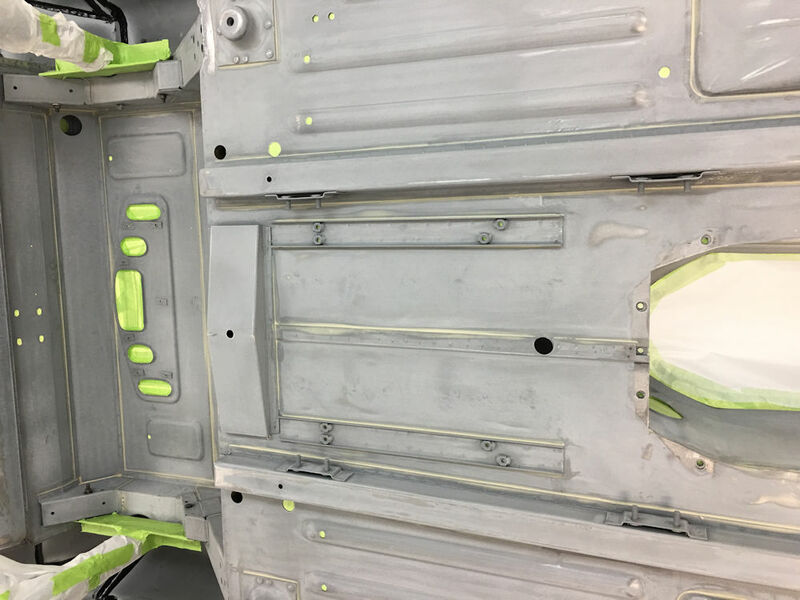 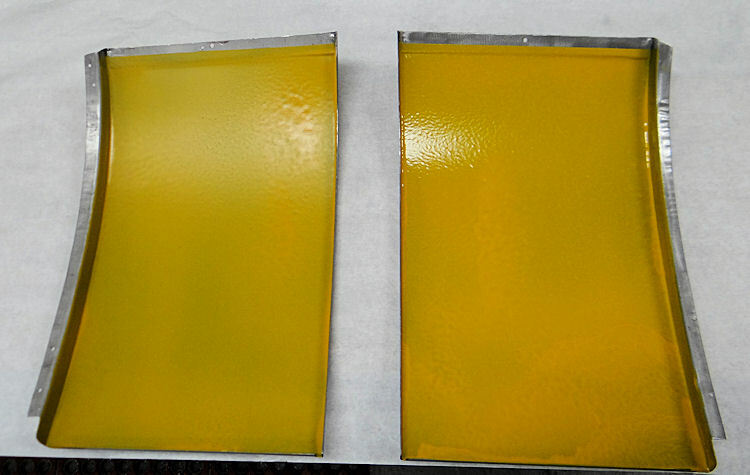 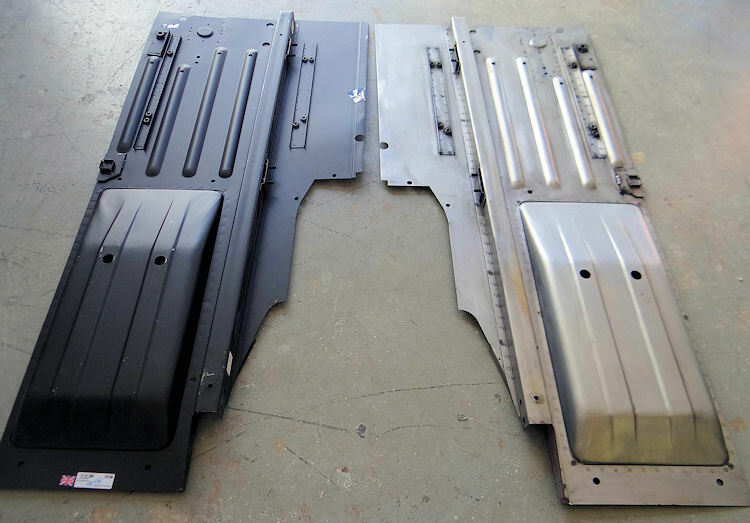 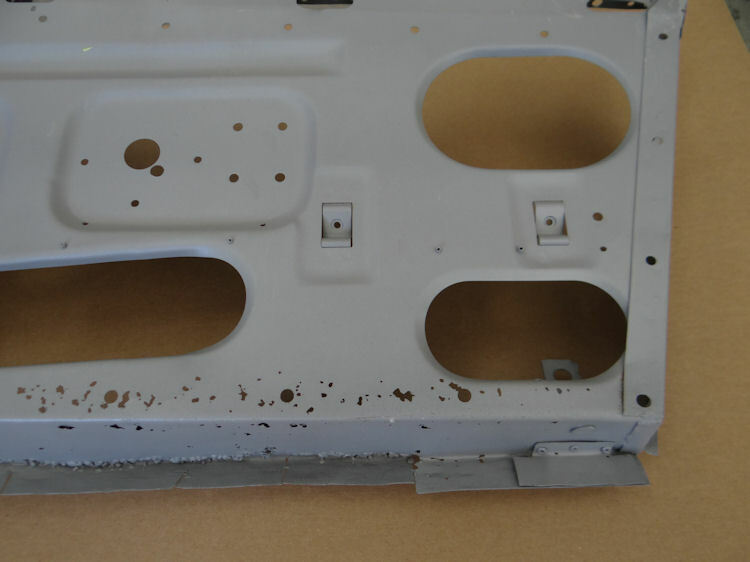 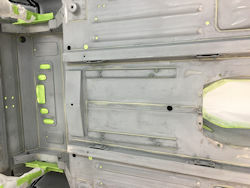 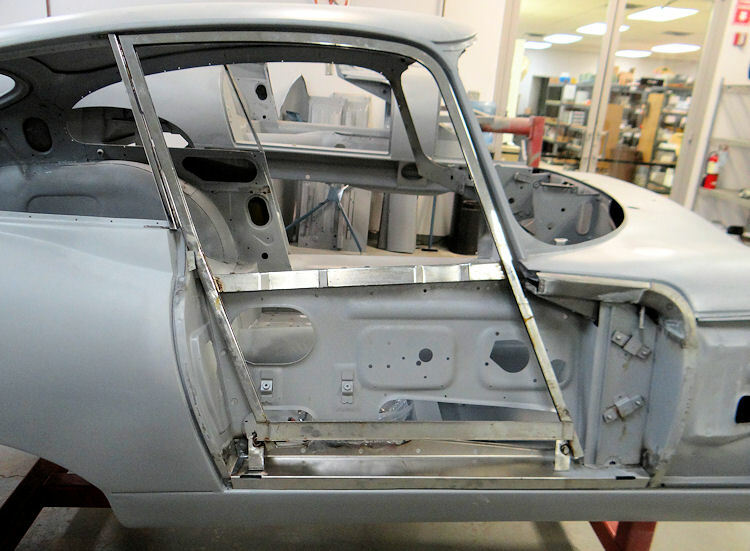 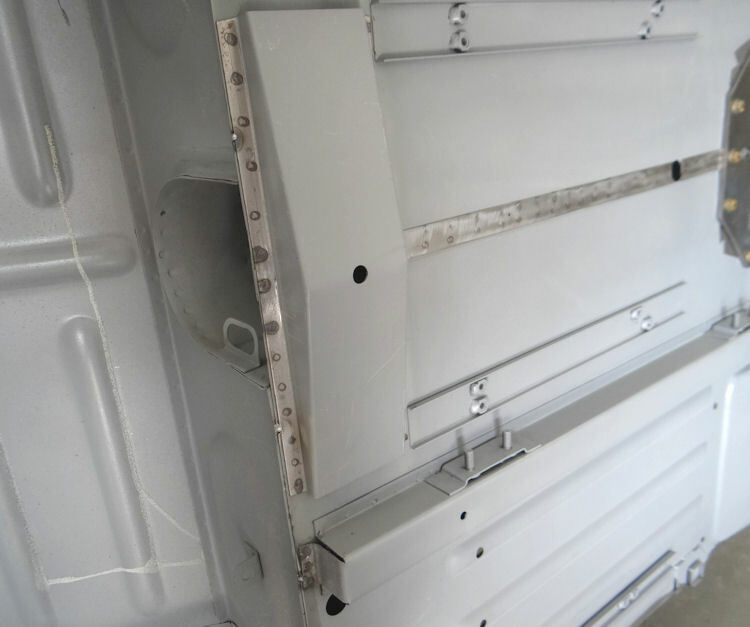 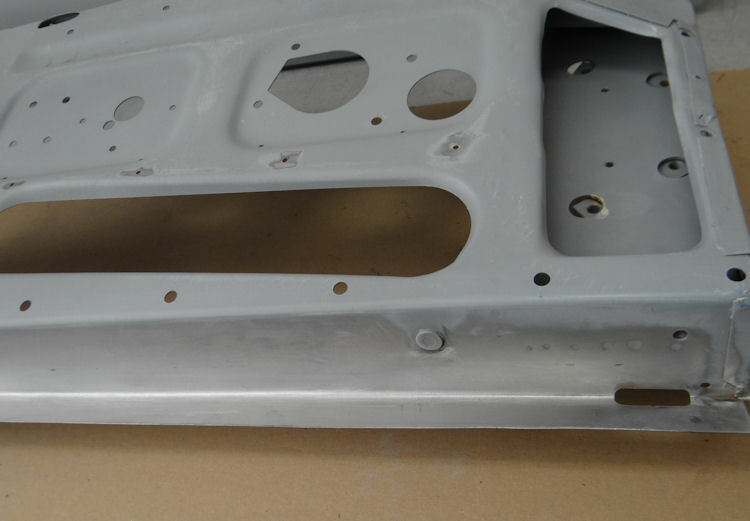 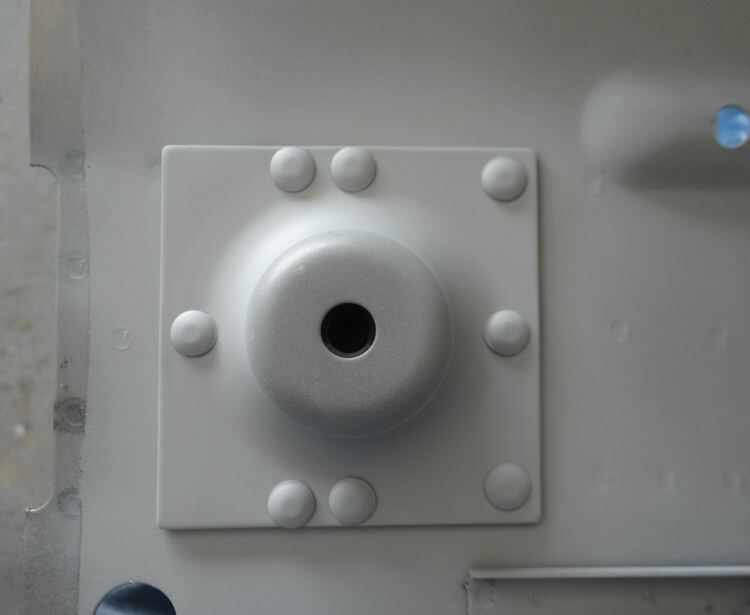 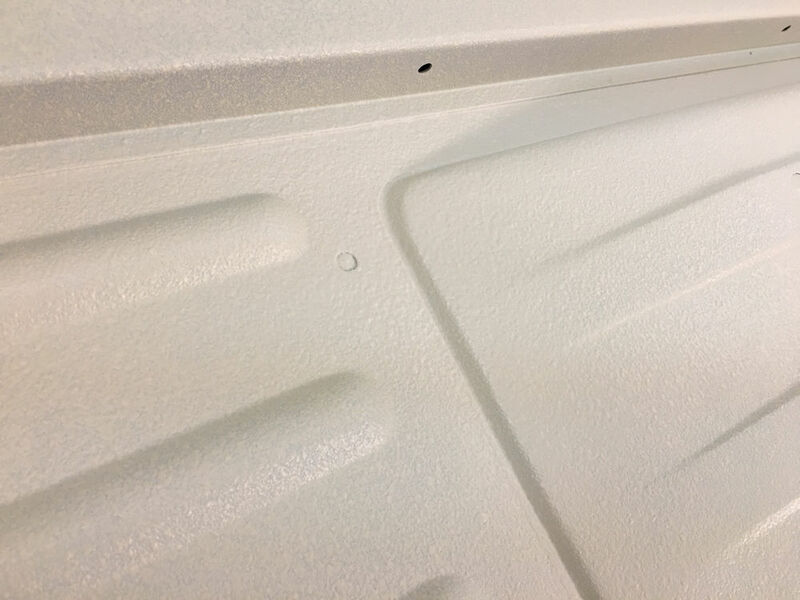 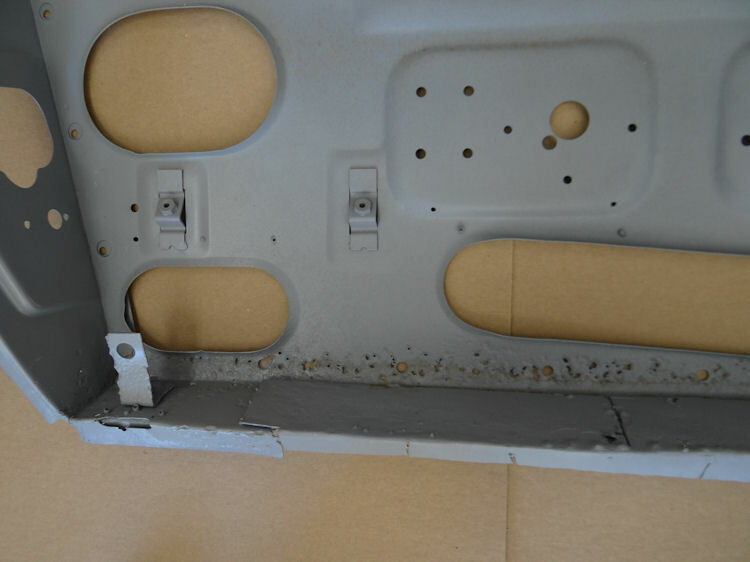 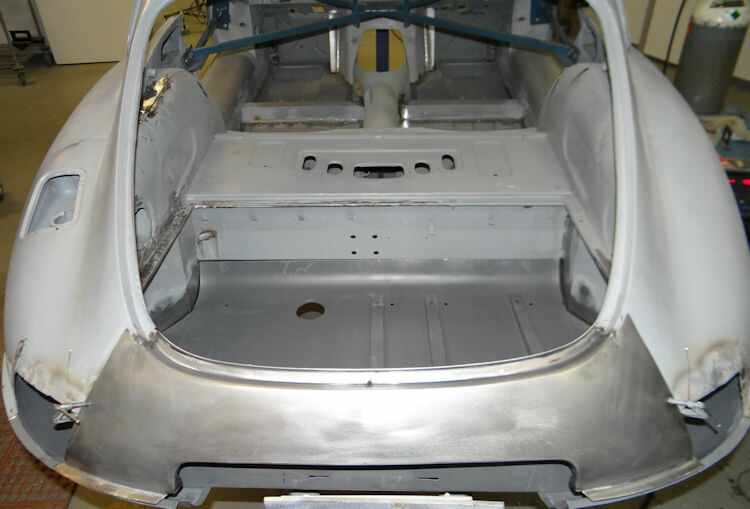 It is now time to assemble and begin fitting your new bonnet..
Having replaced substantial sections of both door frames, we trial fitted the window frames and chrome B pillars prior to installing the outer door skins. 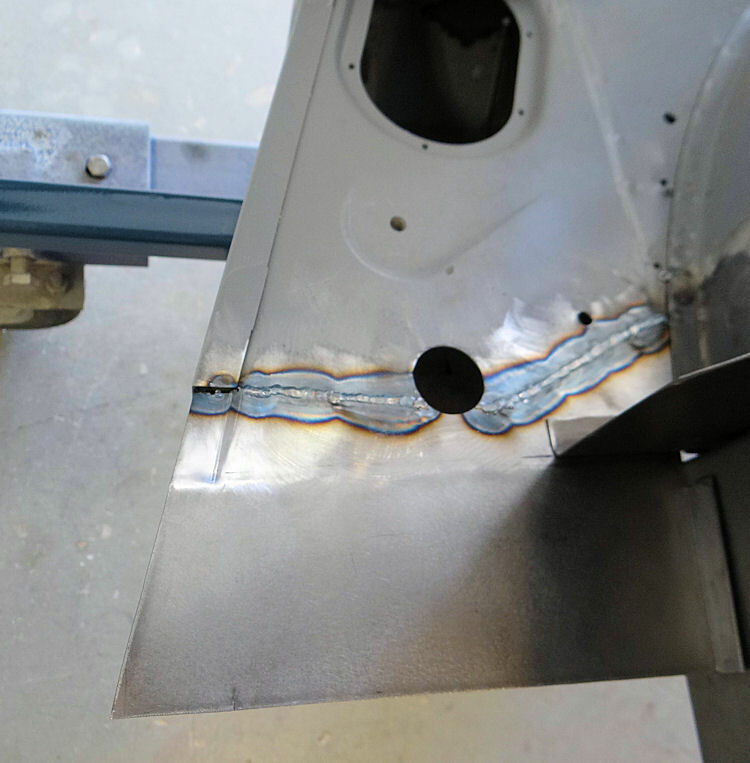 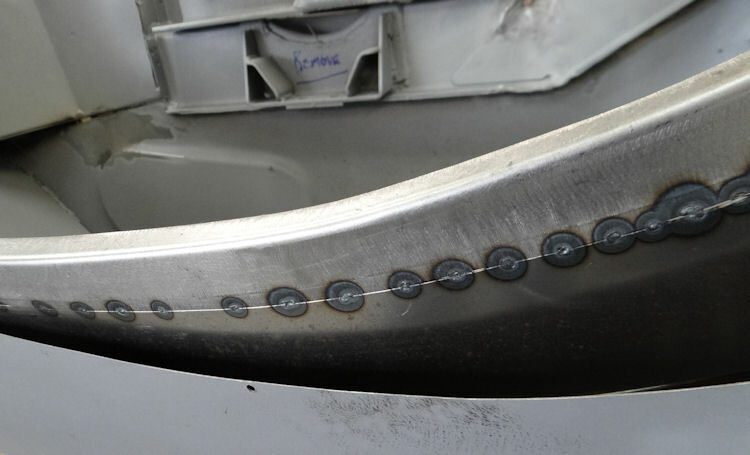 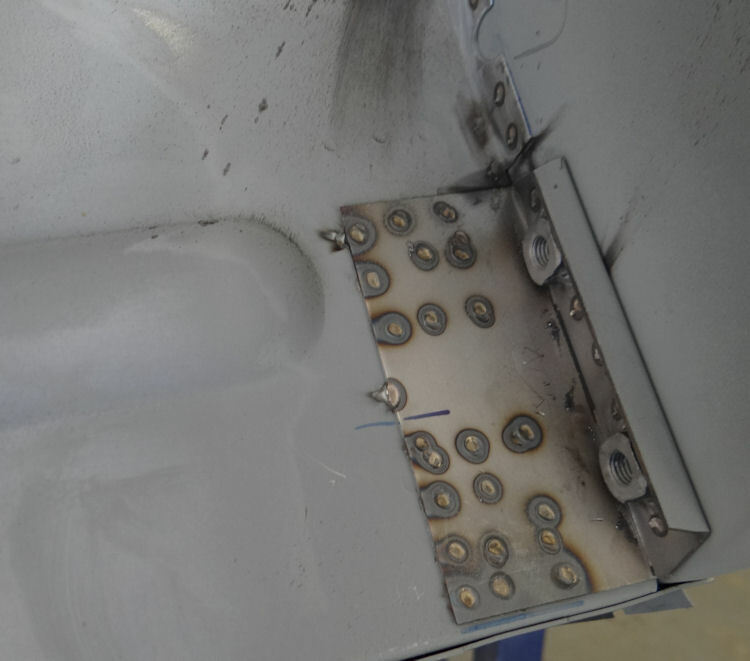 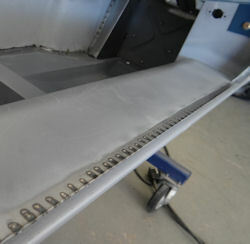 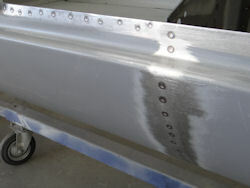 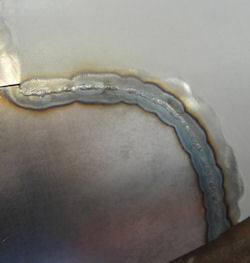 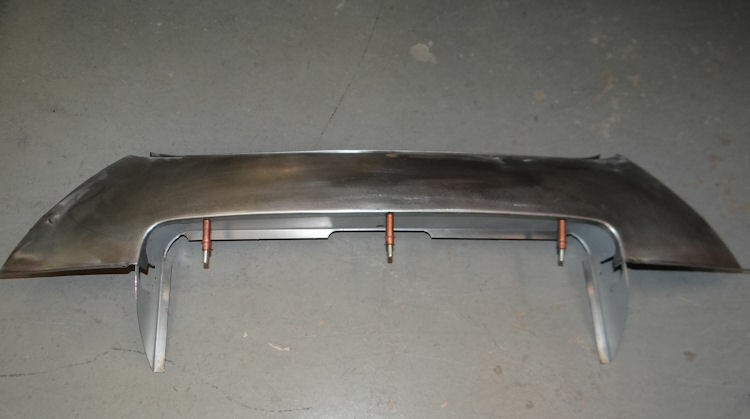 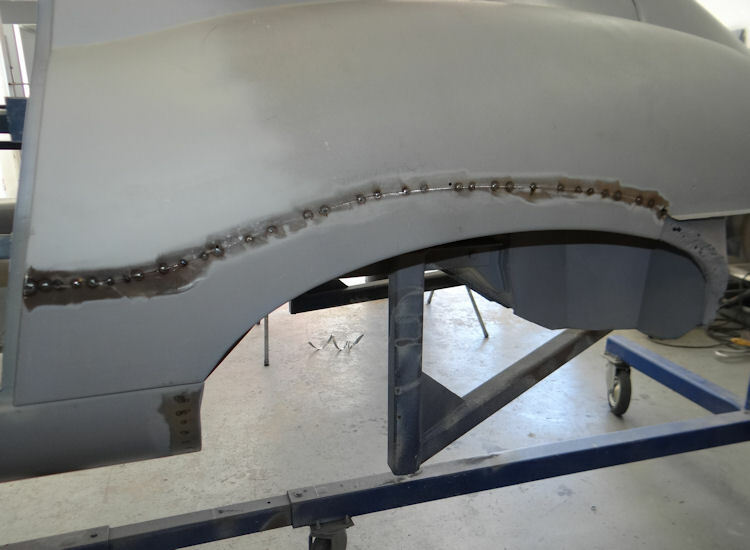 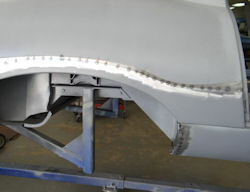 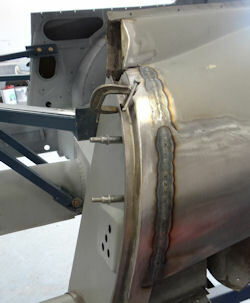 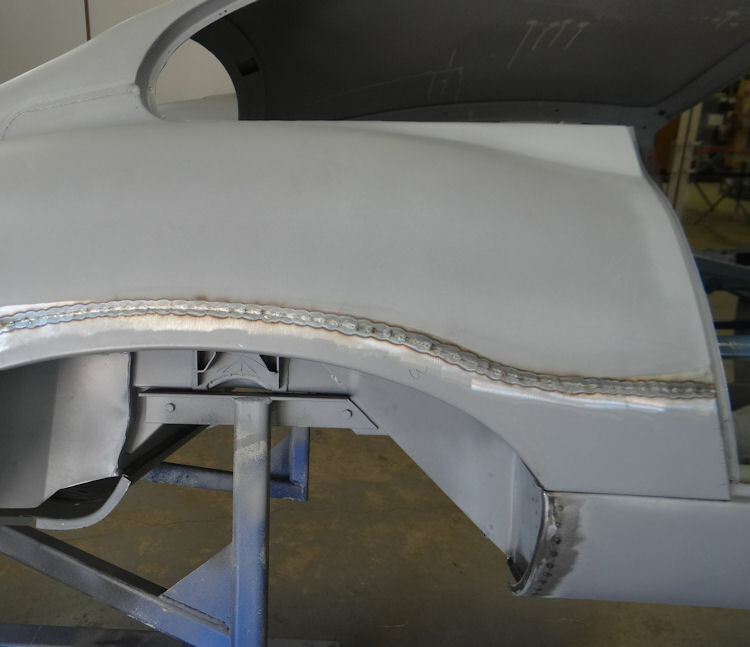 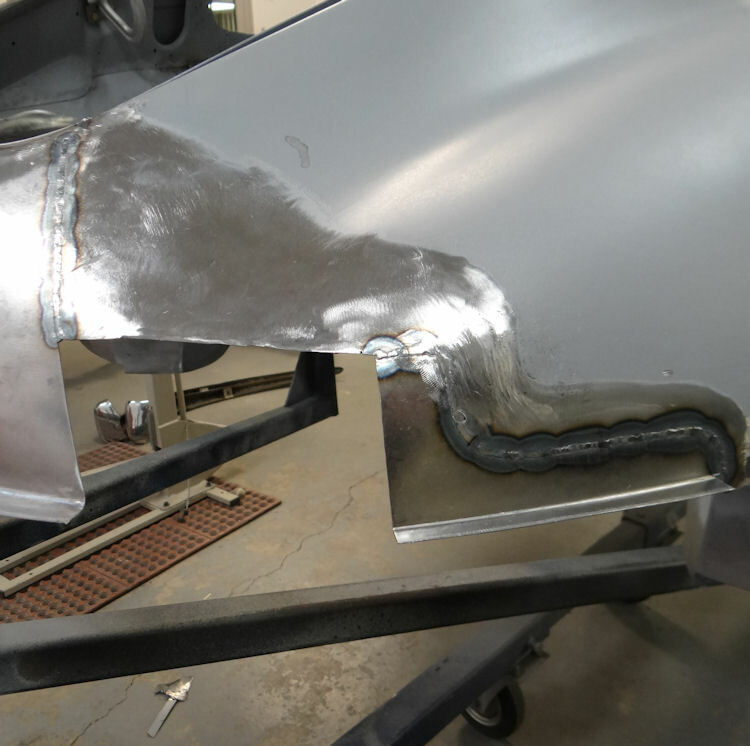 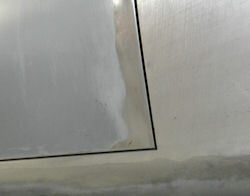 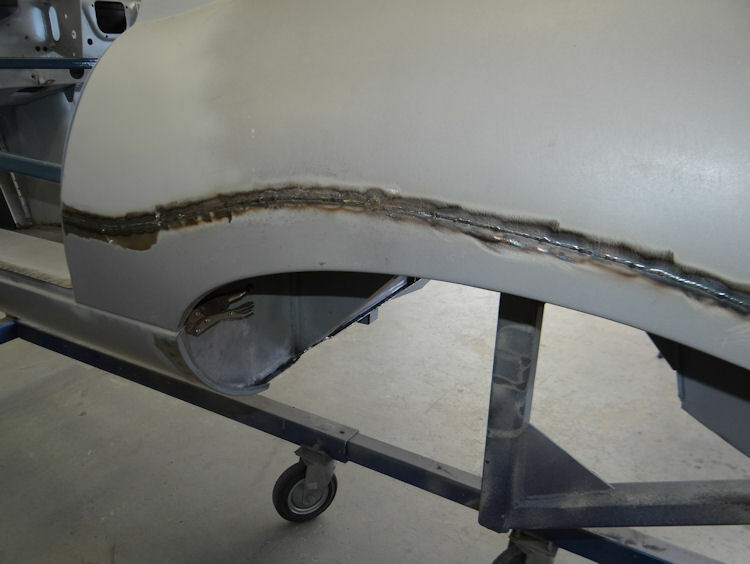 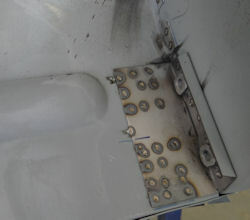 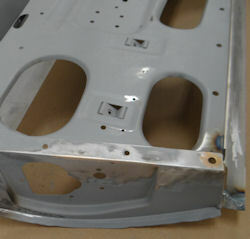 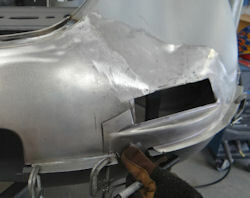 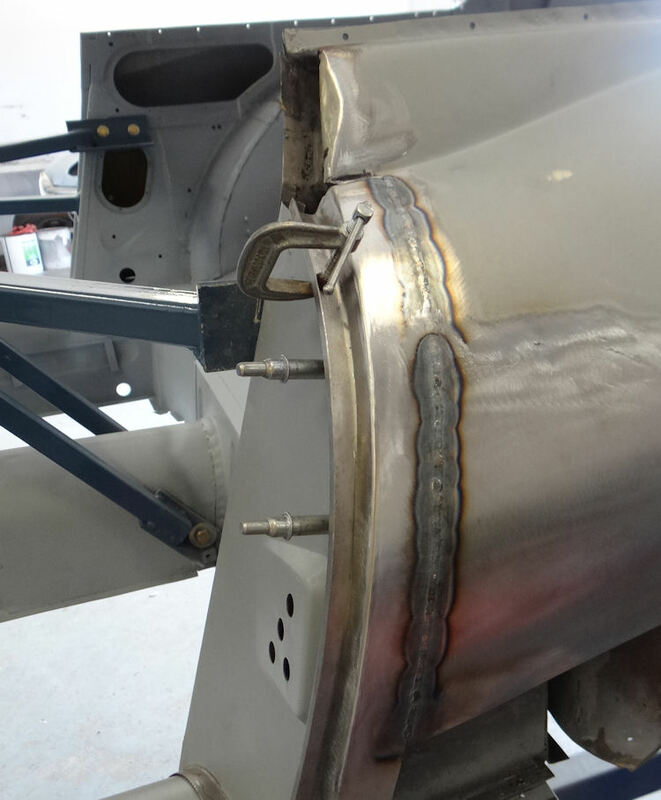 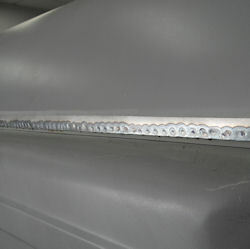 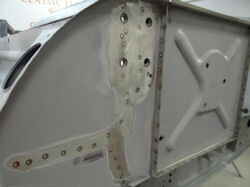 Welds plaished and metal finished Starting to look much better! 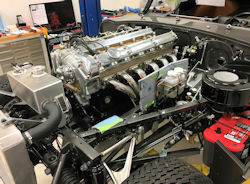 Starting to see the light at the end of the tunnel, now. 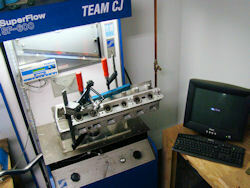 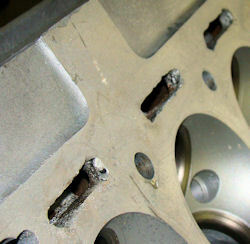 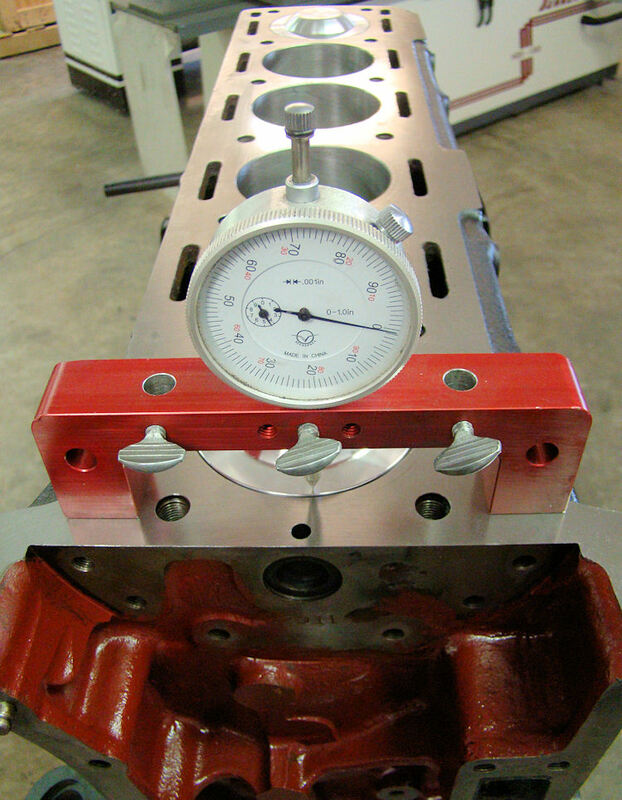 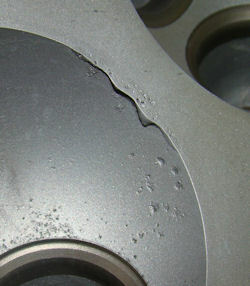 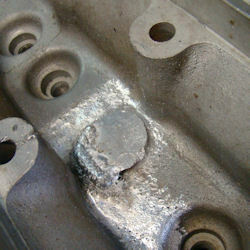 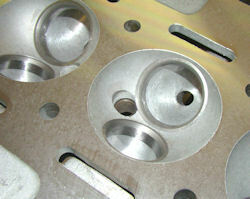 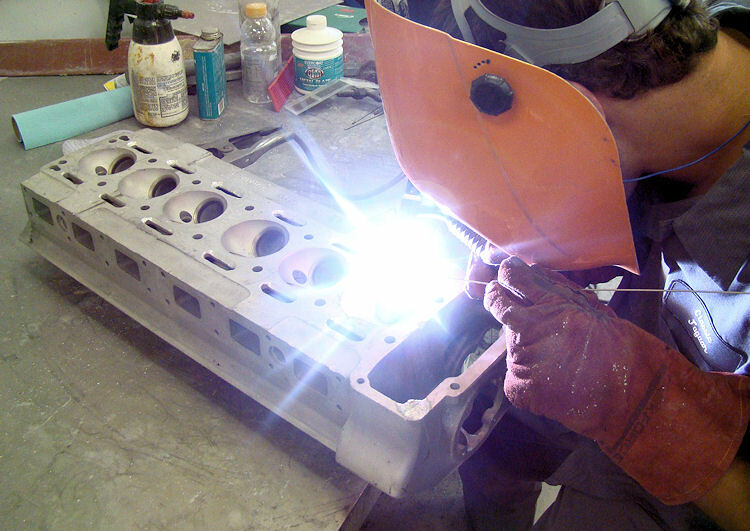 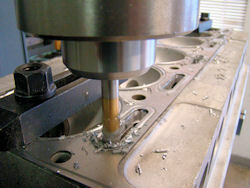 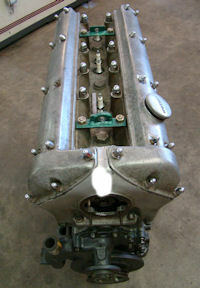 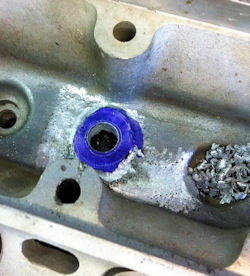 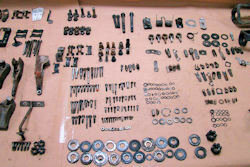 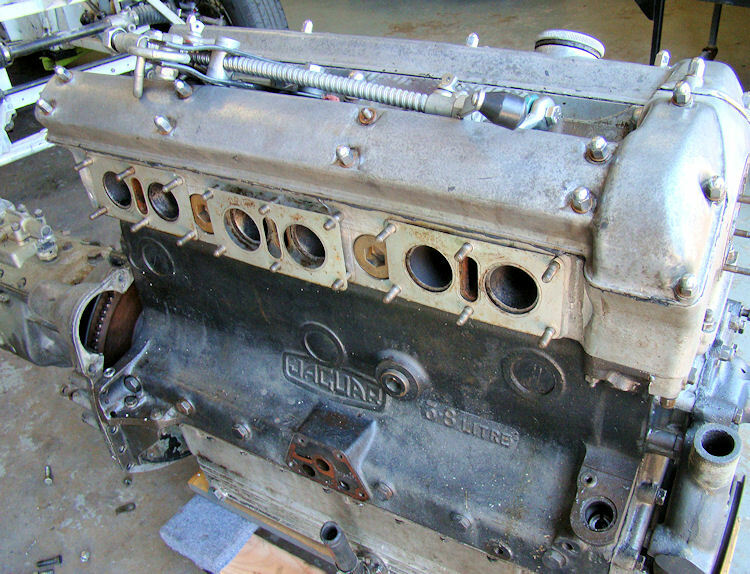 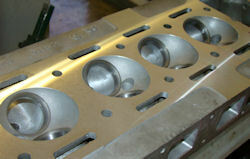 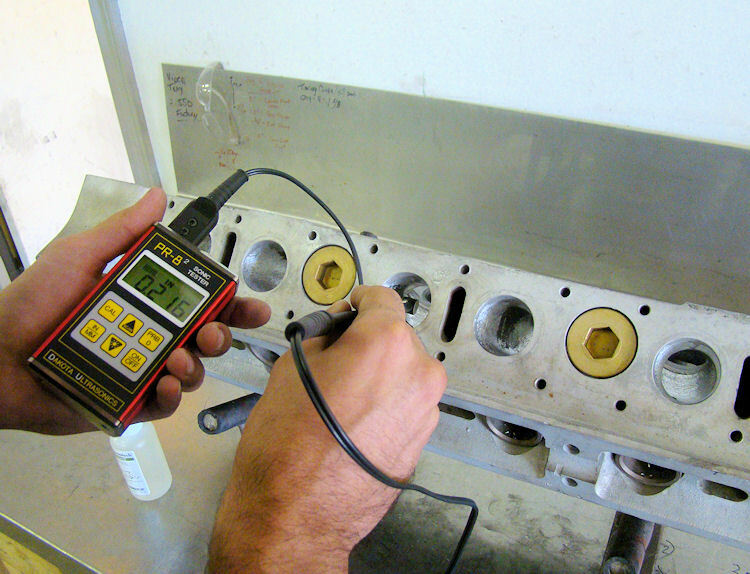 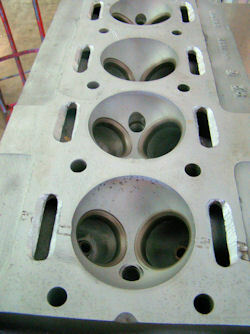 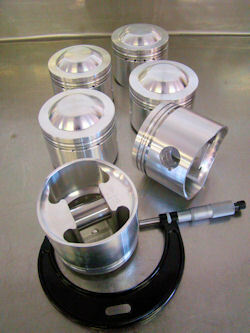 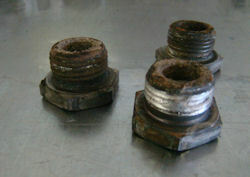 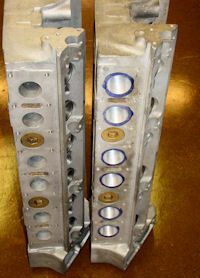 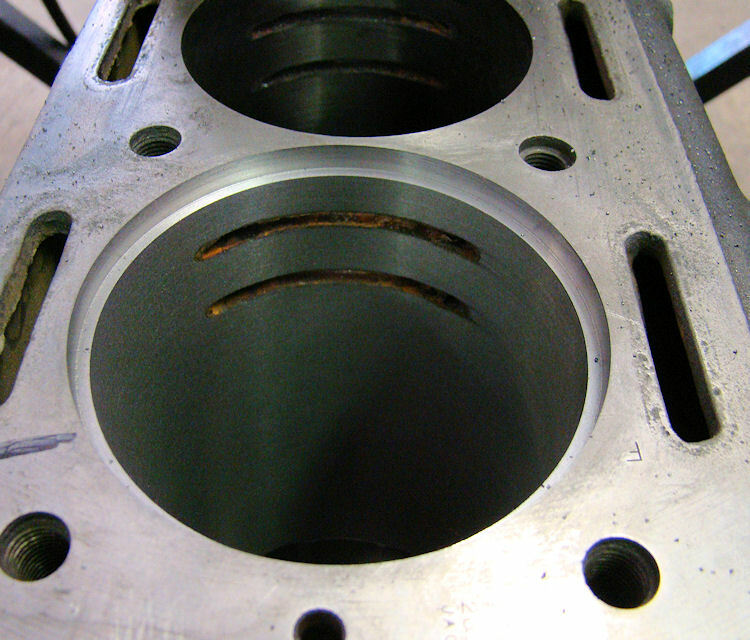 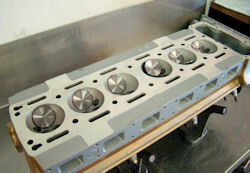 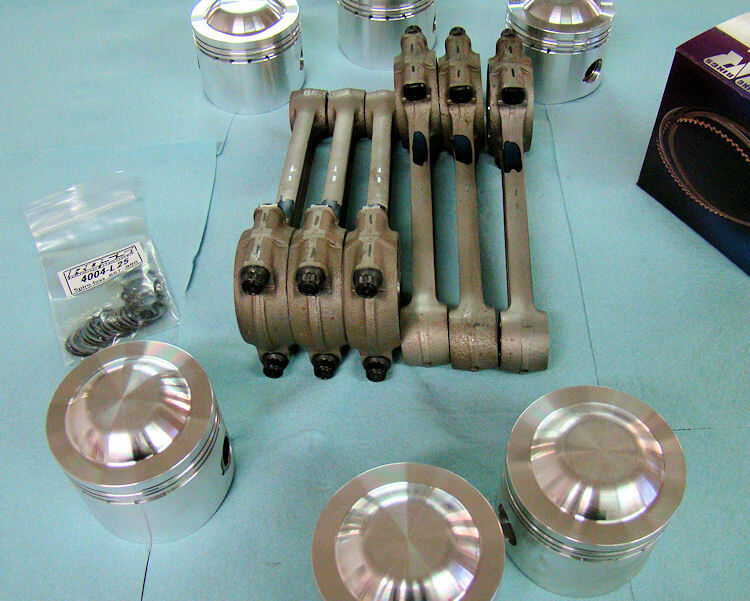 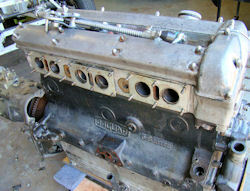 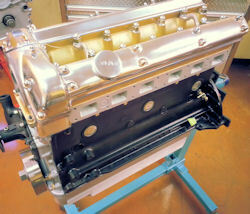 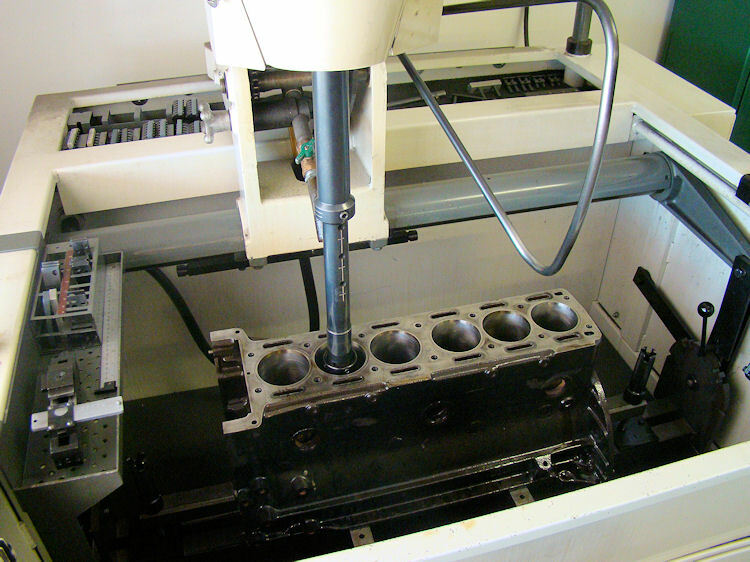 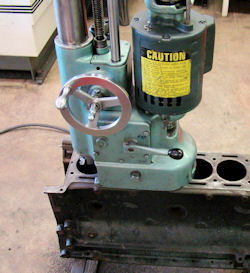 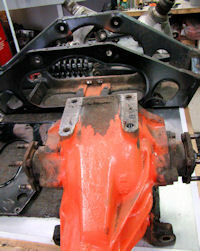 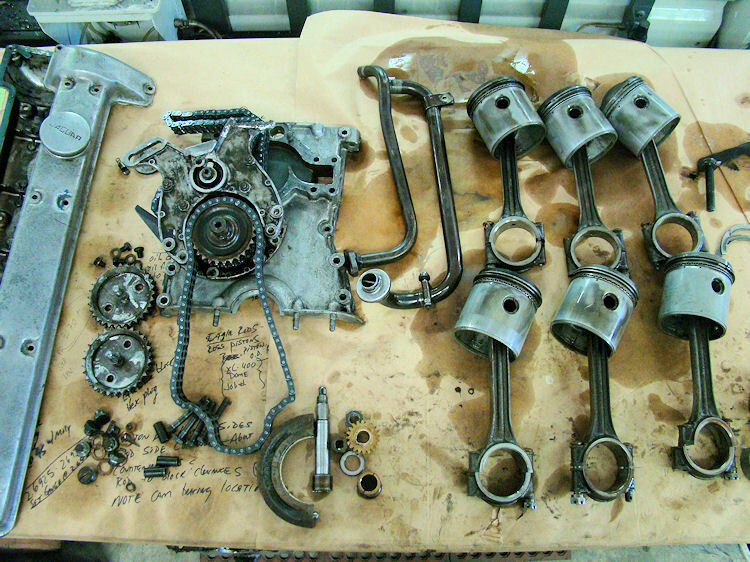 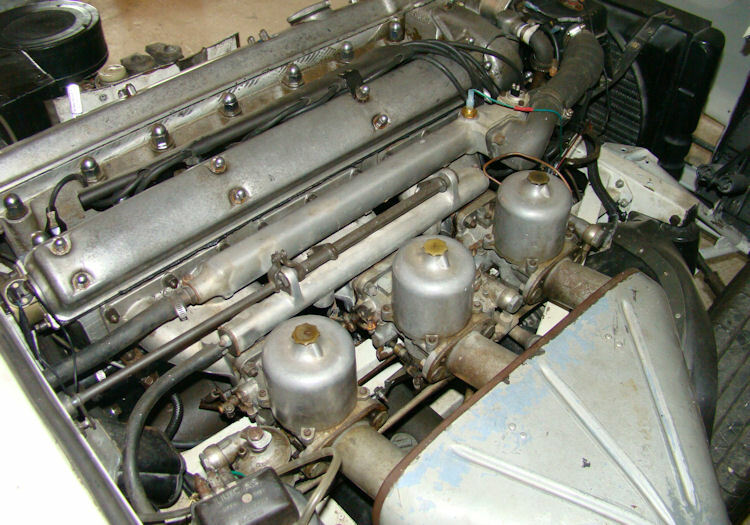 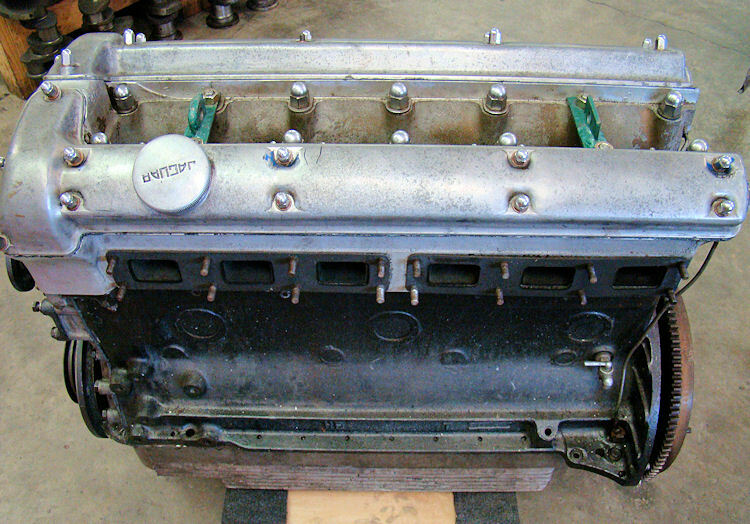 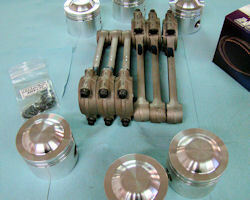 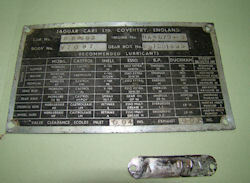 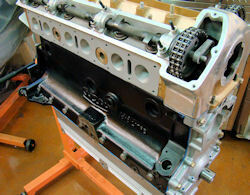 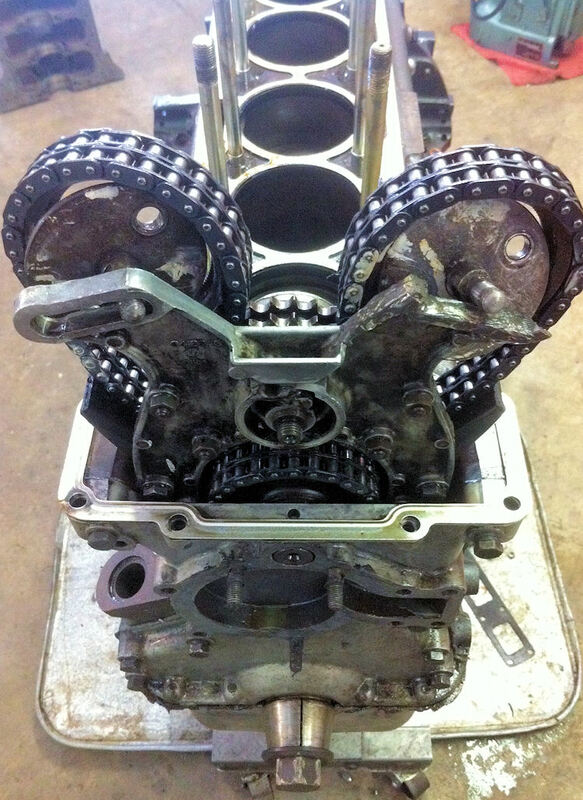 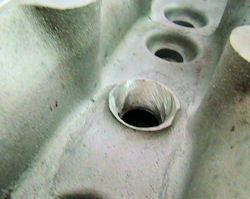 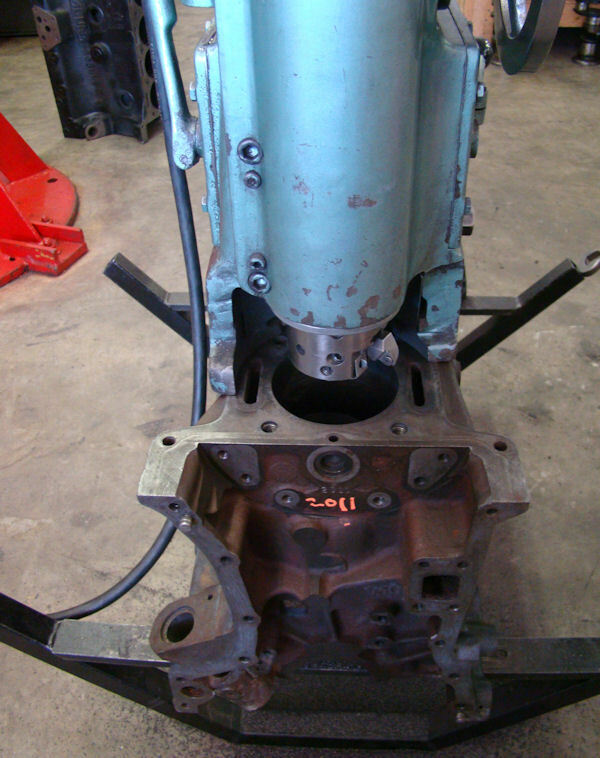 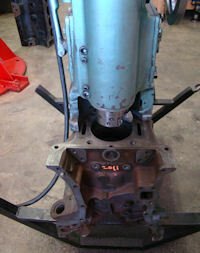 We have now completed the repair and rebuild of your cylinder head, and will be assembling the block next week. 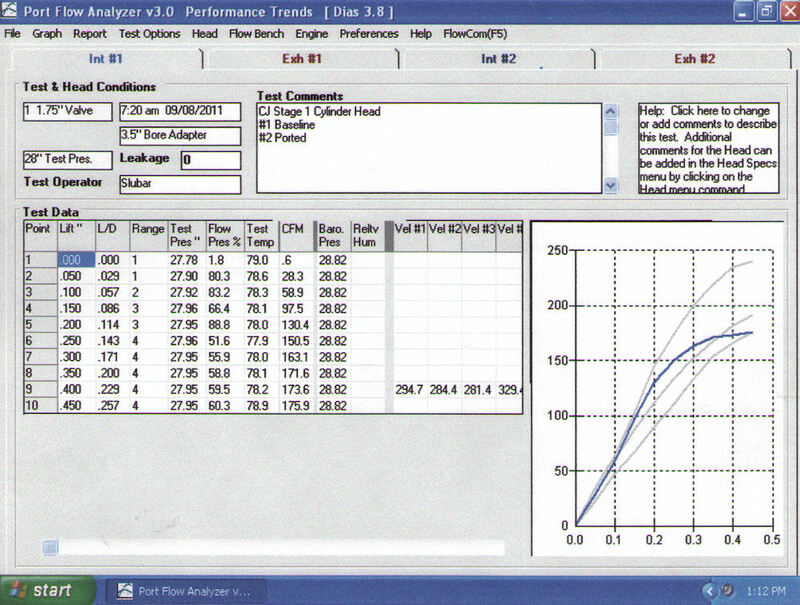 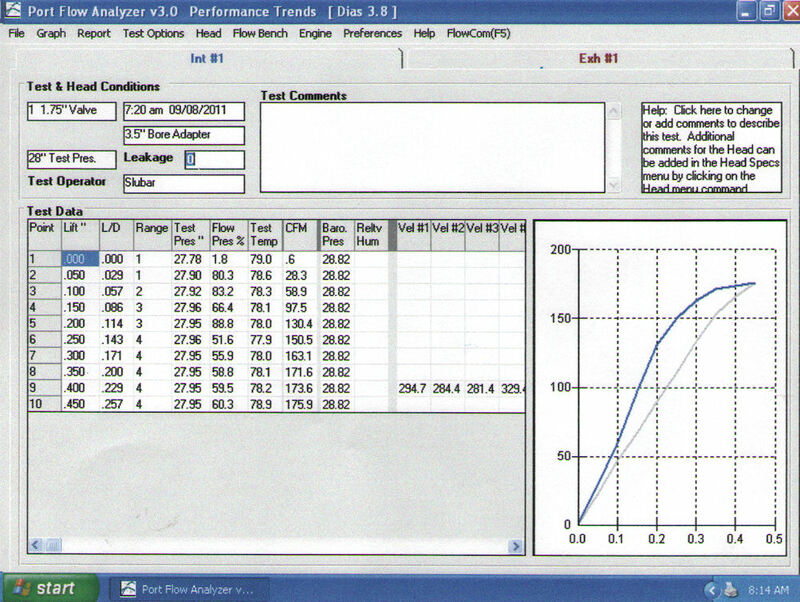 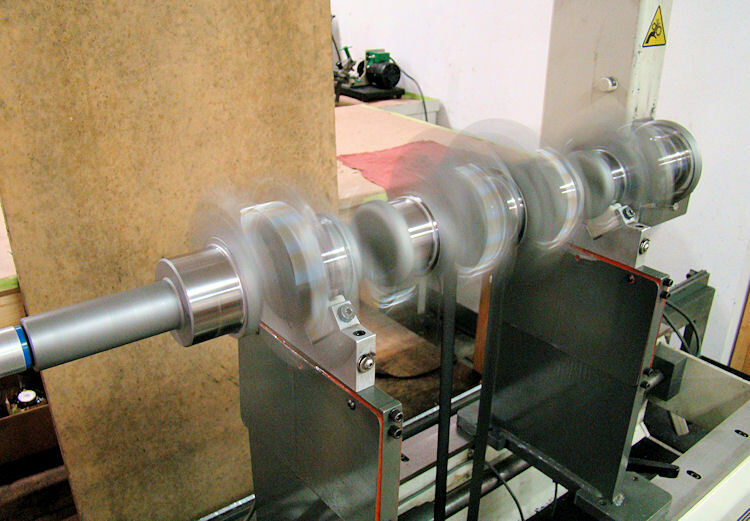 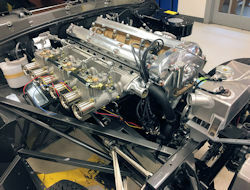 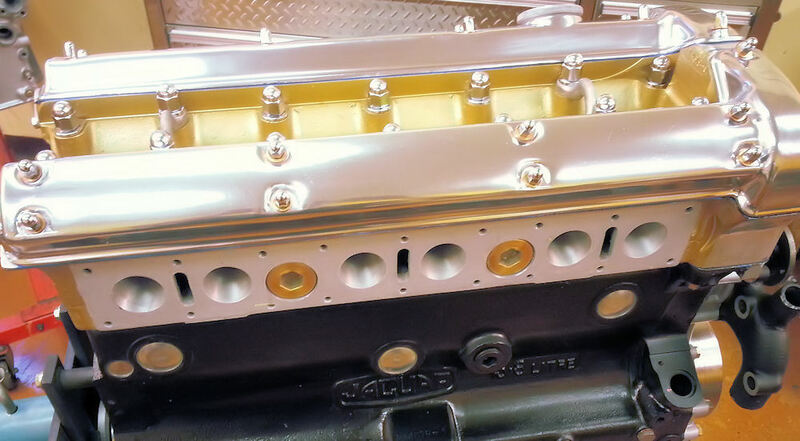 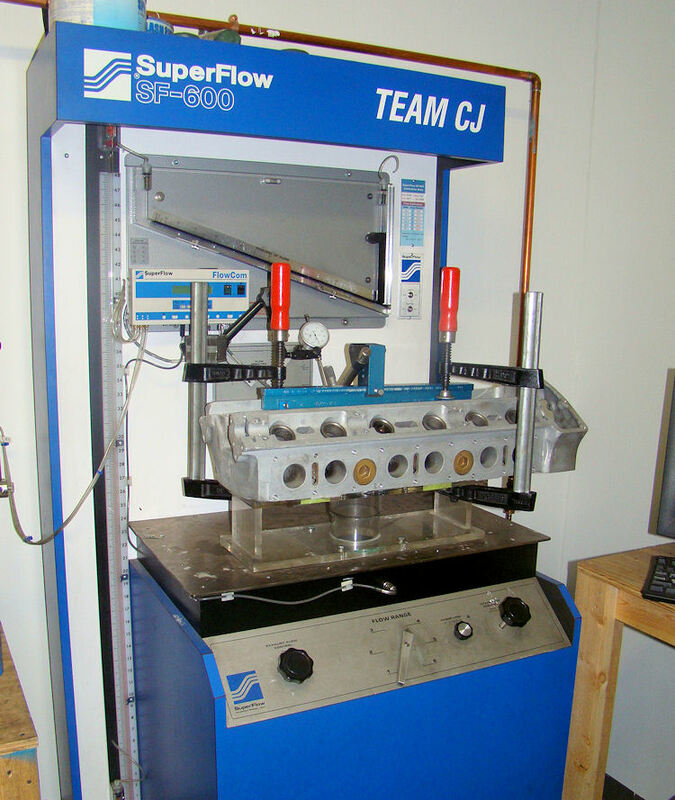 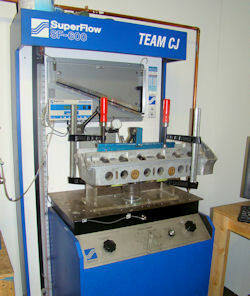 I am pleased to report that Chris has now finished all of the machine work and porting to your cylinder head, and we saw some huge gains on the flow bench. 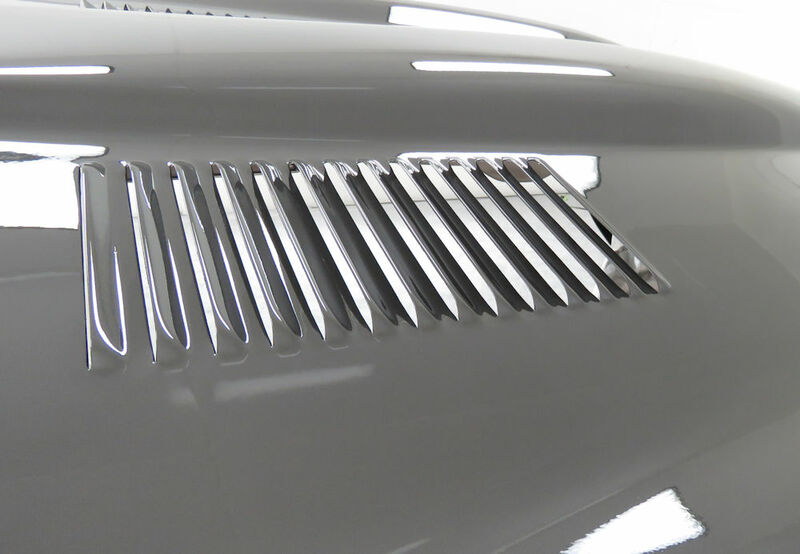 We actually picked up more than 64 cfm on the intake runners, which represents a spectacular improvement in flow. You picked up 64.3 cfm - which is a spectacular gain! The following sequence of photos show Chris rebuilding your IRS and Kevin doing your engine block machine work. 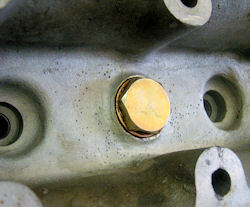 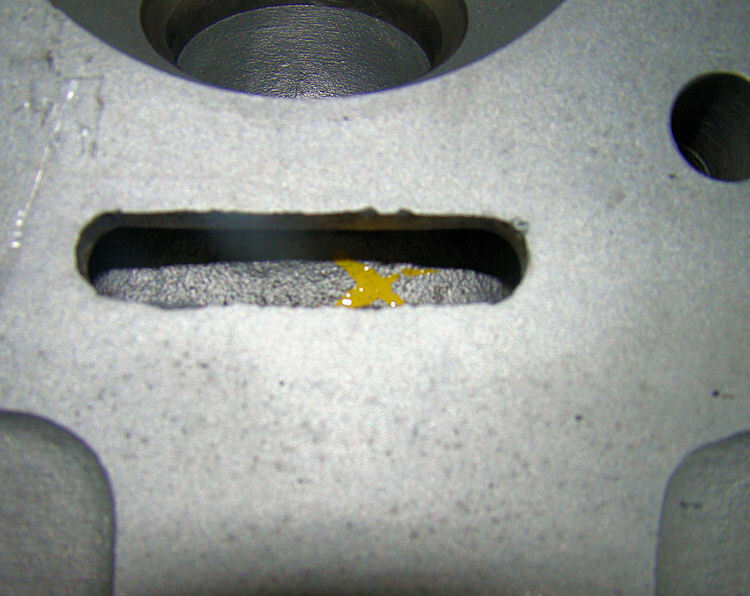 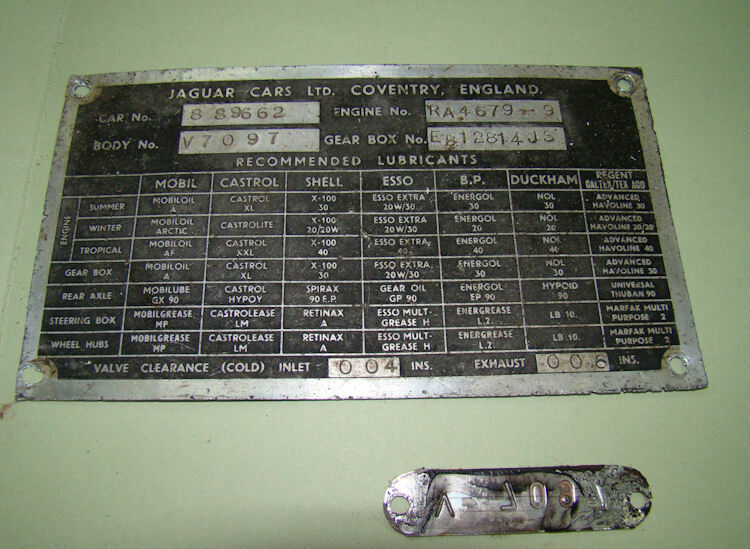 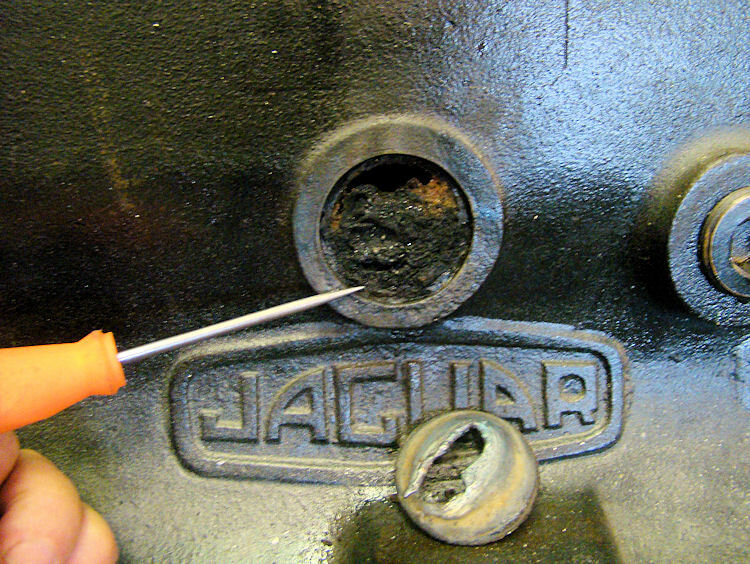 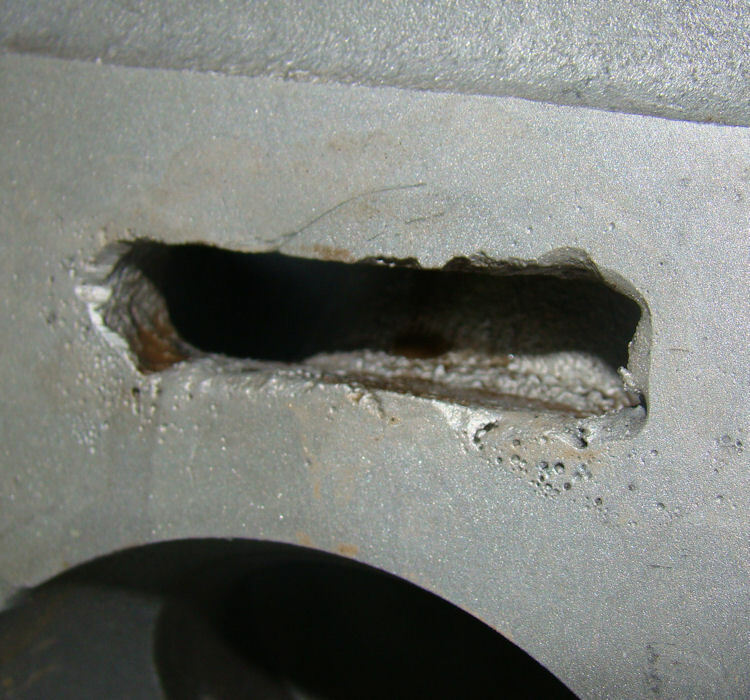 I am pleased to report that we have now finished repairing all the various cracks and corroded areas on your cylinder head. 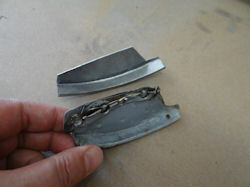 It is a while since we have seen one that was quite this bad. 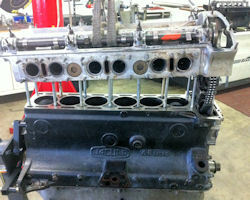 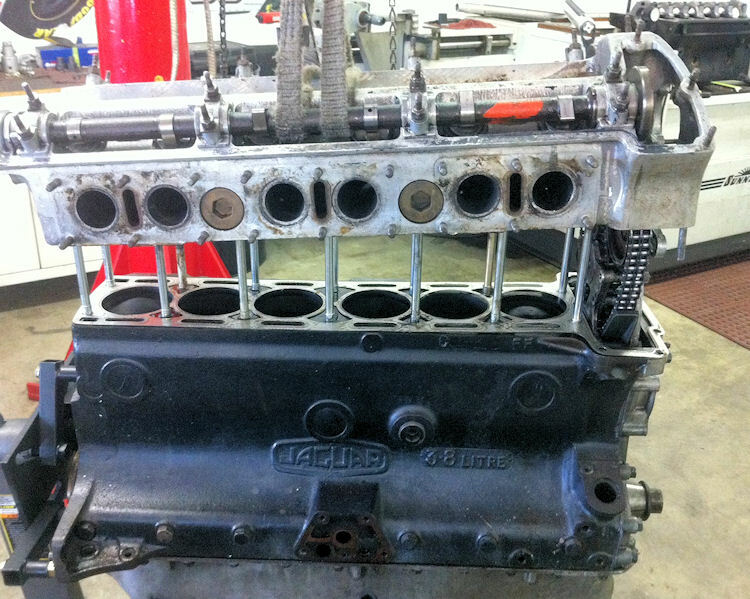 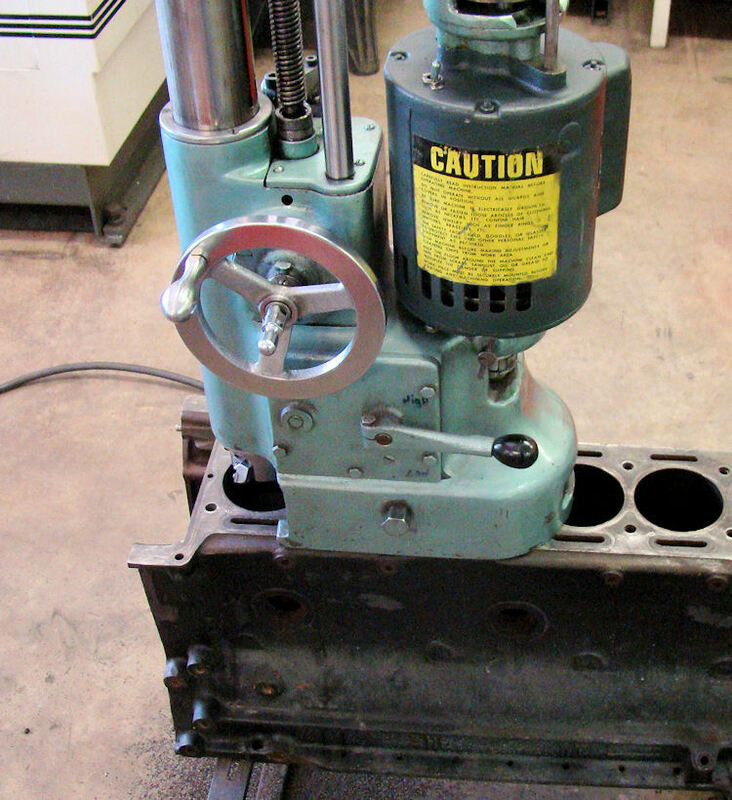 We have our work cut out for us with this cylinder head rebuild. 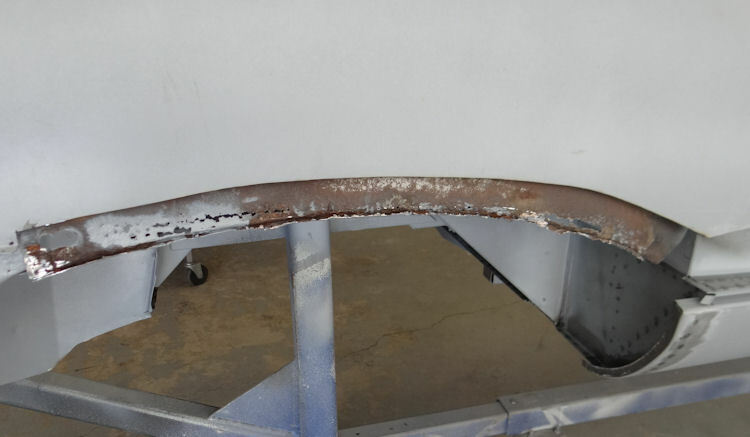 It really is in terrible shape and needs extensive weld repairs to deal with corrosion damage, stripped out threads, cracks and internal porosity issues. 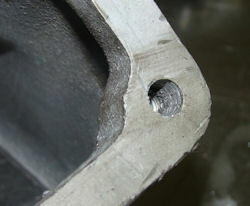 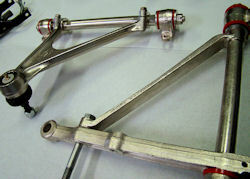 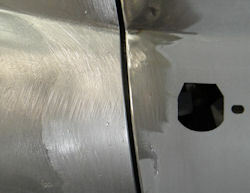 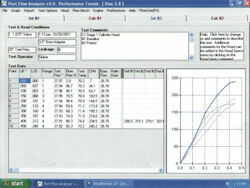 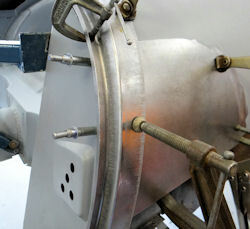 It has also had cam caps installed backwards, damaged cam saddles and is significantly warped. 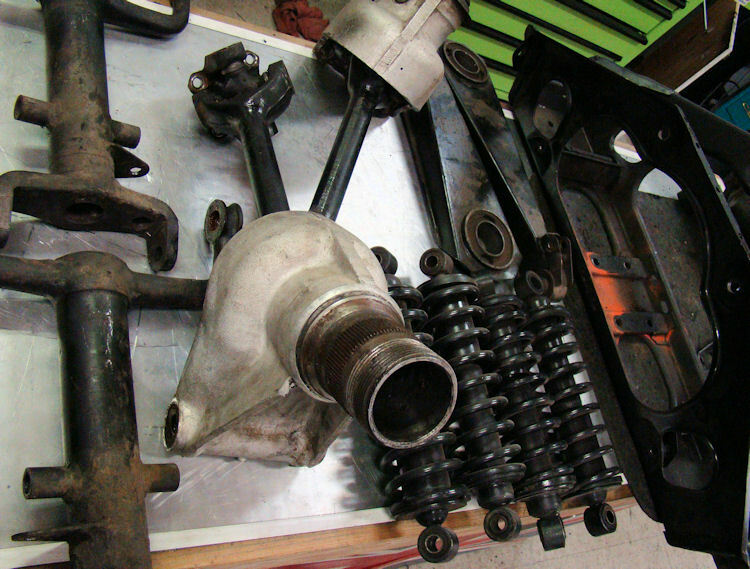 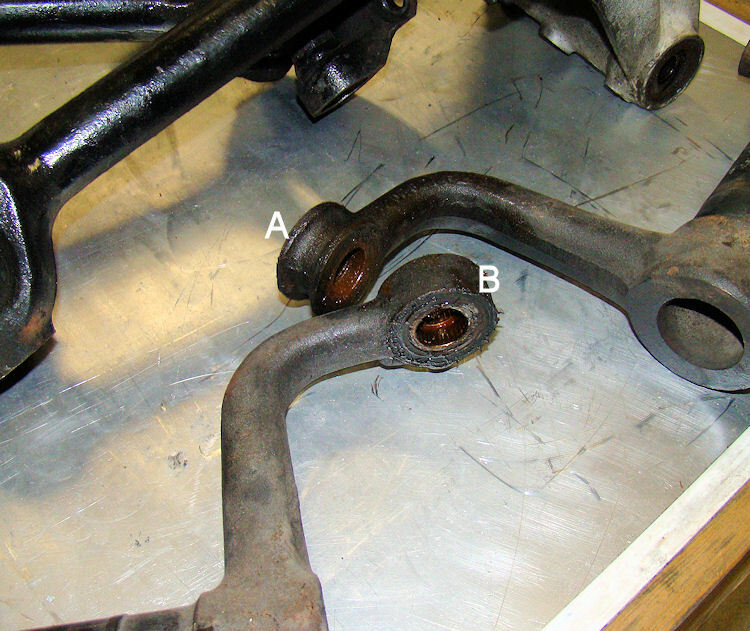 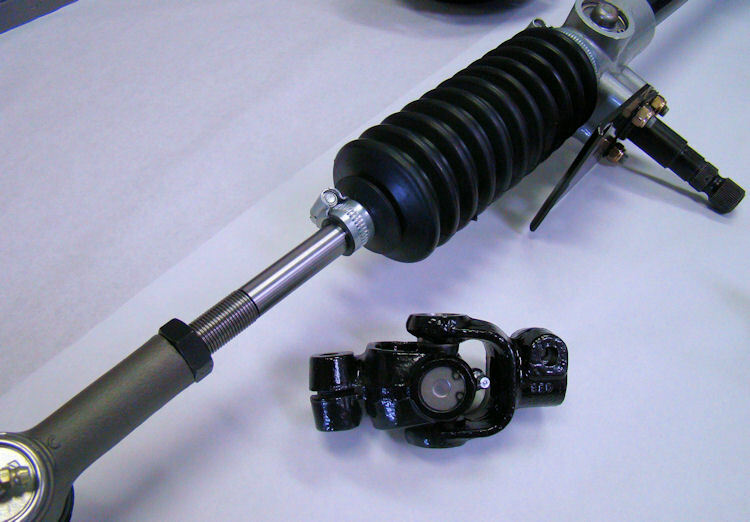 Rebuilding front suspension, brakes, steering rack, steering column, etc. 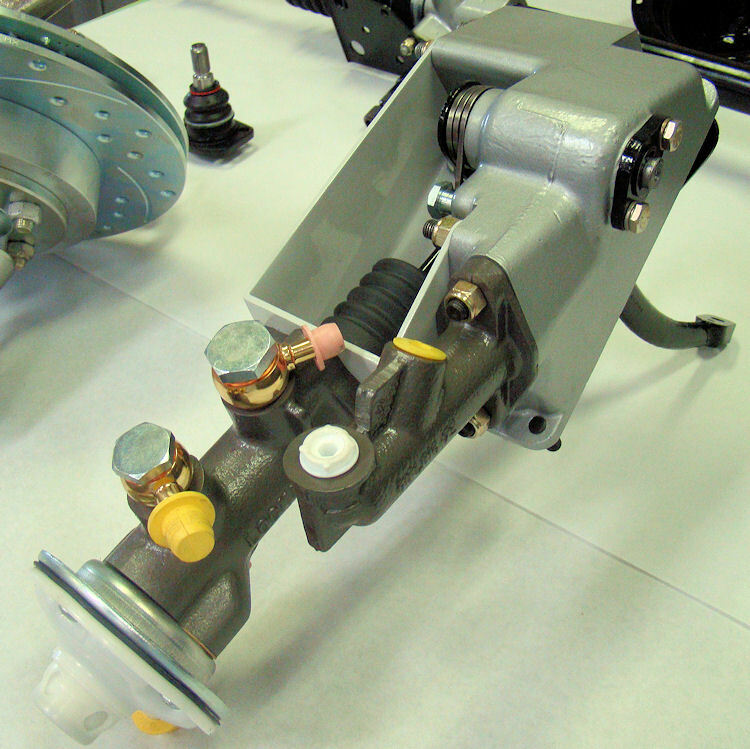 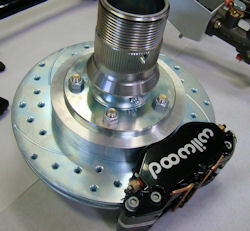 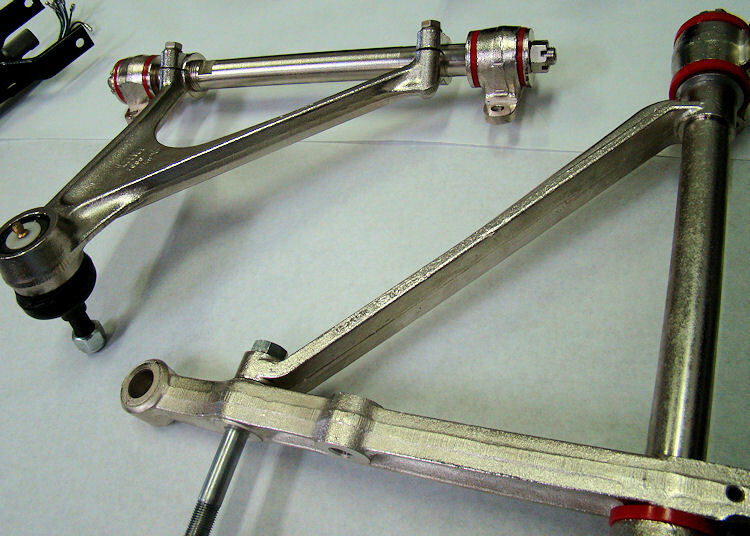 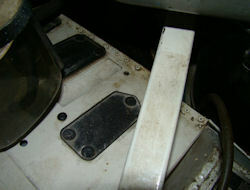 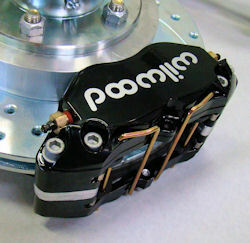 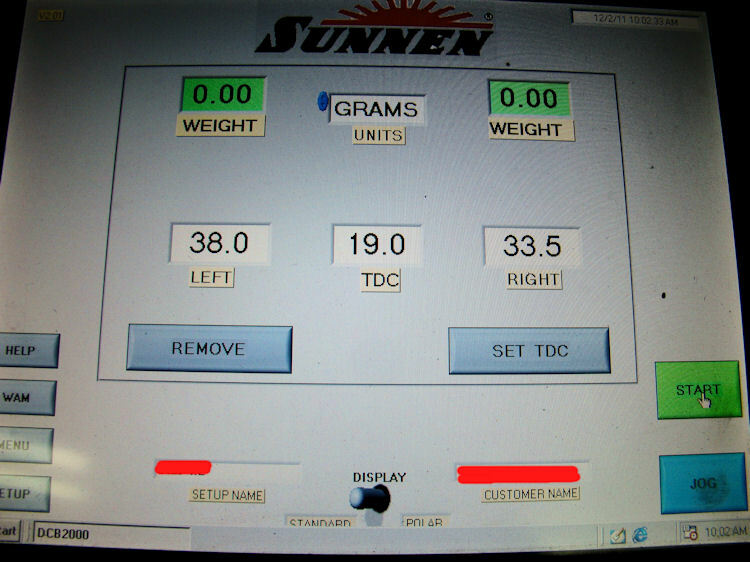 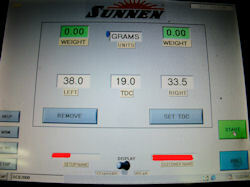 Pedal box has been converted to use upgraded brake master cylinder and booster from later 4.2 and V12 models. 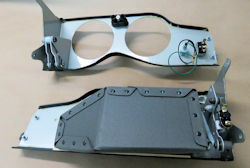 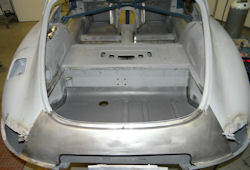 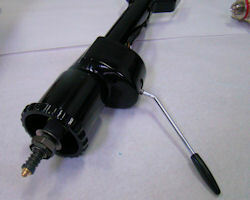 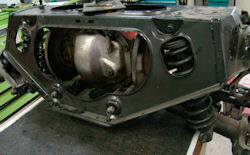 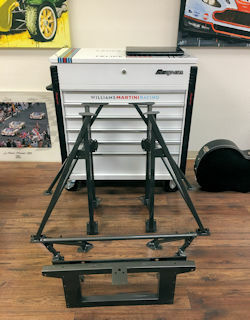 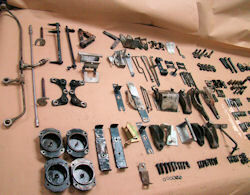 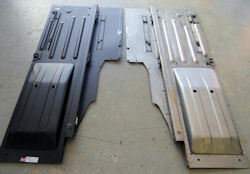 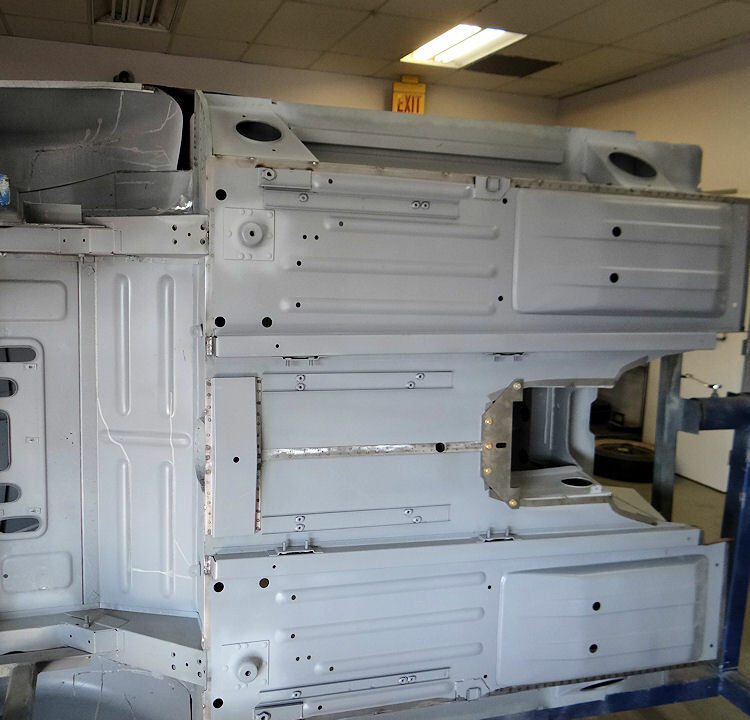 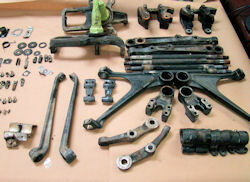 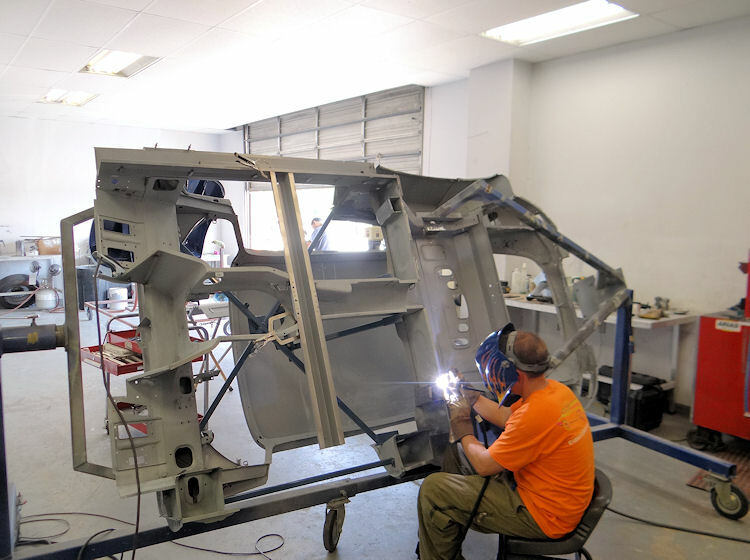 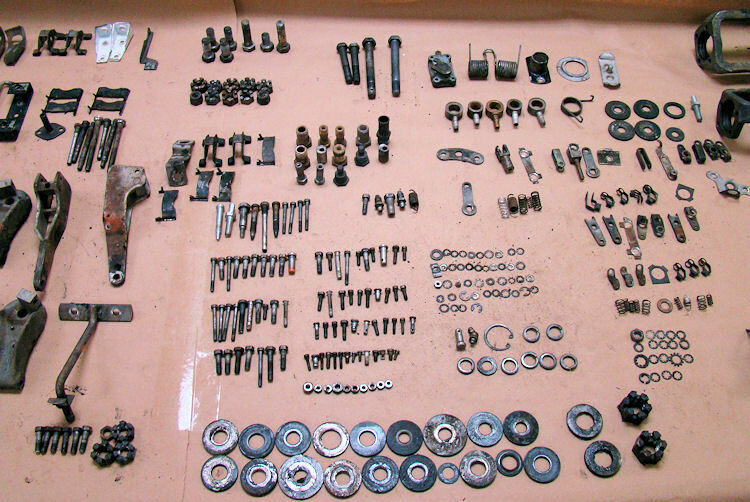 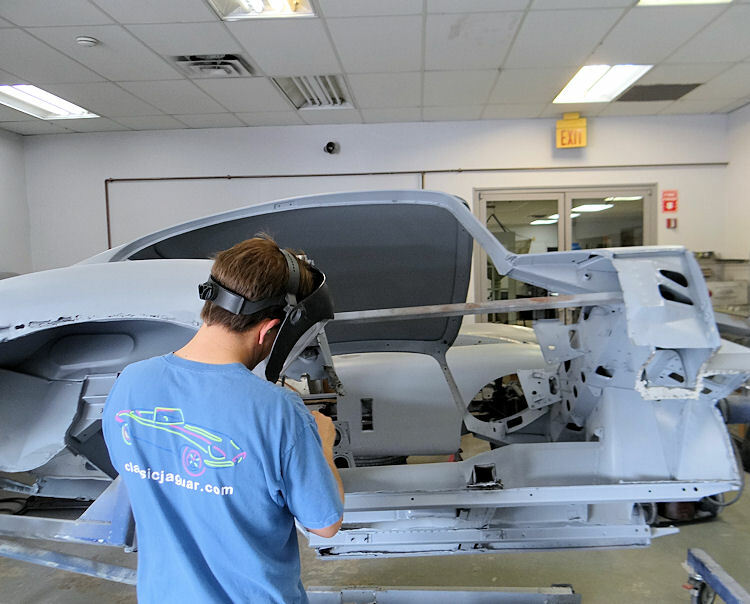 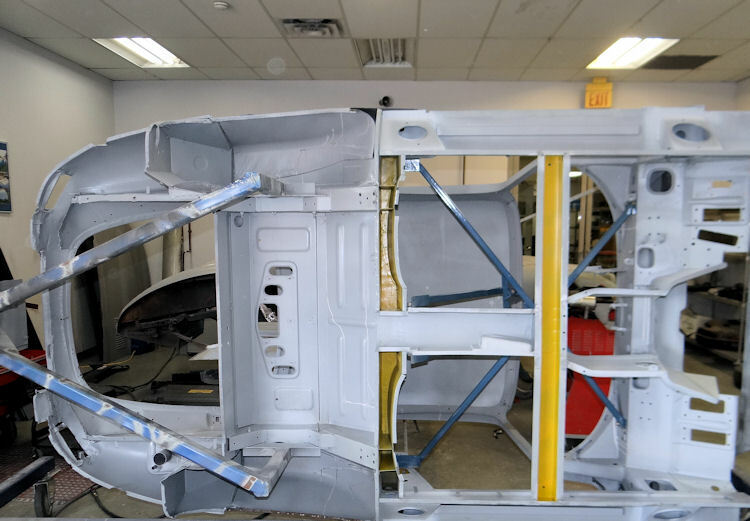 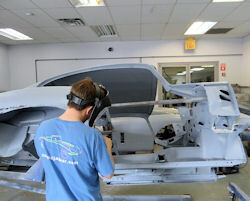 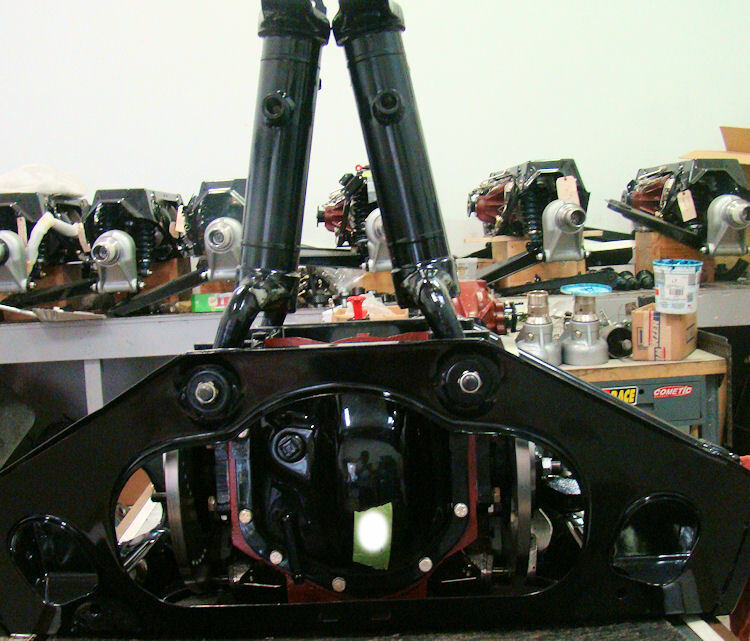 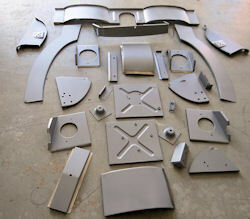 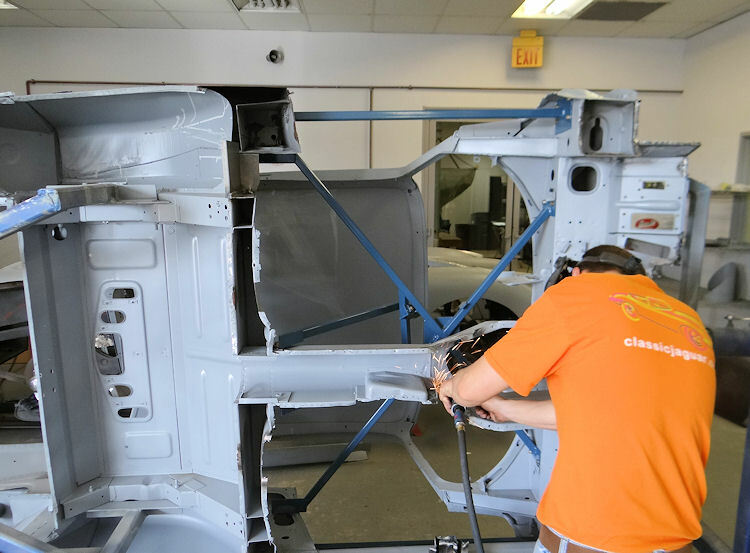 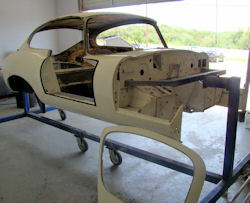 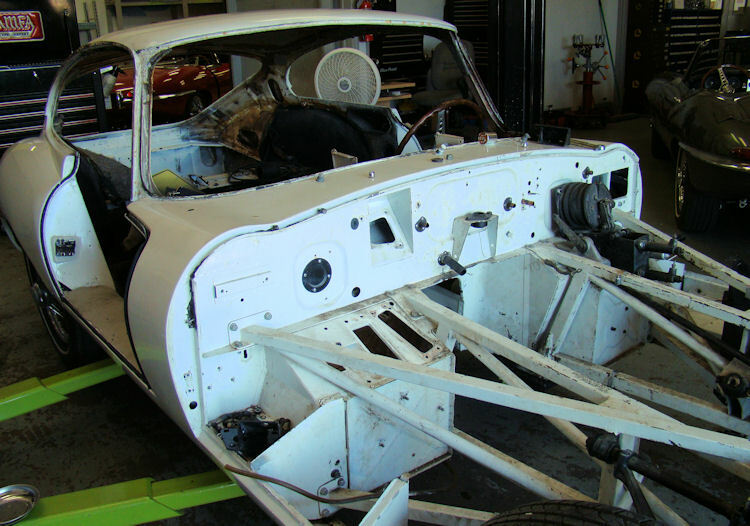 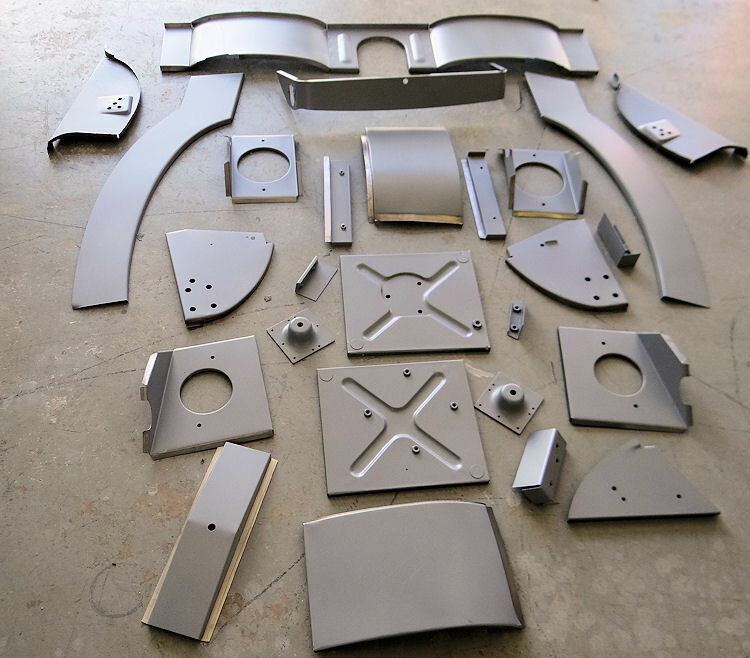 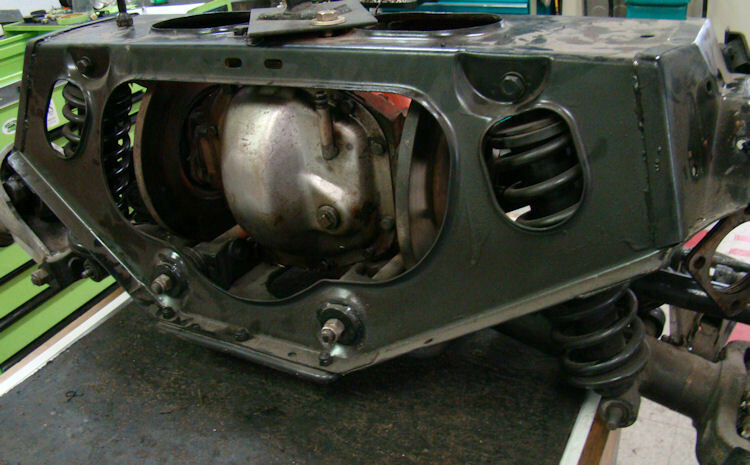 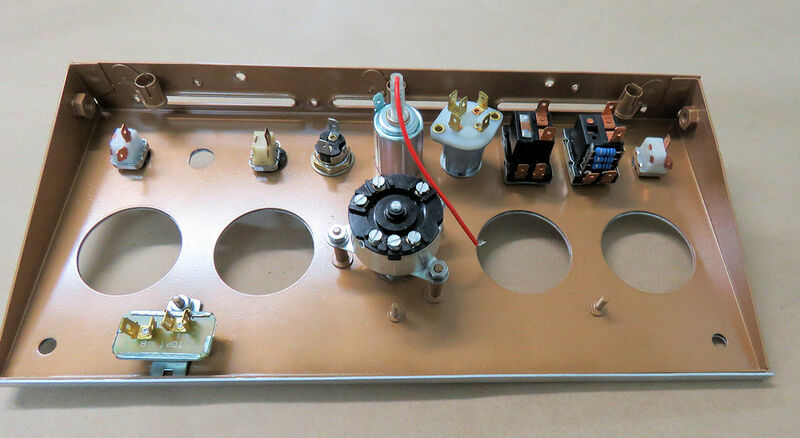 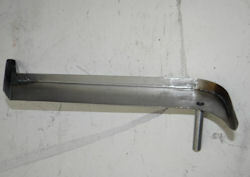 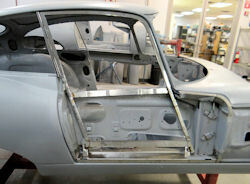 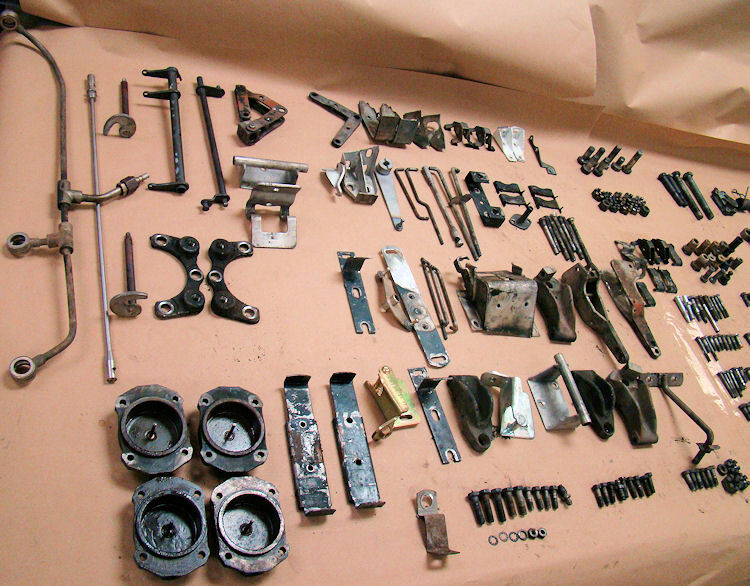 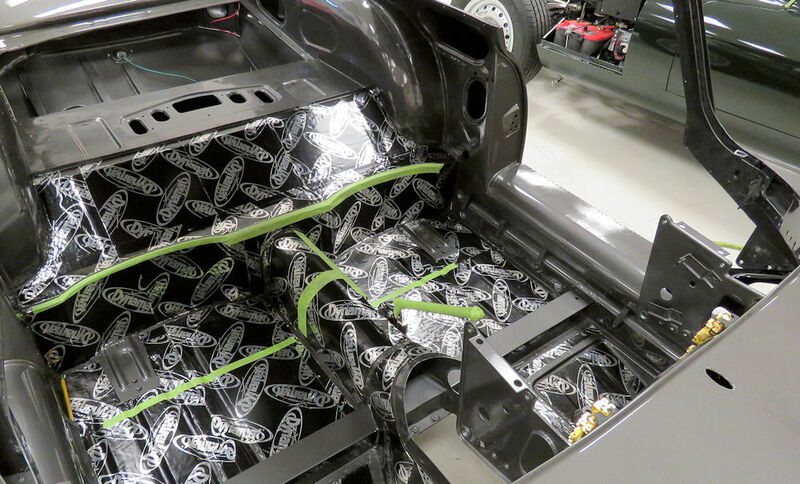 We now have your car completely disassembled and ready to be placed on one of the rotisserie jigs. 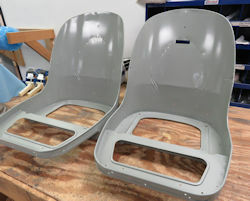 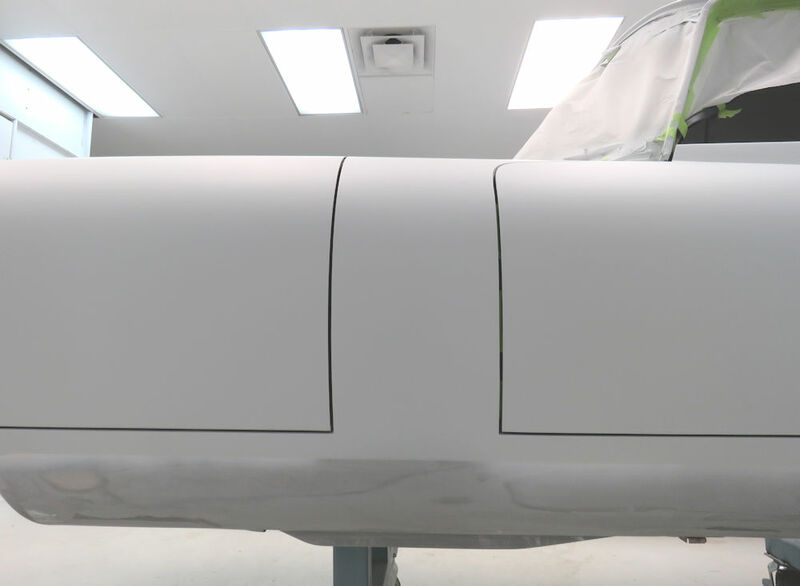 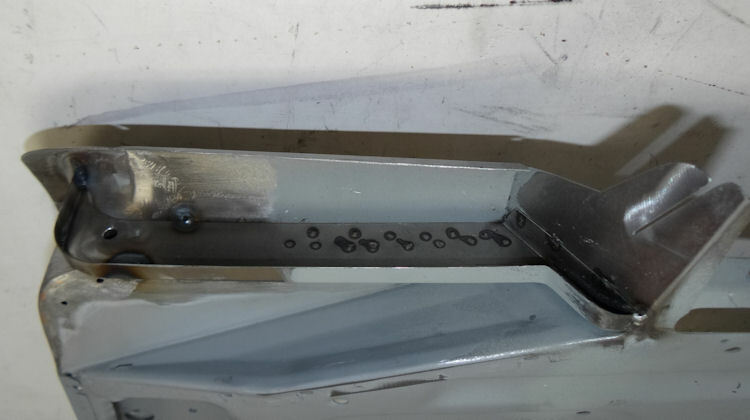 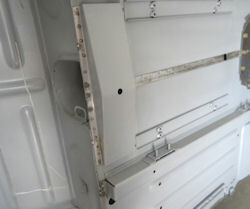 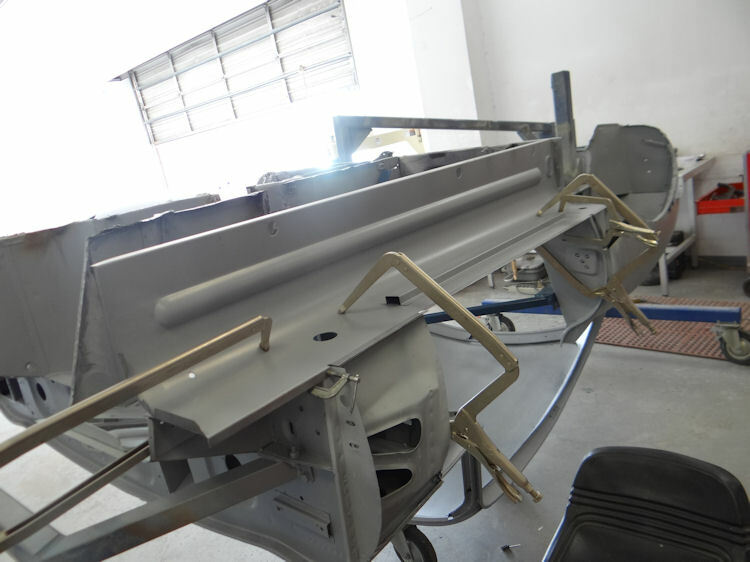 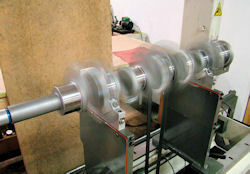 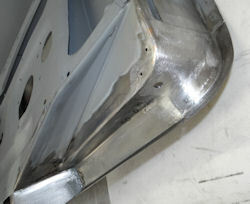 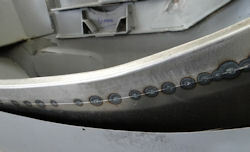 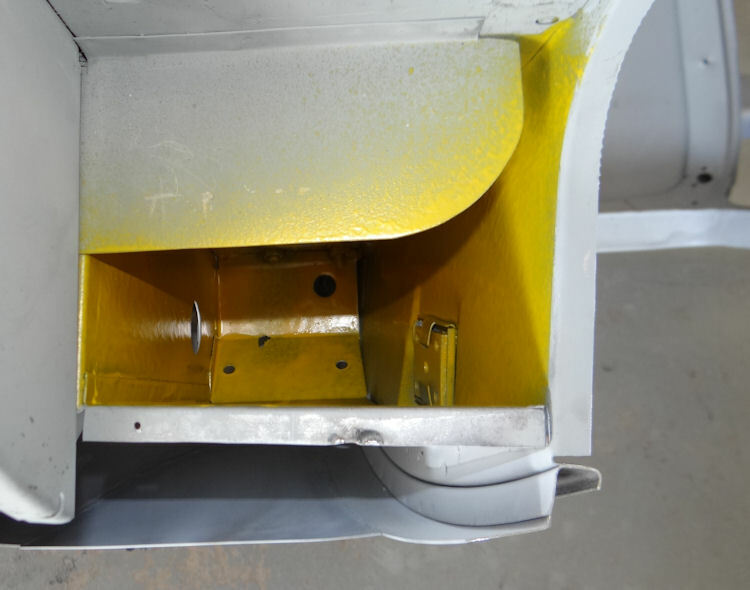 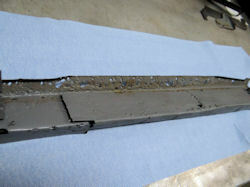 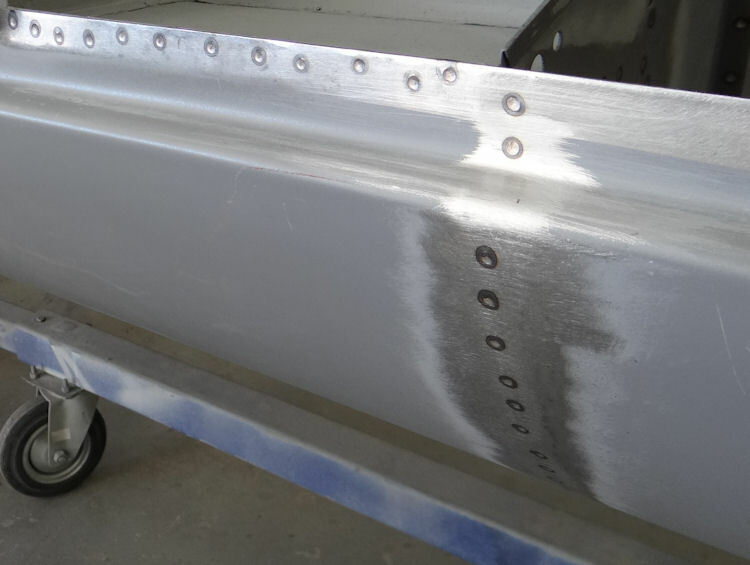 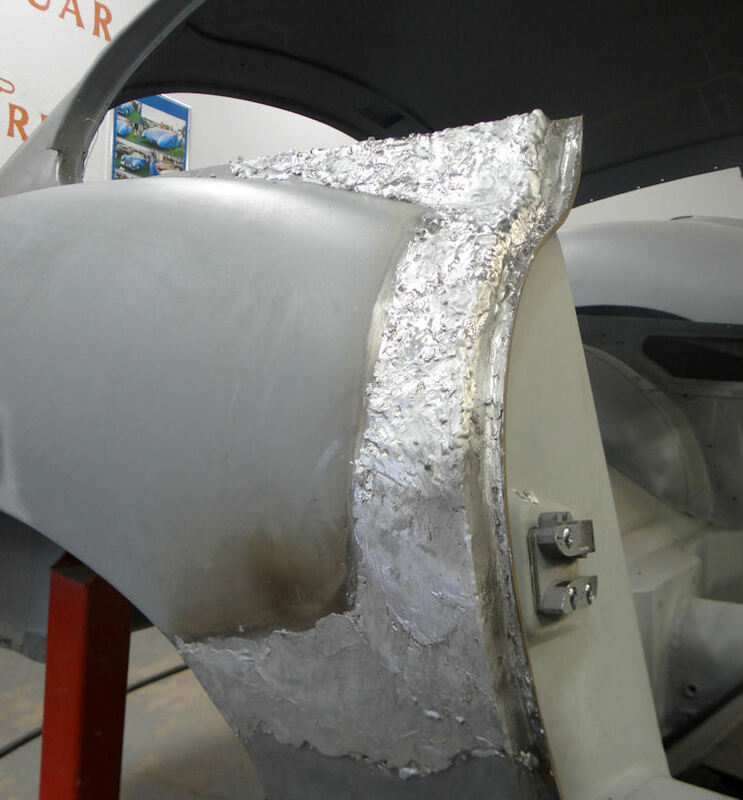 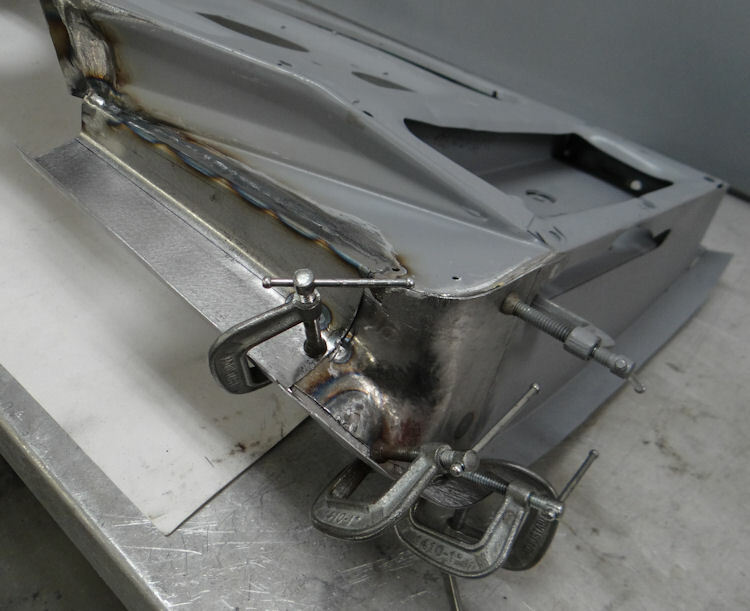 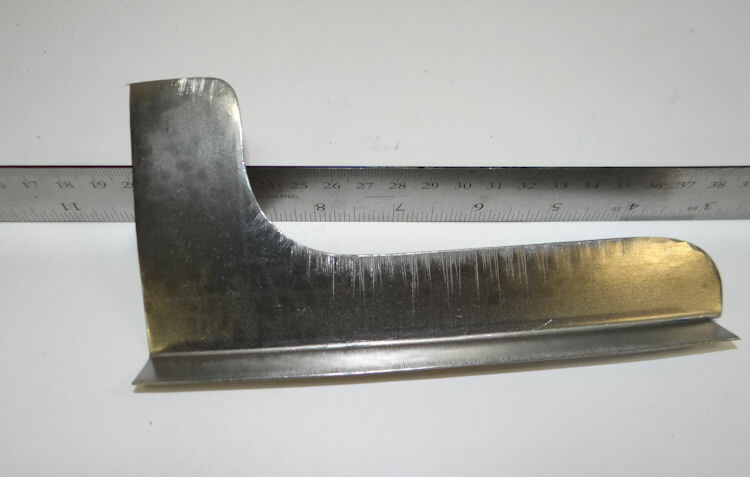 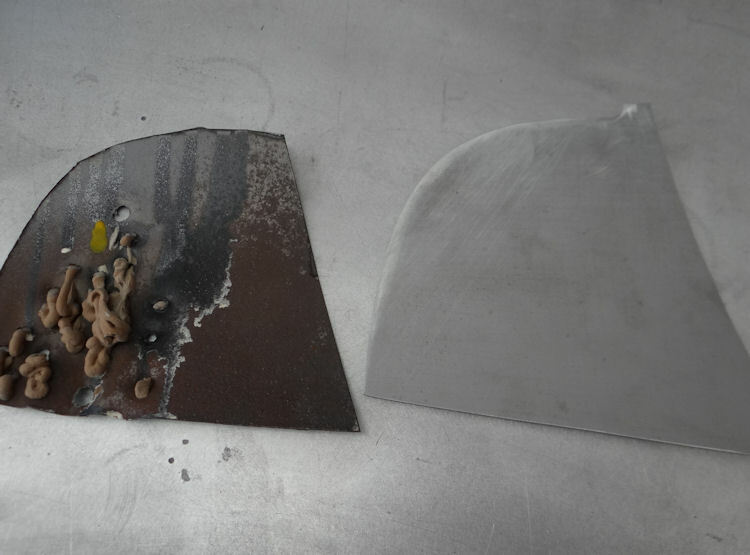 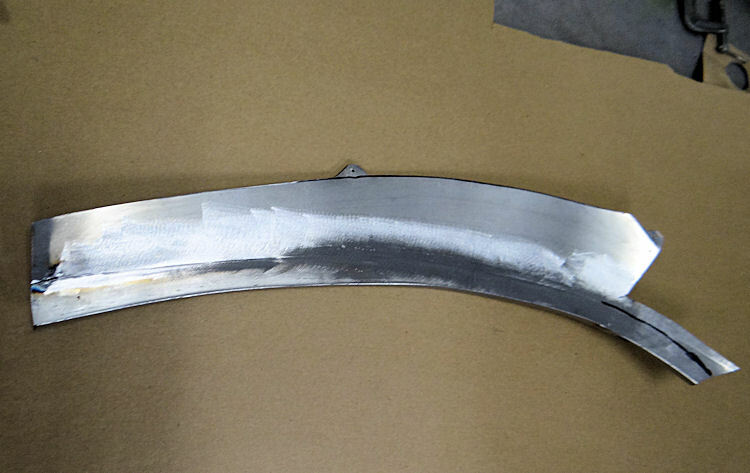 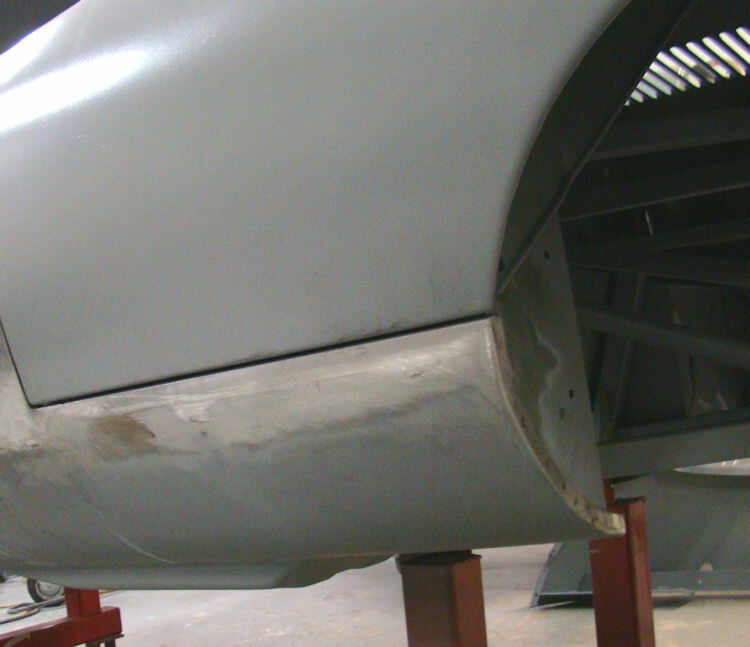 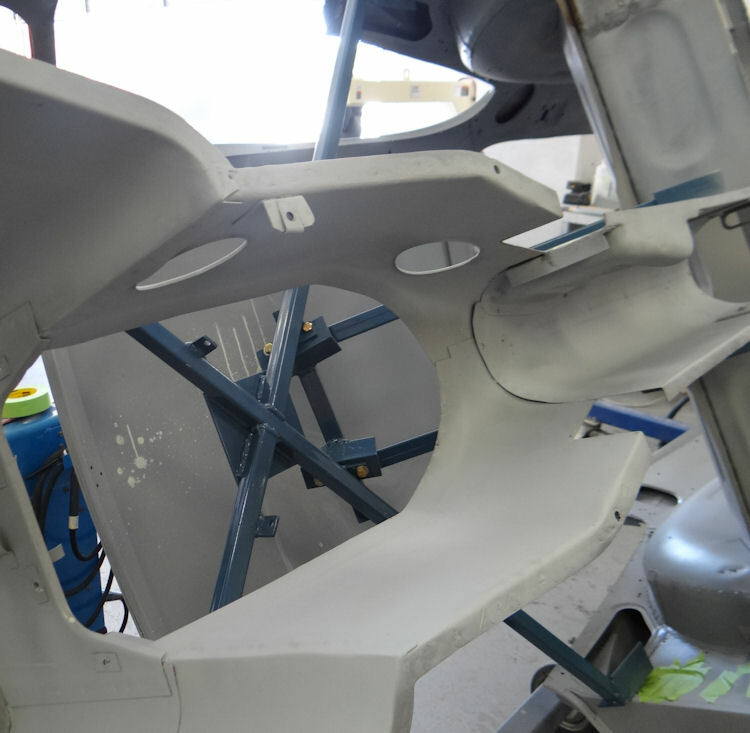 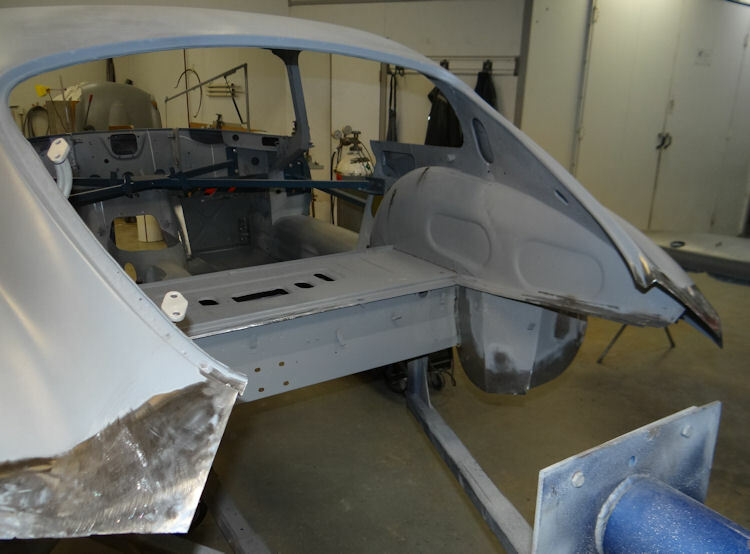 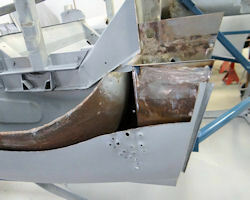 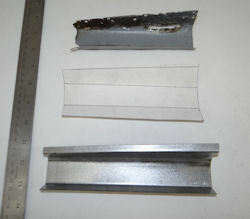 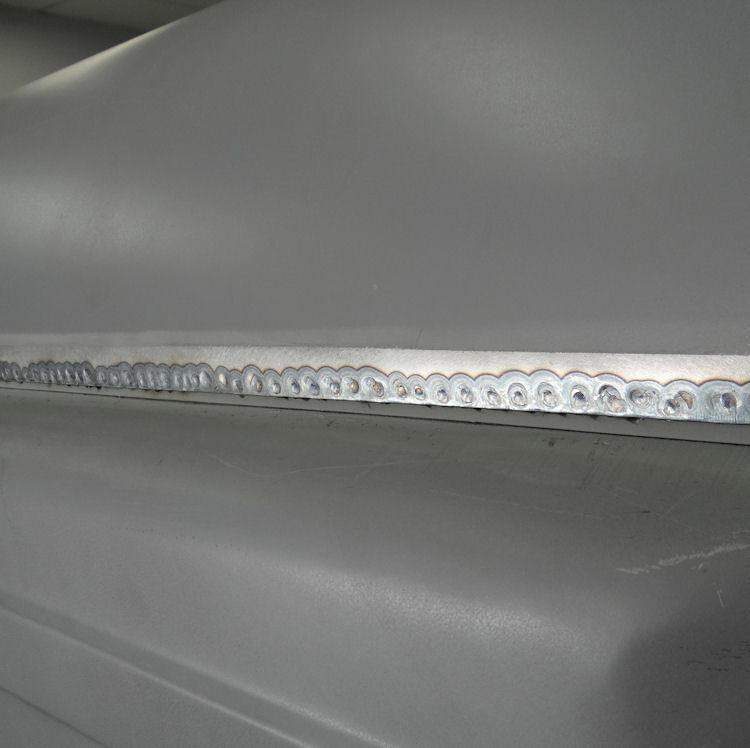 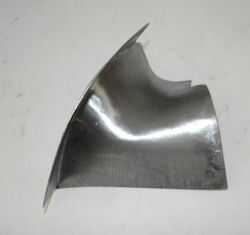 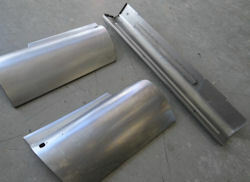 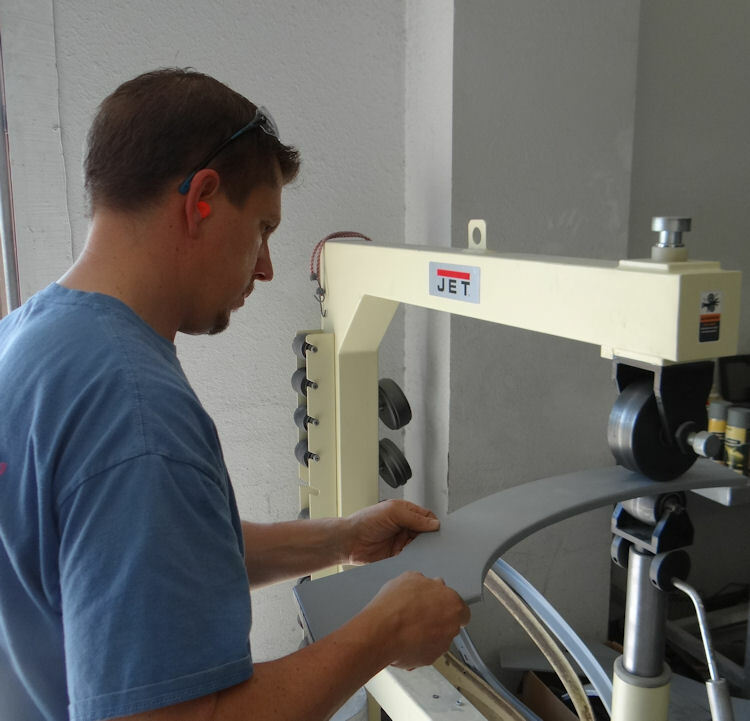 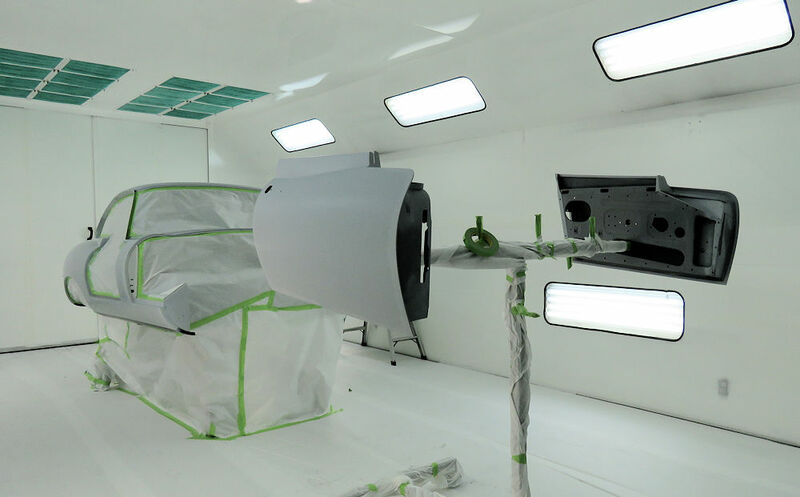 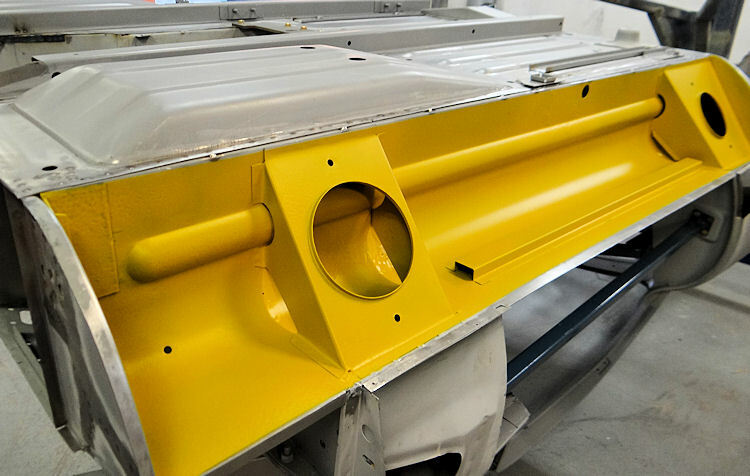 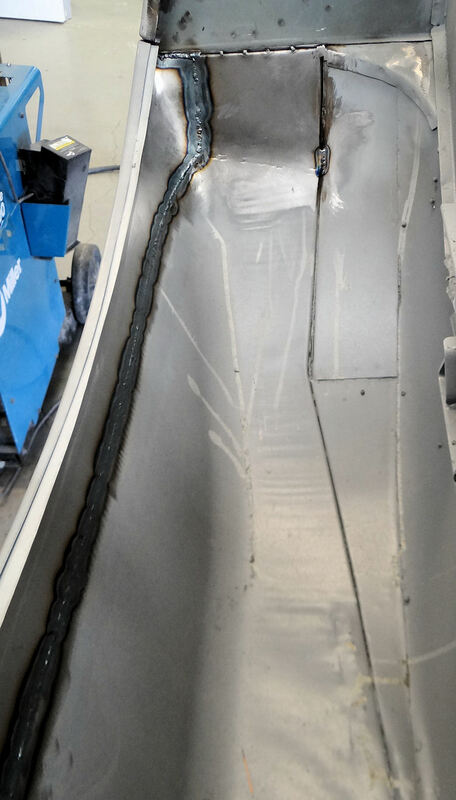 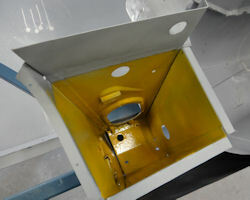 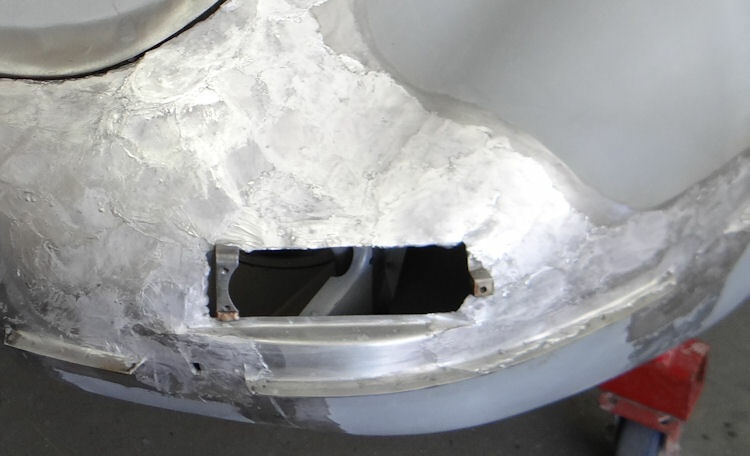 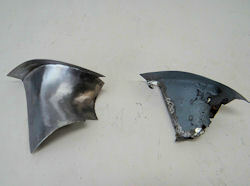 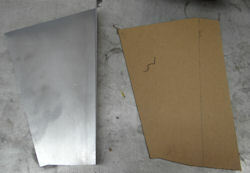 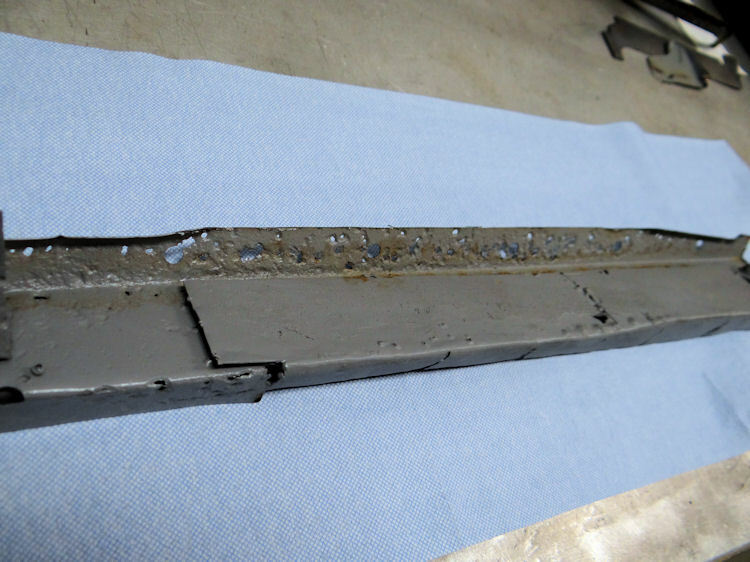 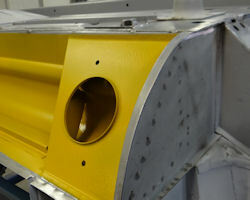 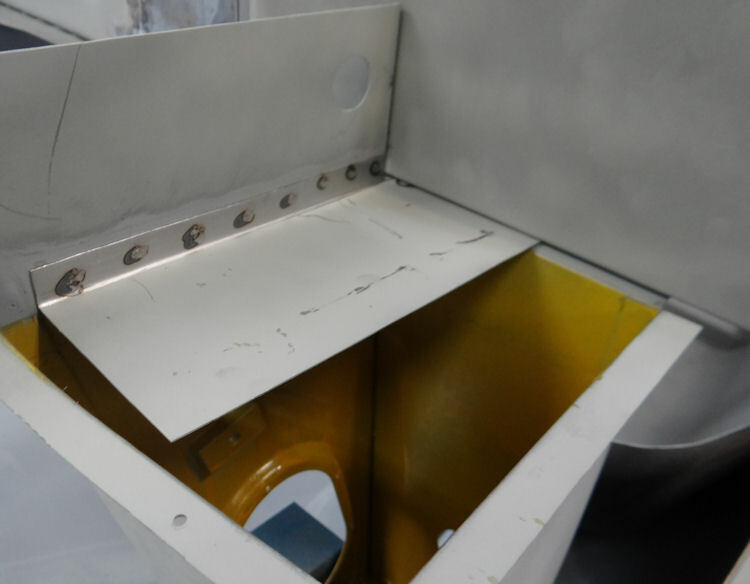 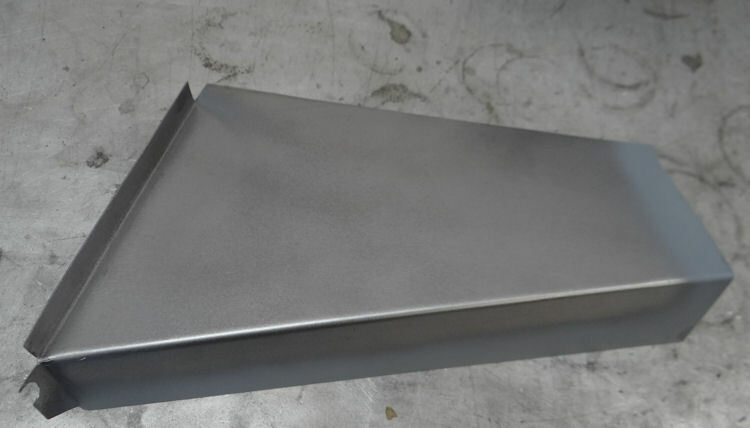 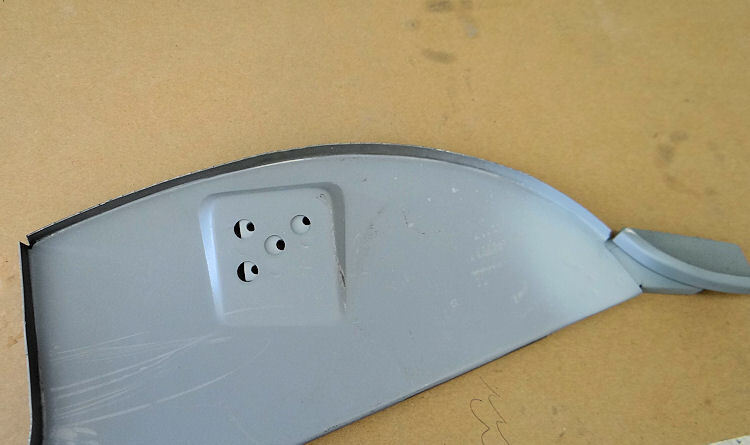 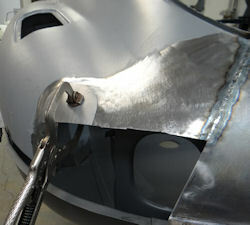 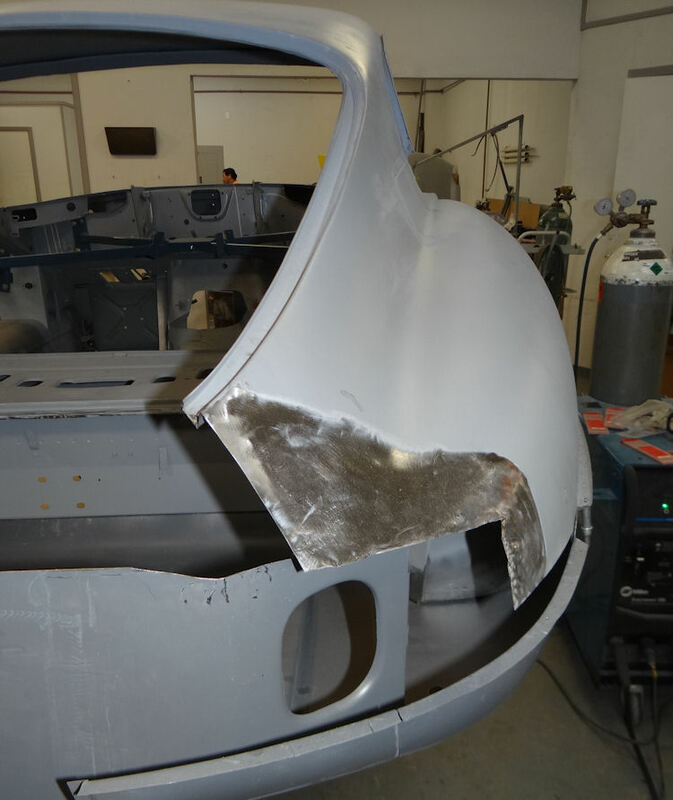 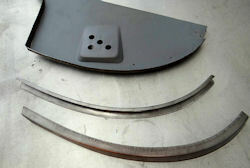 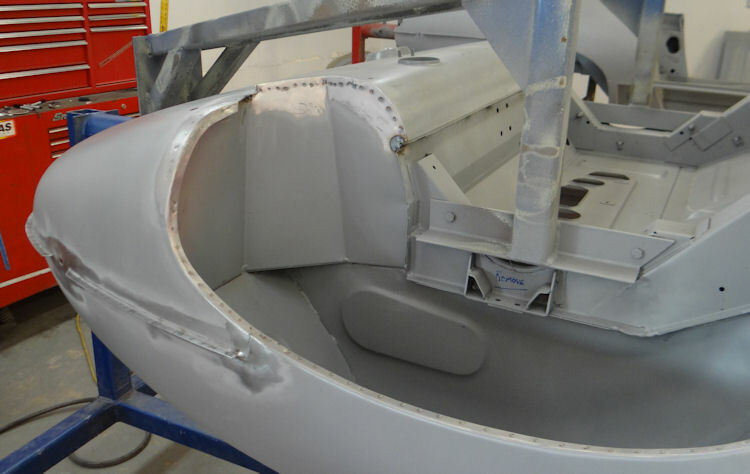 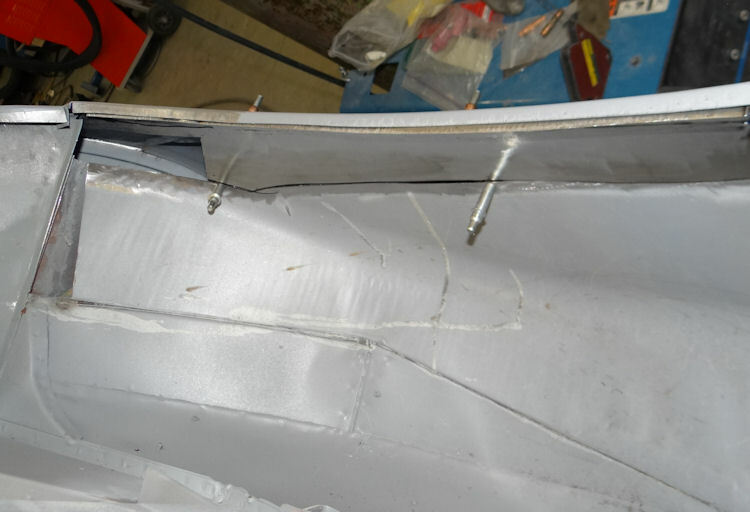 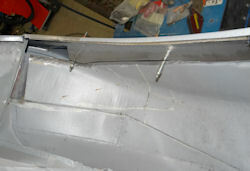 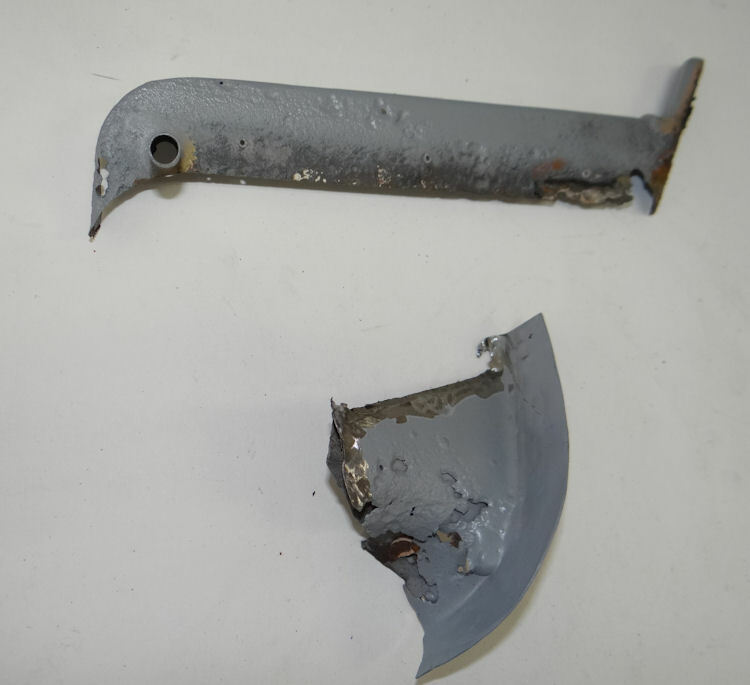 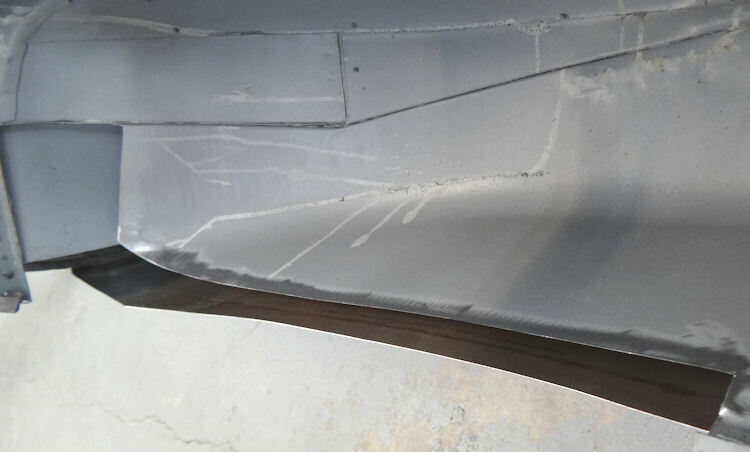 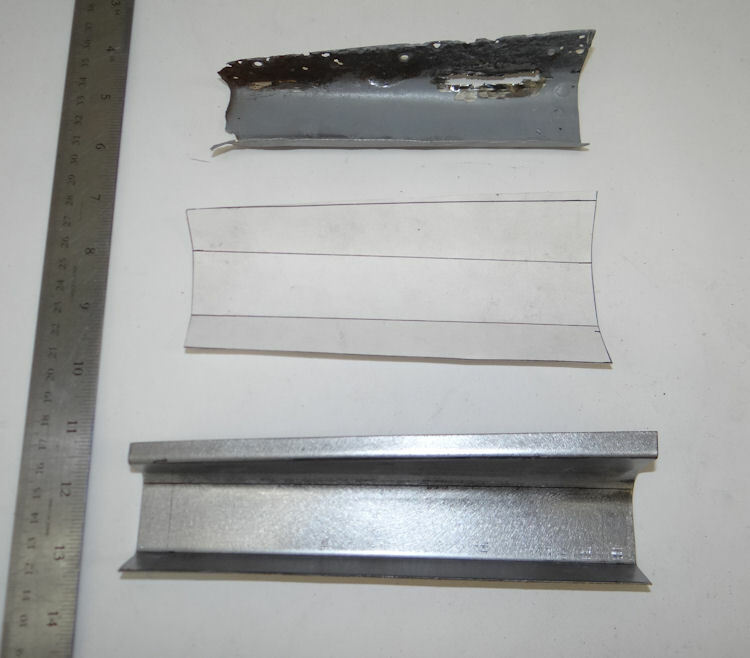 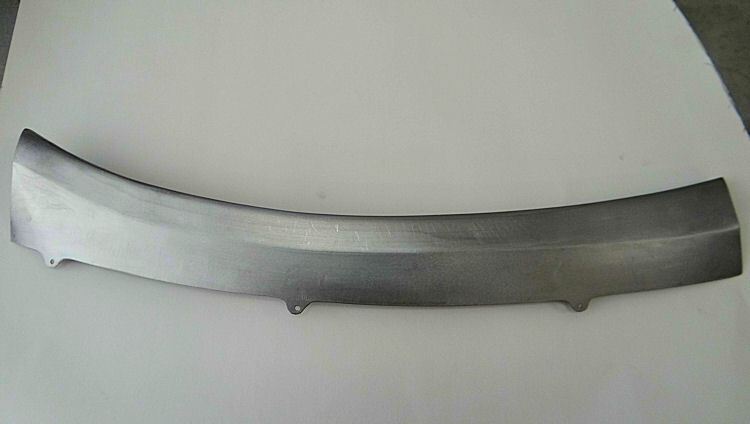 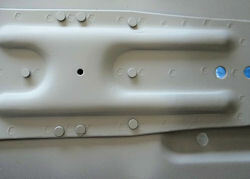 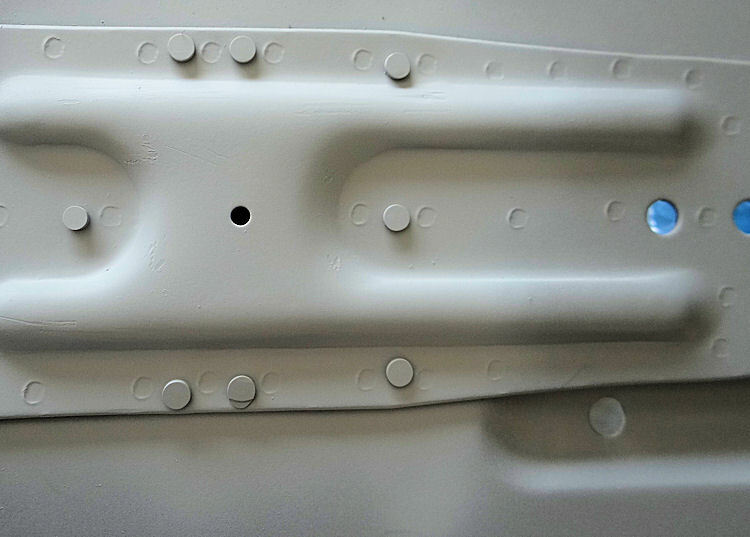 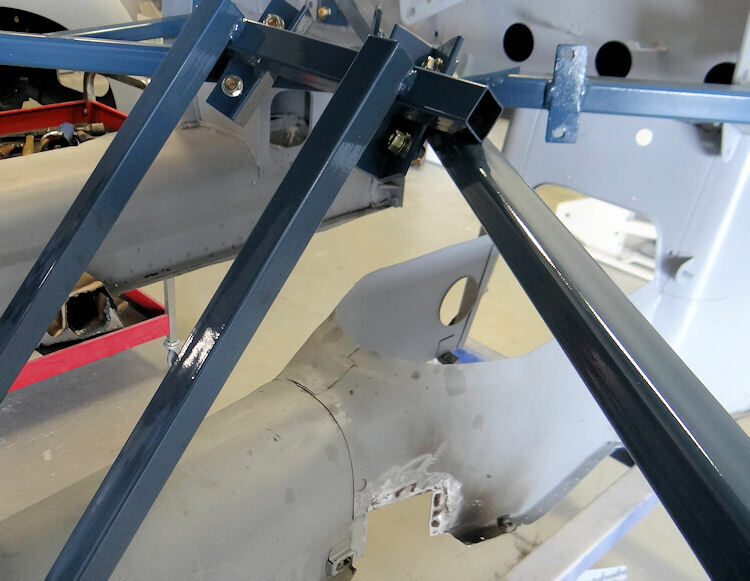 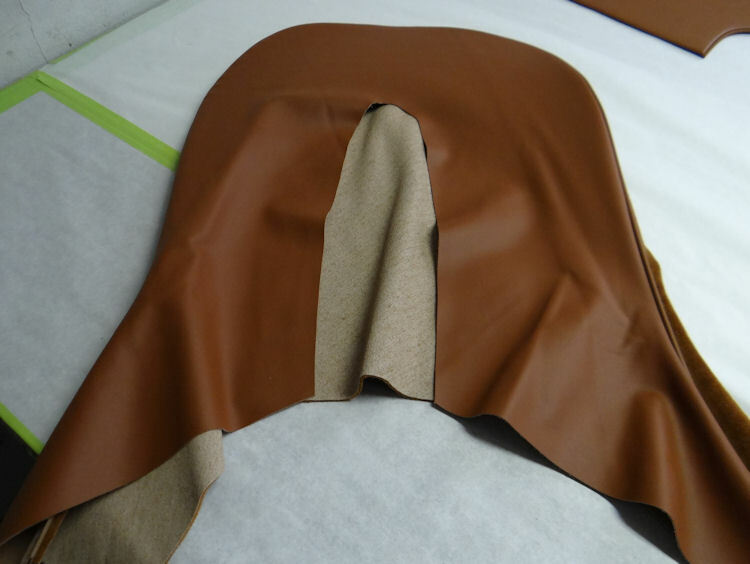 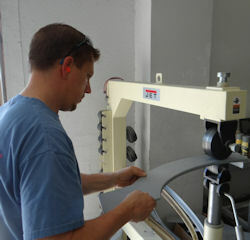 As soon as one becomes available, we will start preparing the monocoque for media blasting. 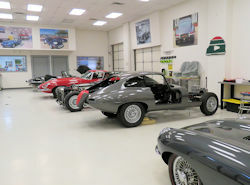 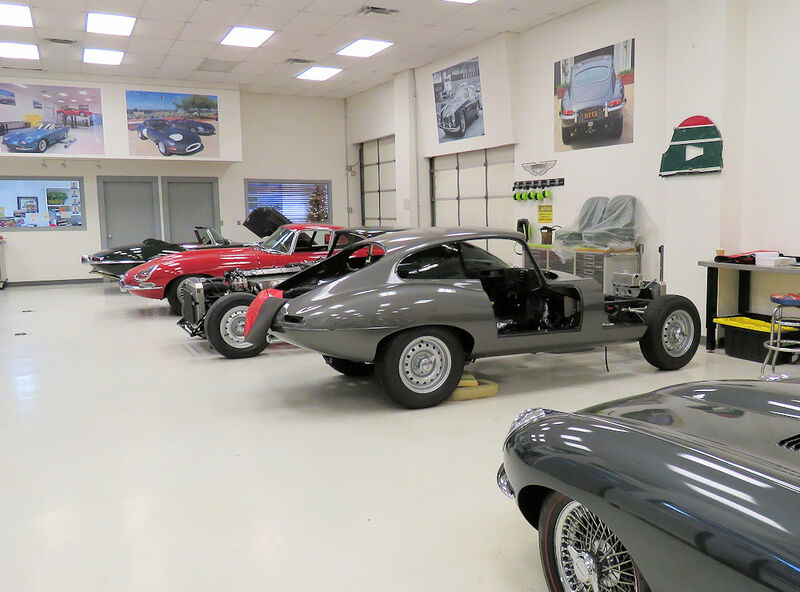 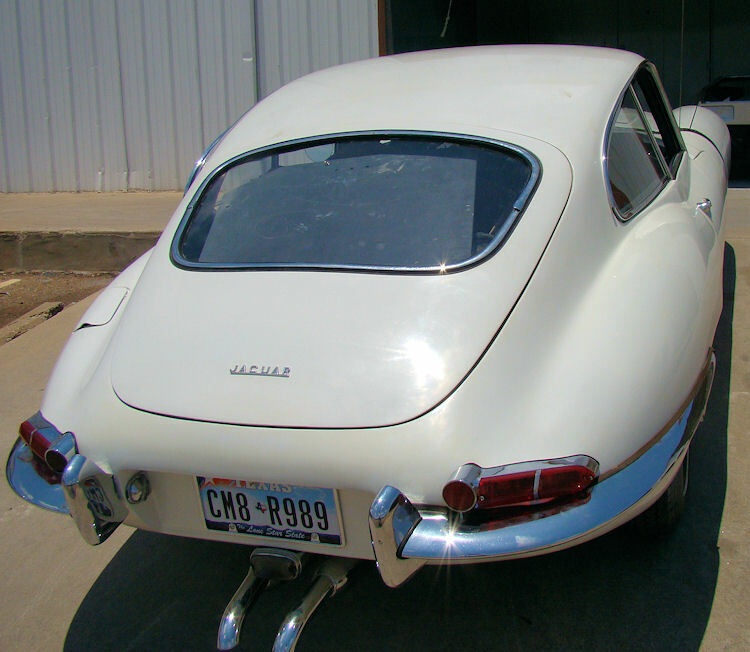 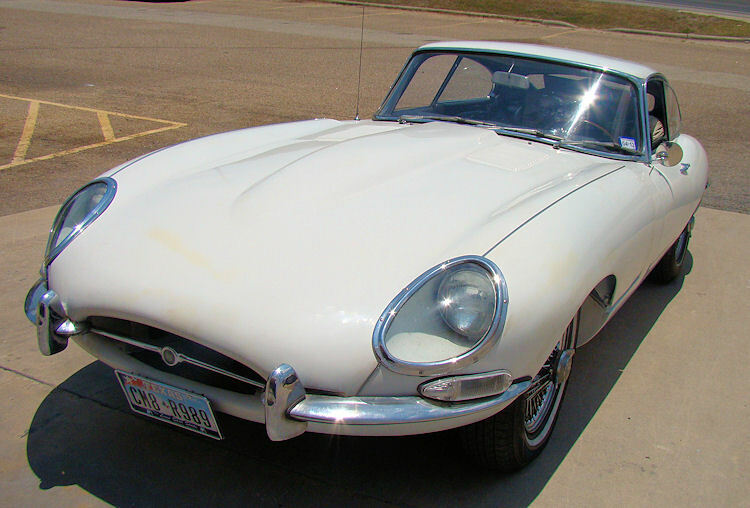 I am pleased to report that your car has arrived safely at Classic Jaguar and we will have the restoration underway in the next few days!